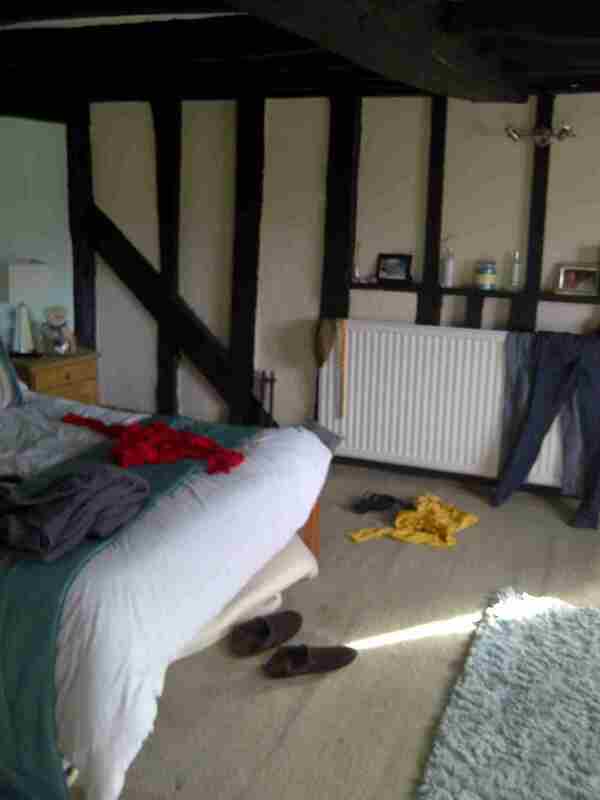 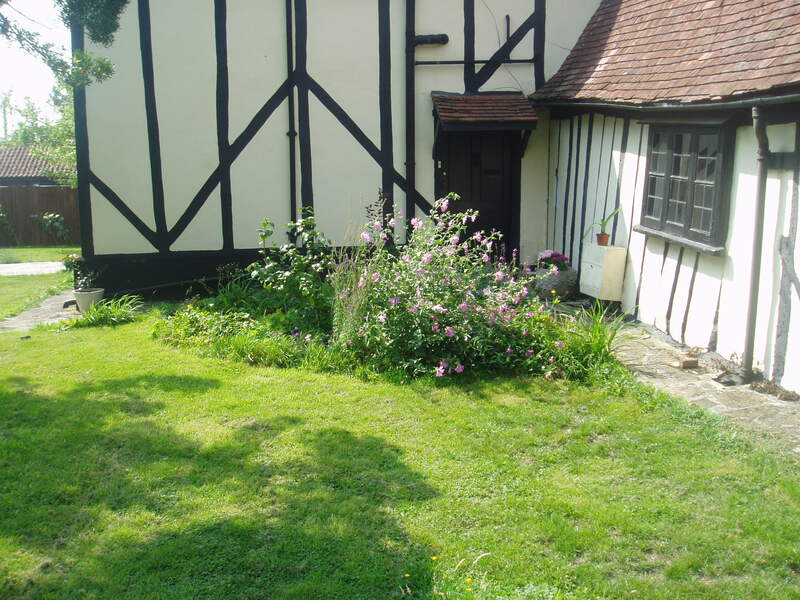 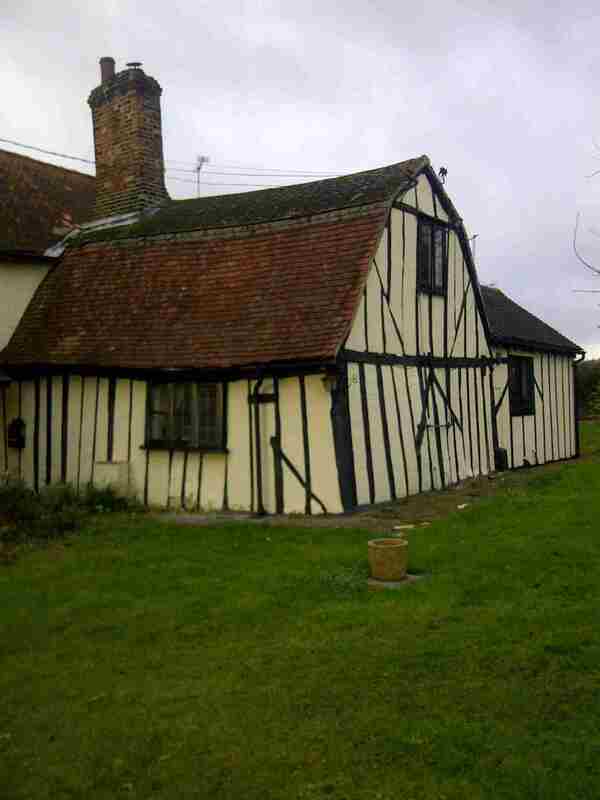 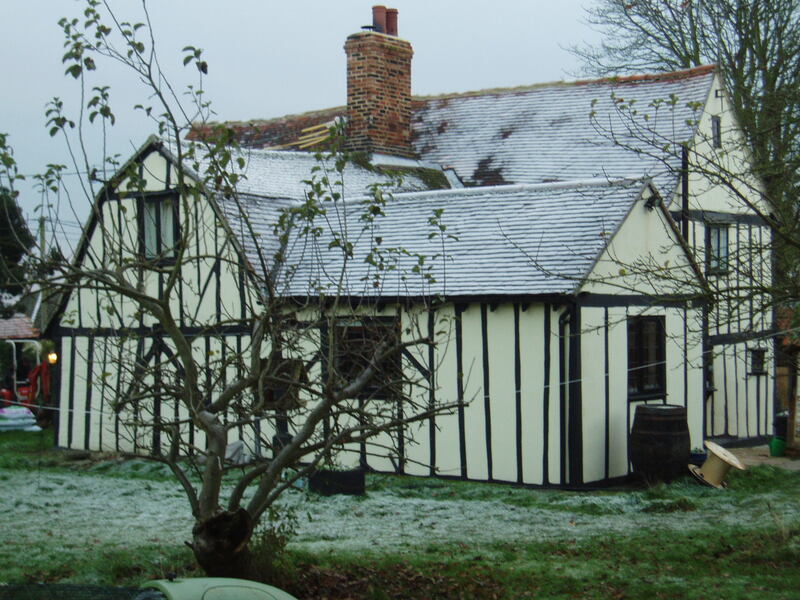 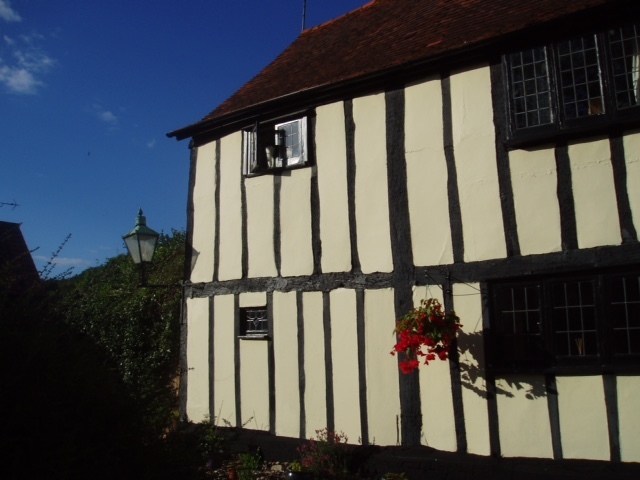 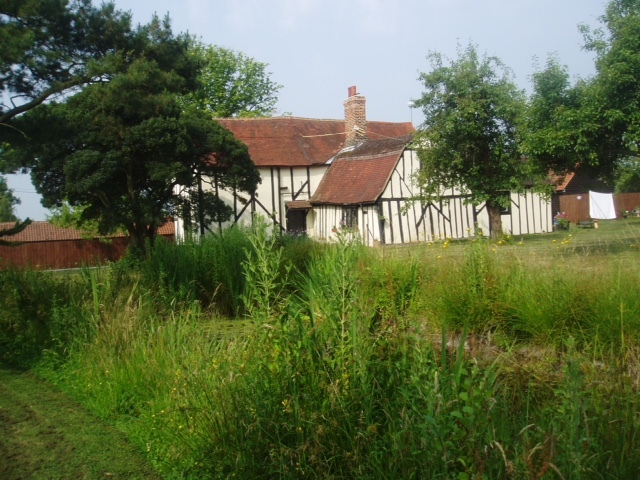 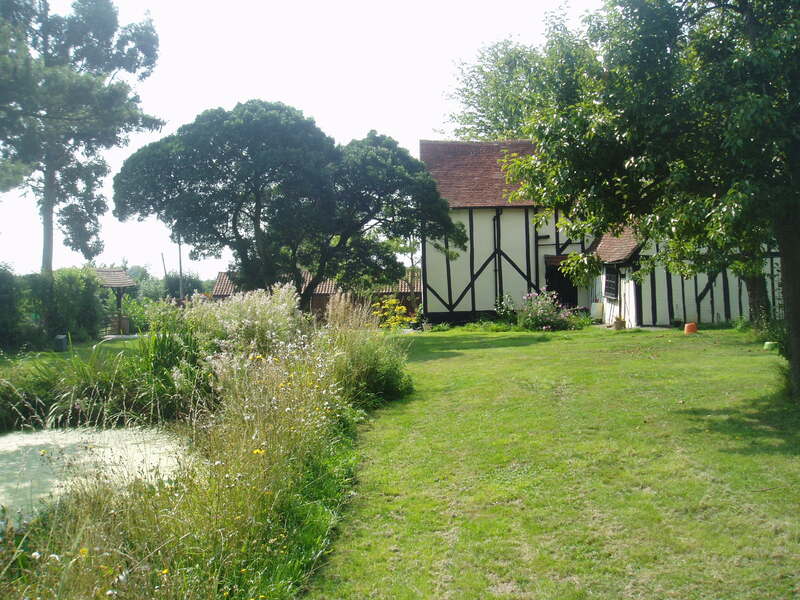 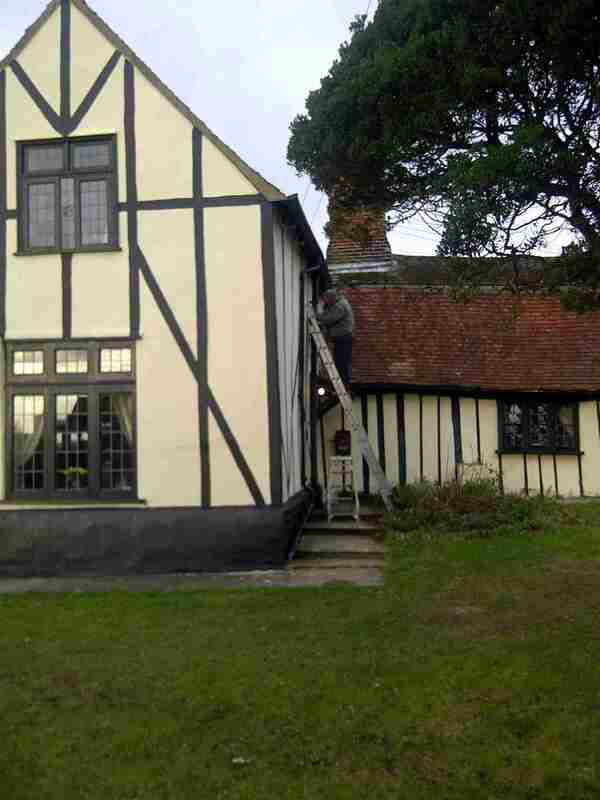 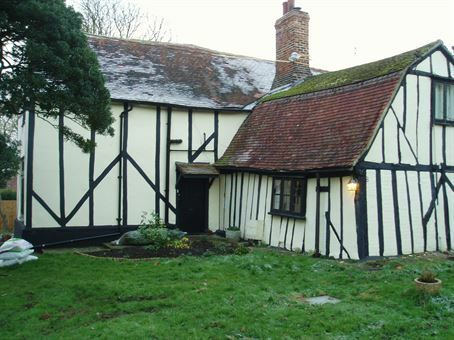 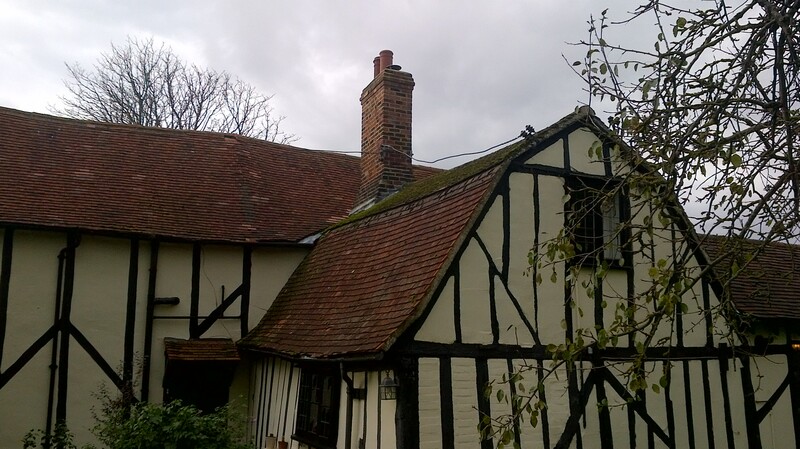 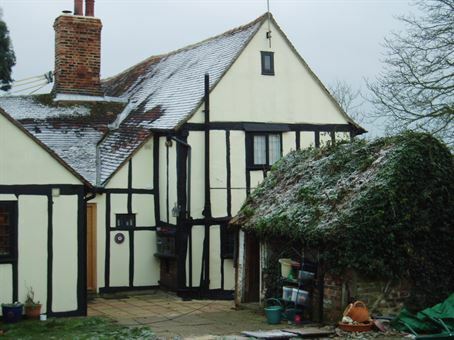 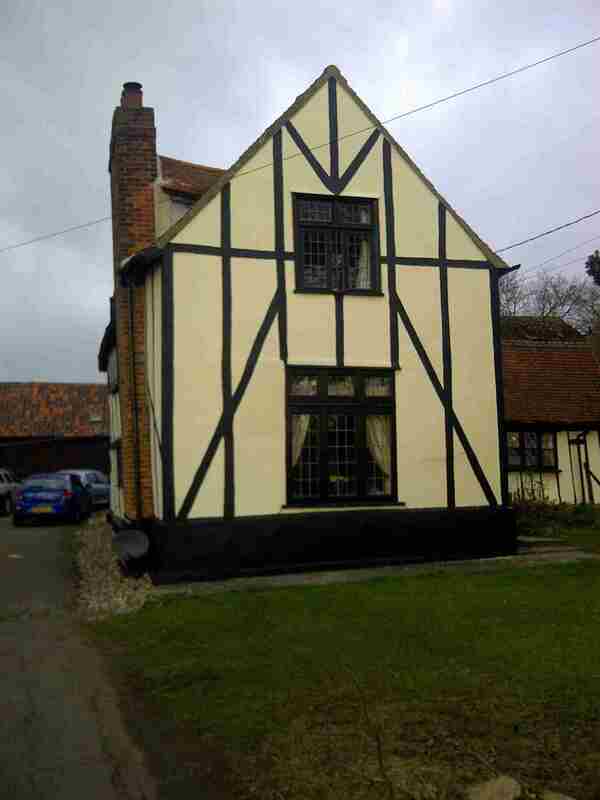 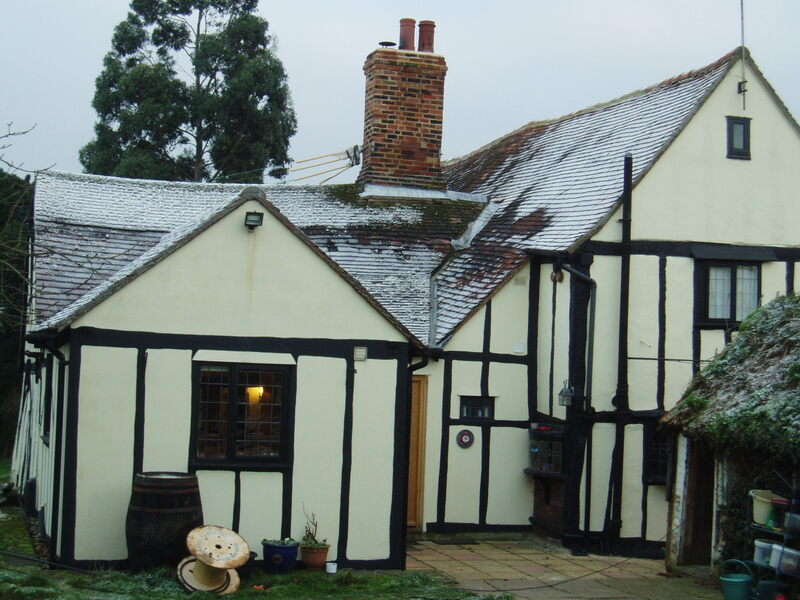 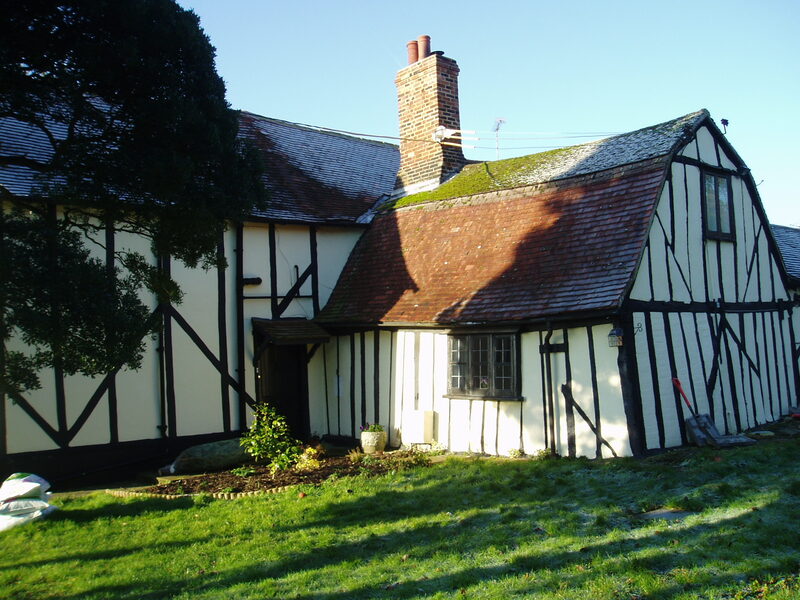 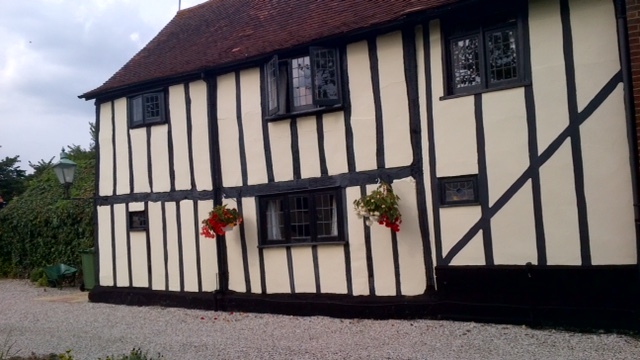 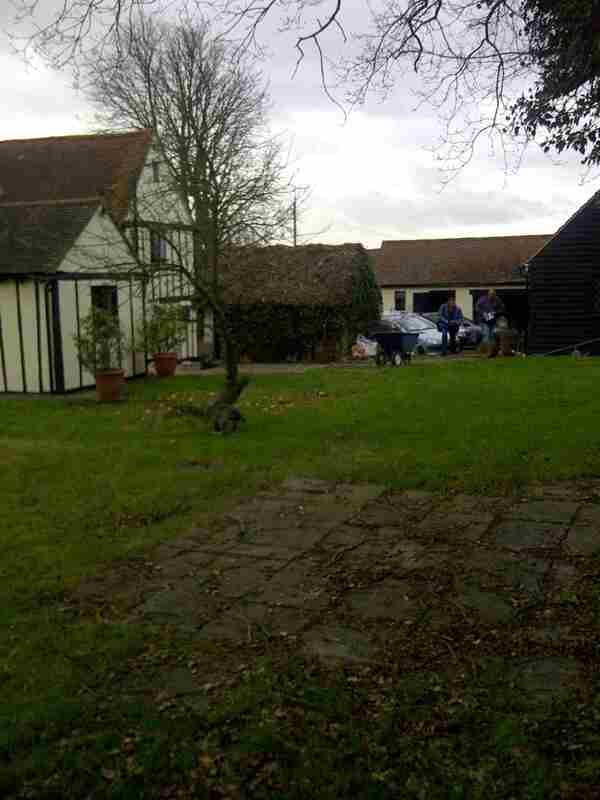 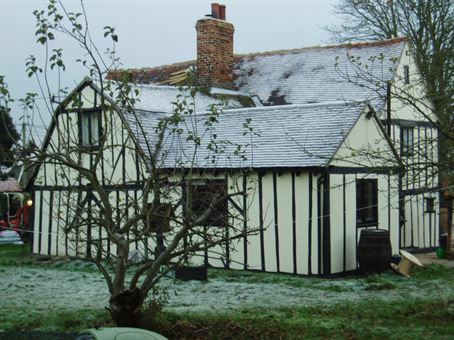 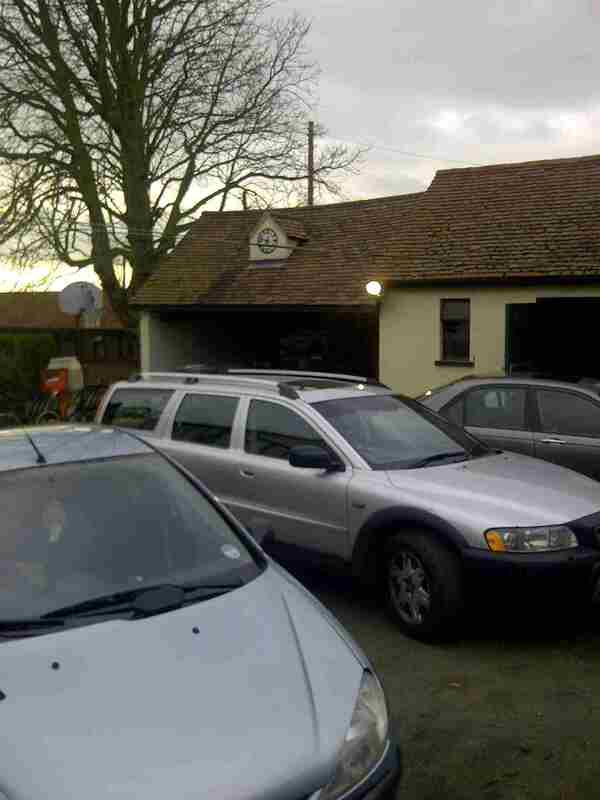 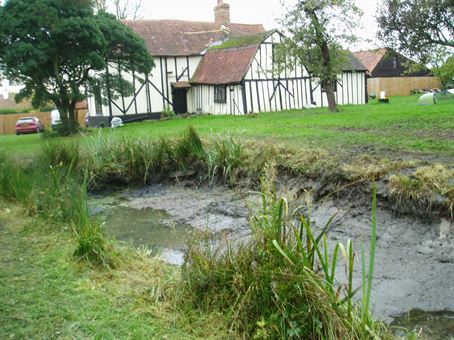 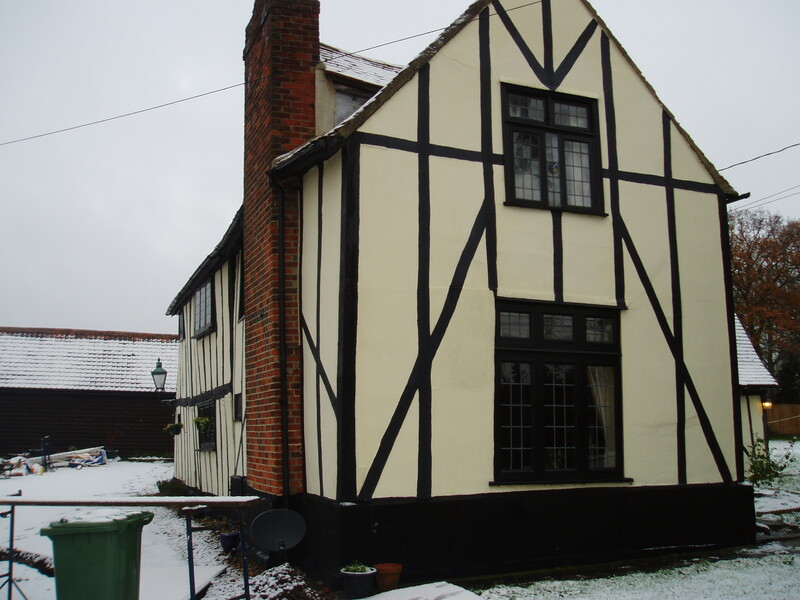 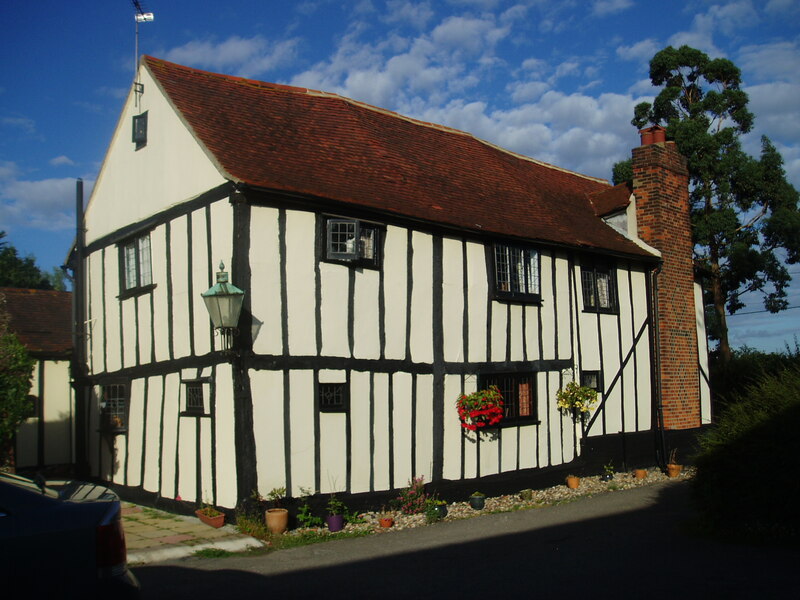 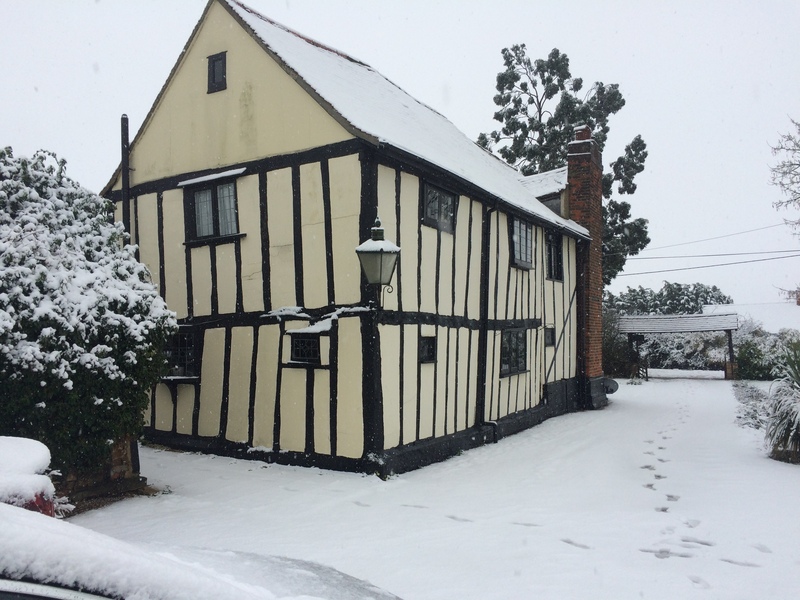 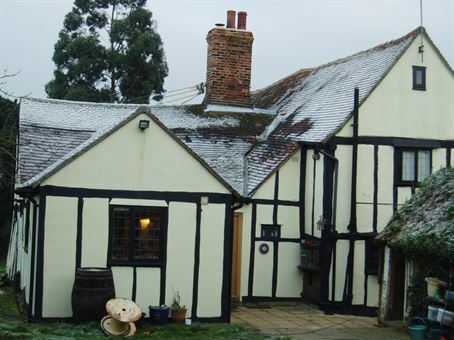 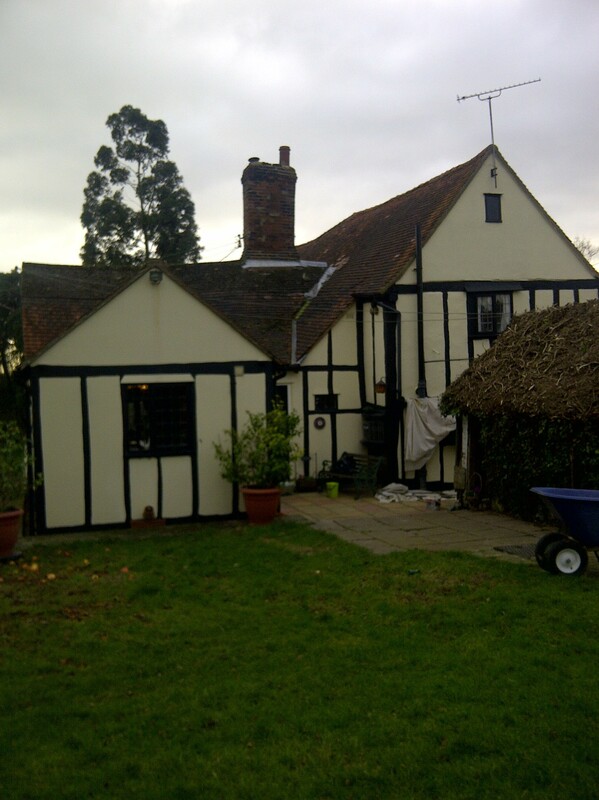 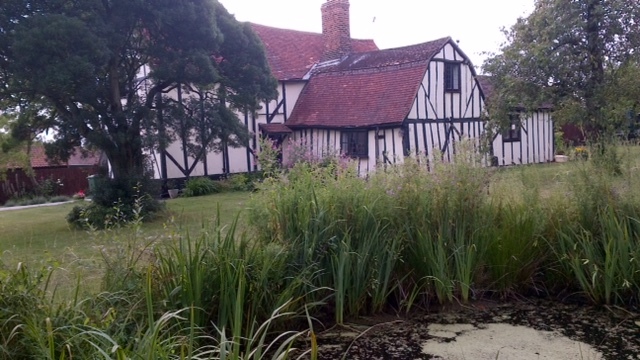 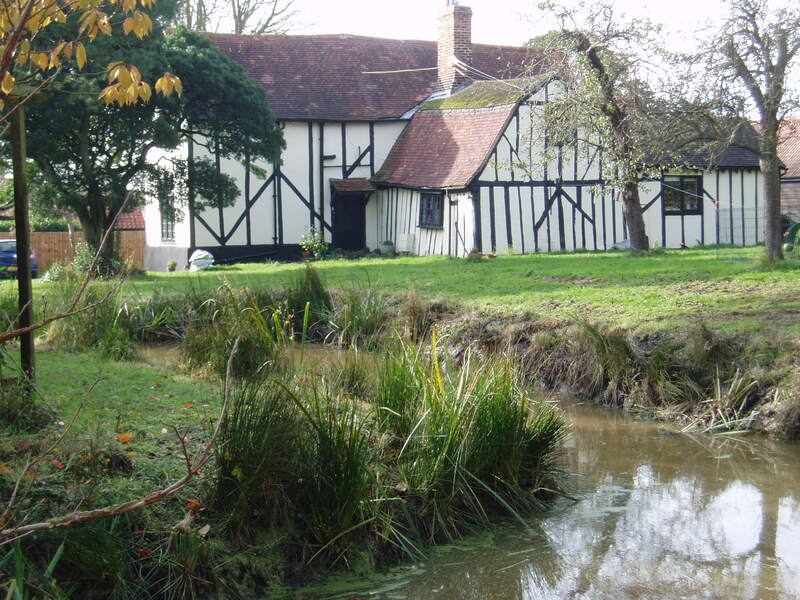 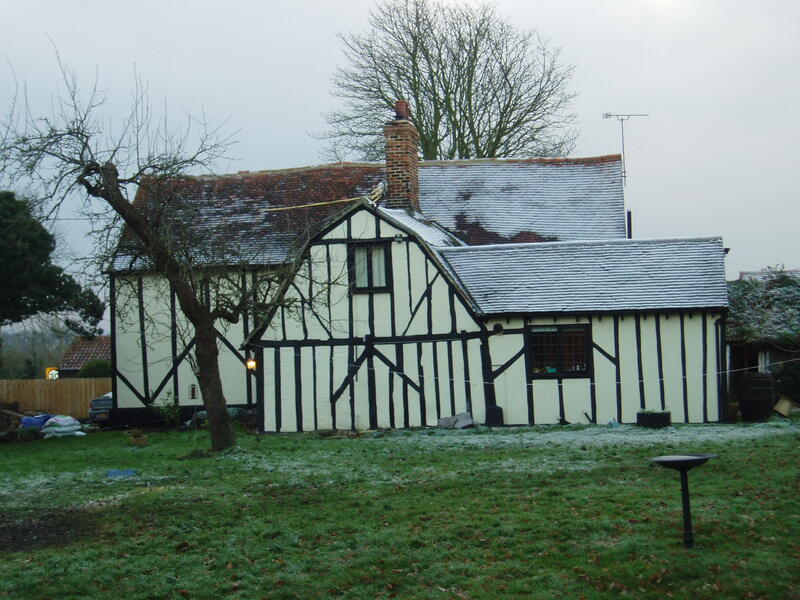 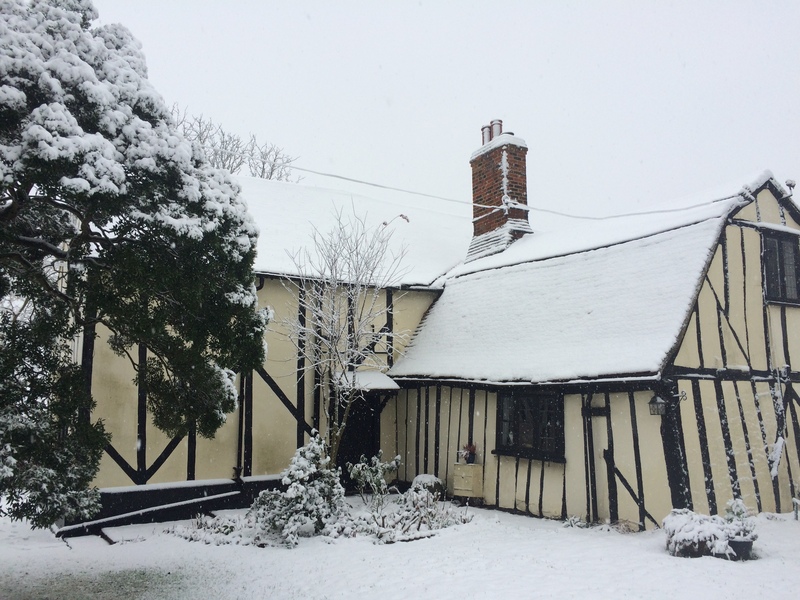 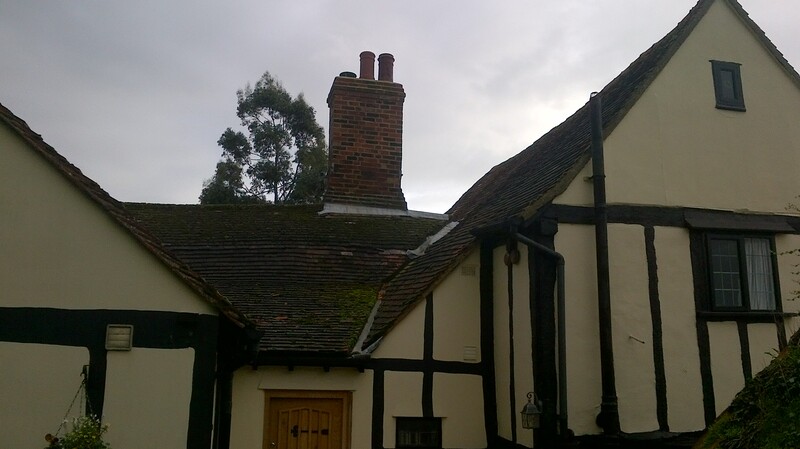 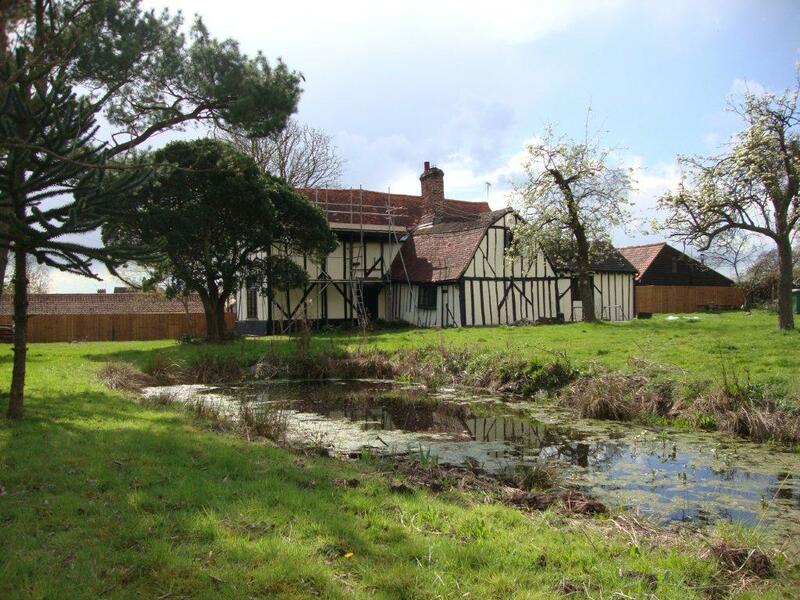 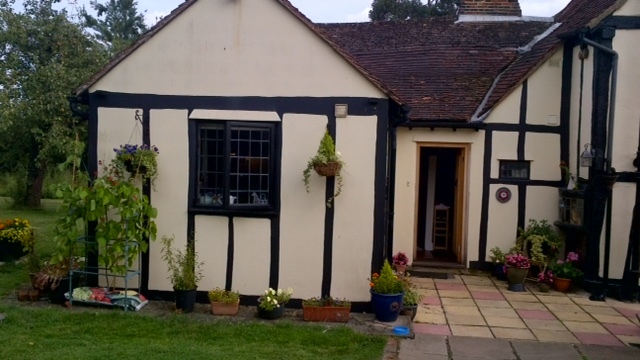 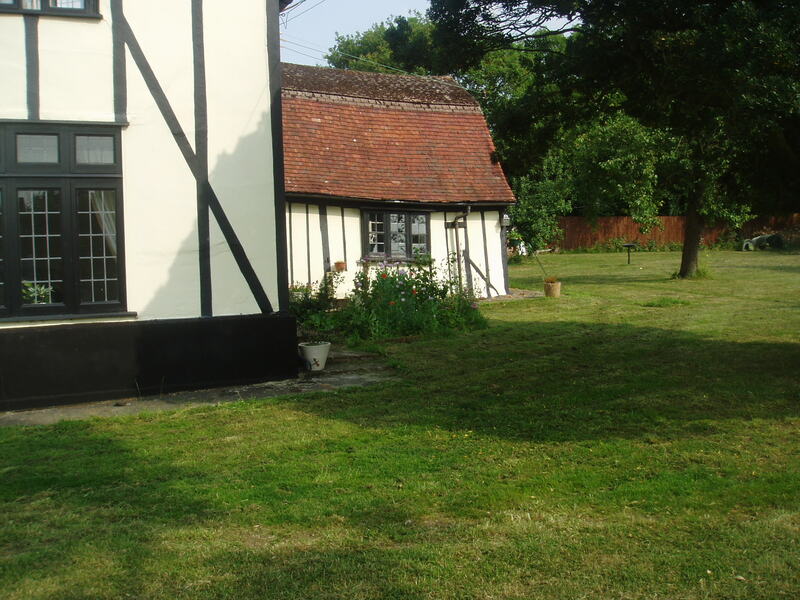 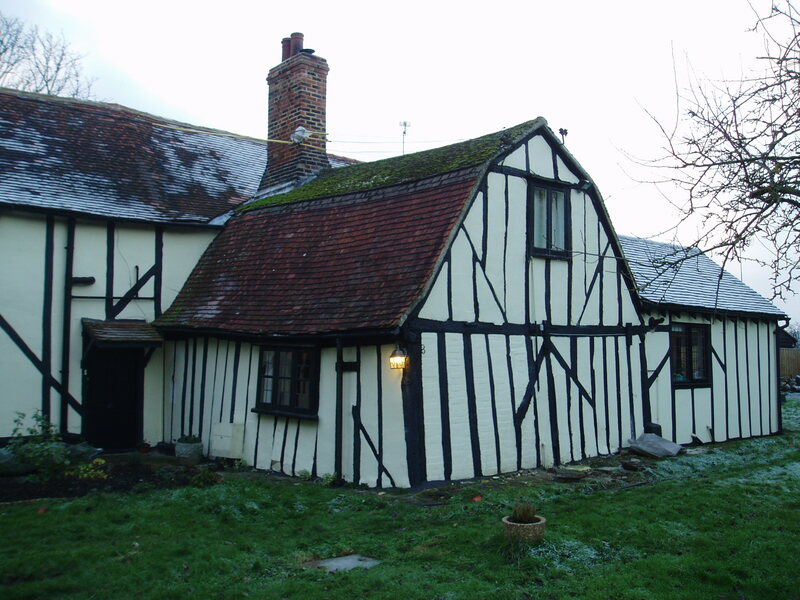 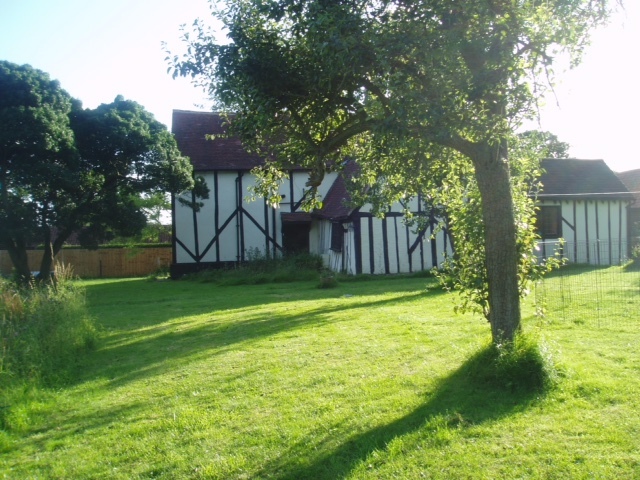 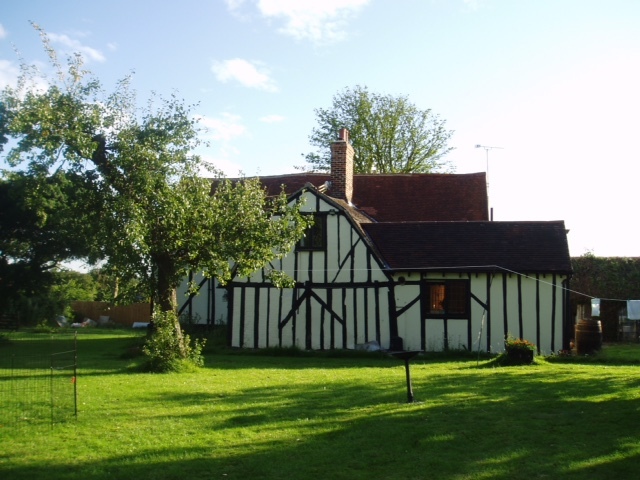 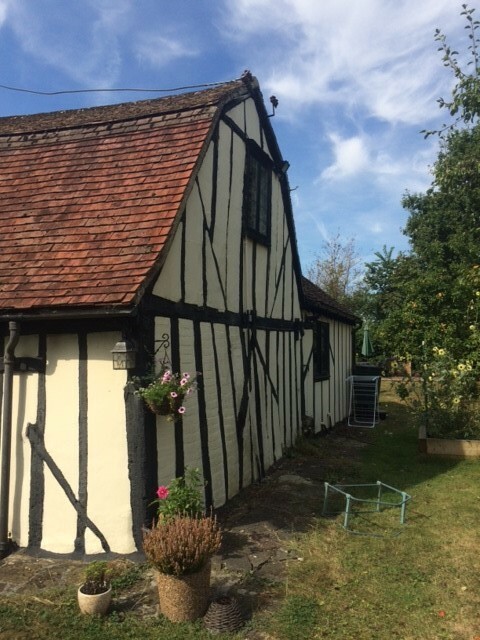 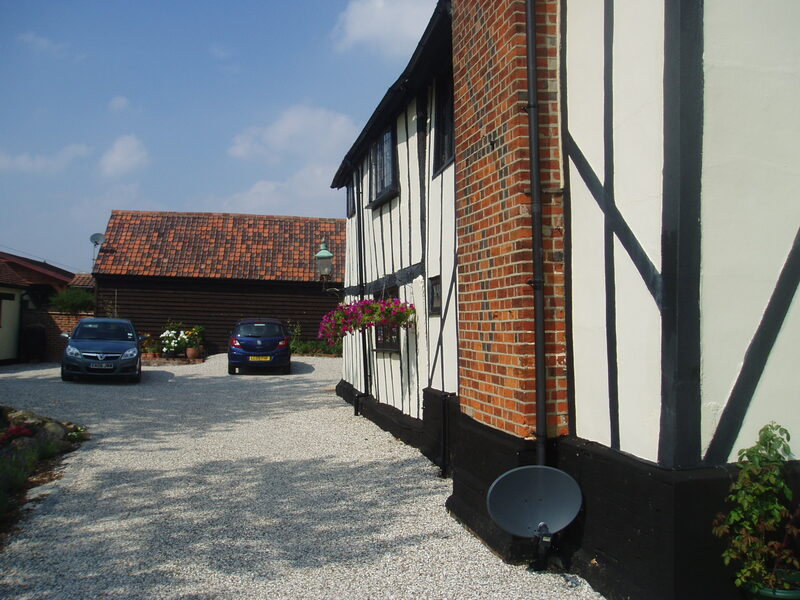 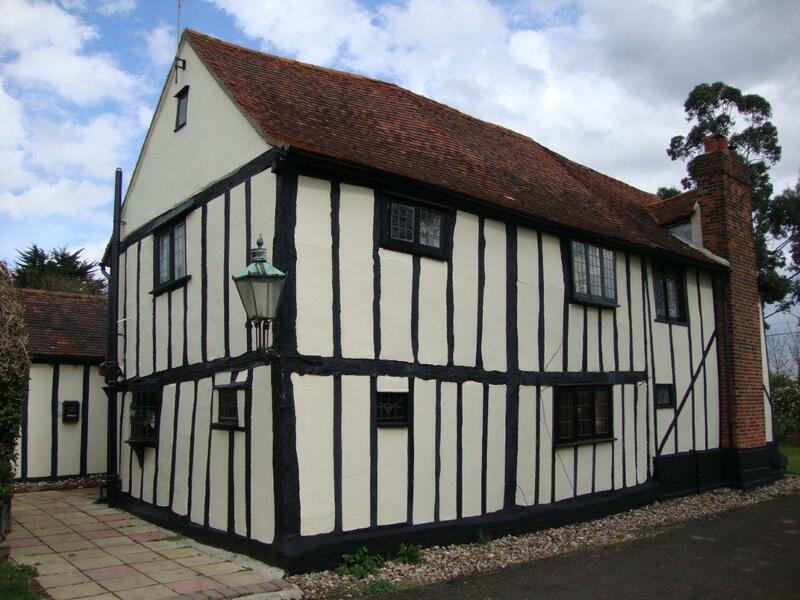 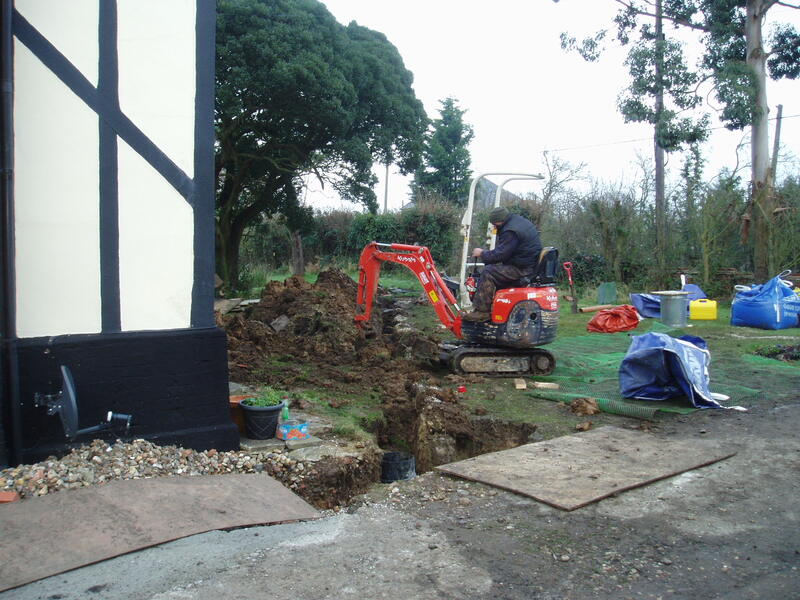 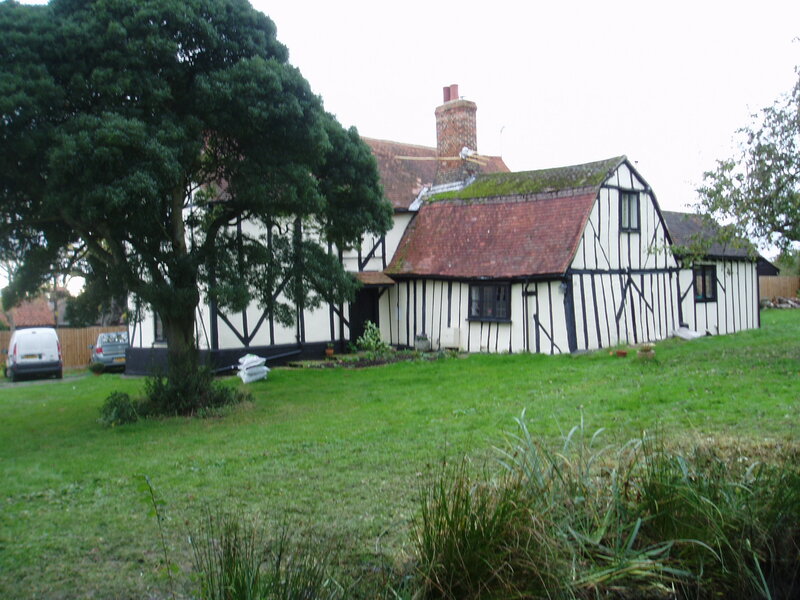 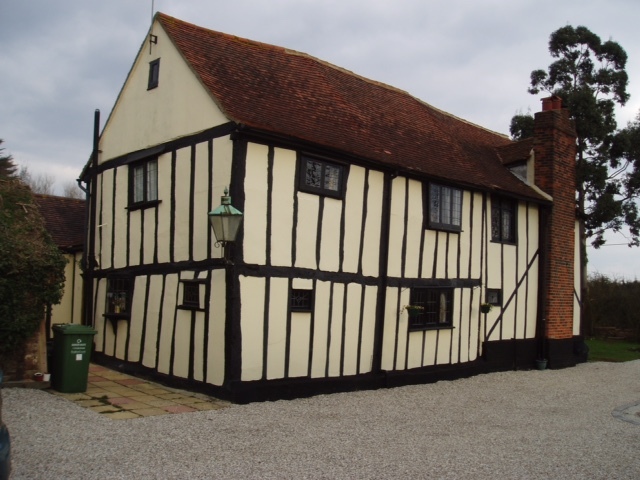 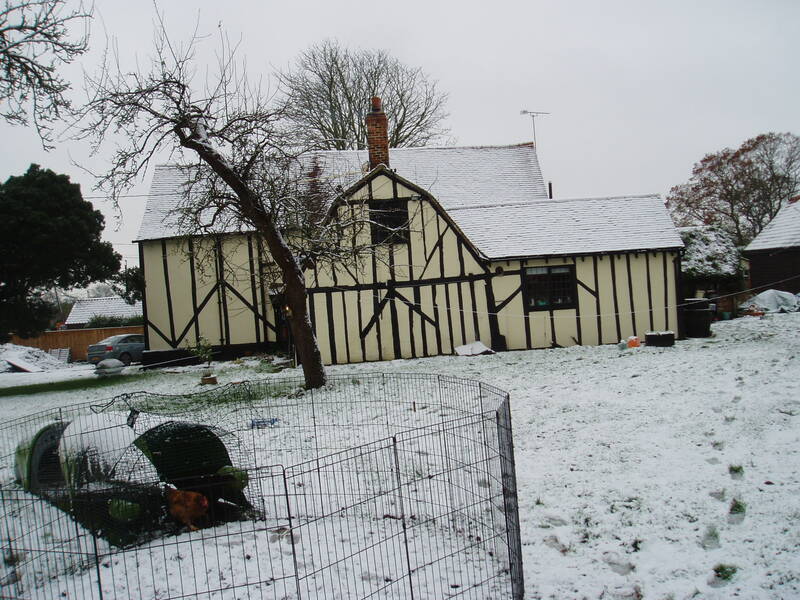 This page provides a time-series of photos of our house – Coxes Farm, Billericay, Essex – prior to the discovery of a crack at the front in December 2017. 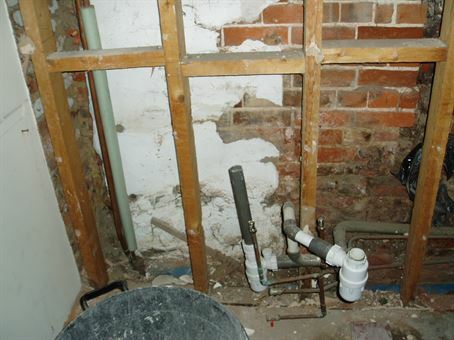 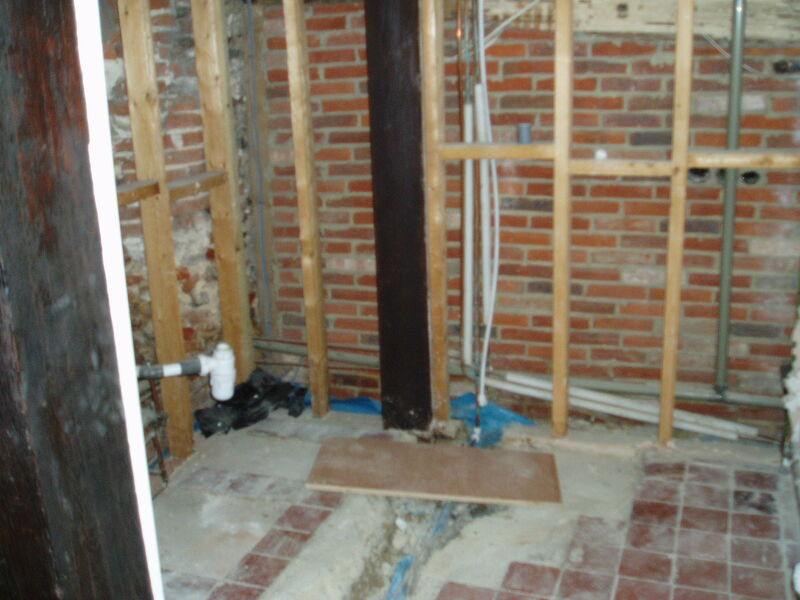 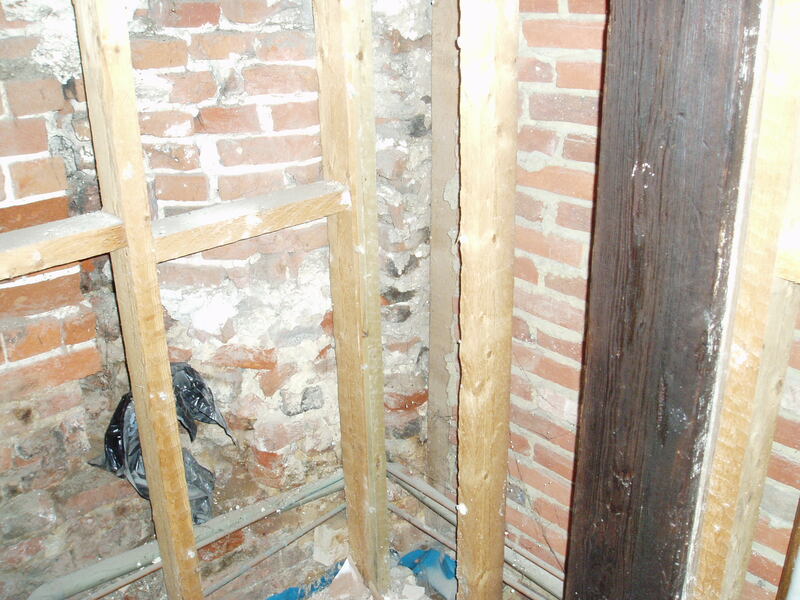 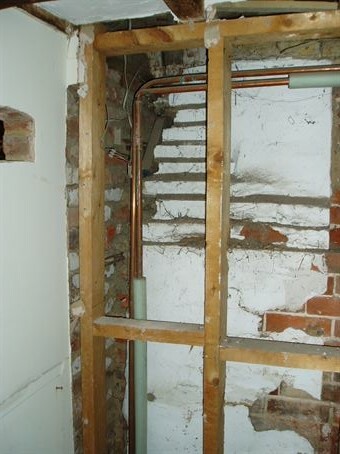 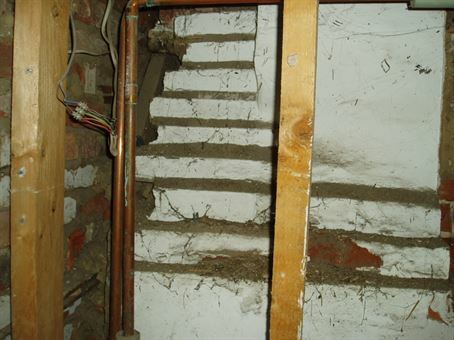 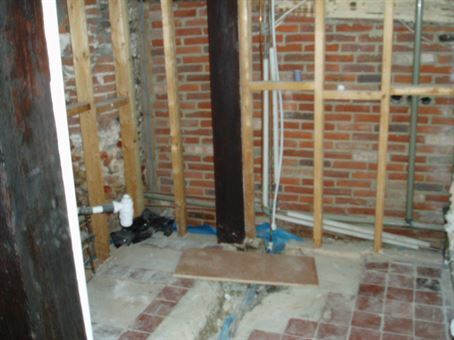 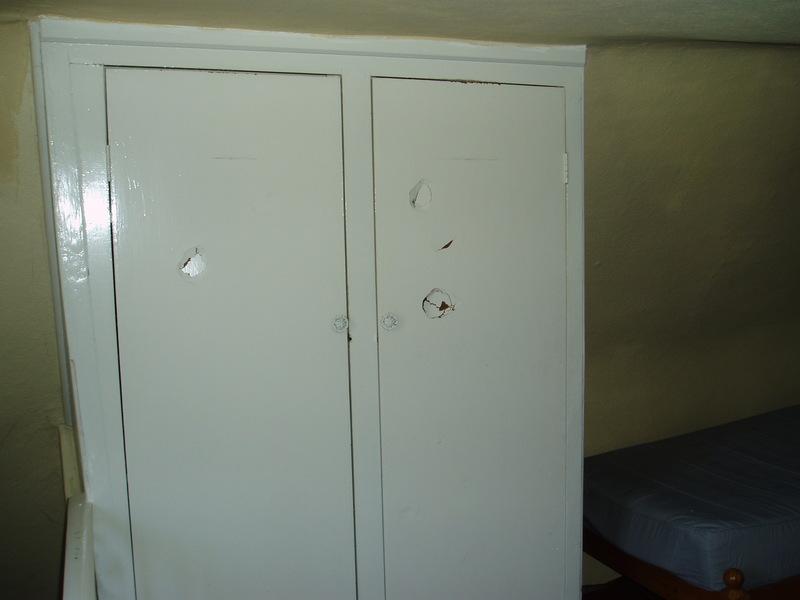 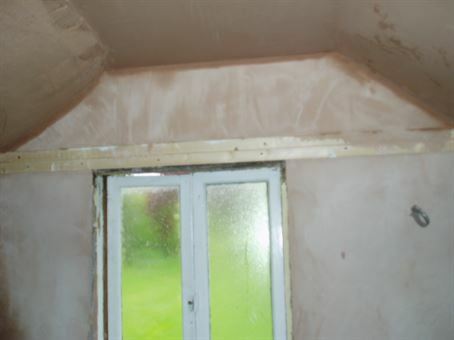 Photos associated with the recent repairs appear on this further page1. 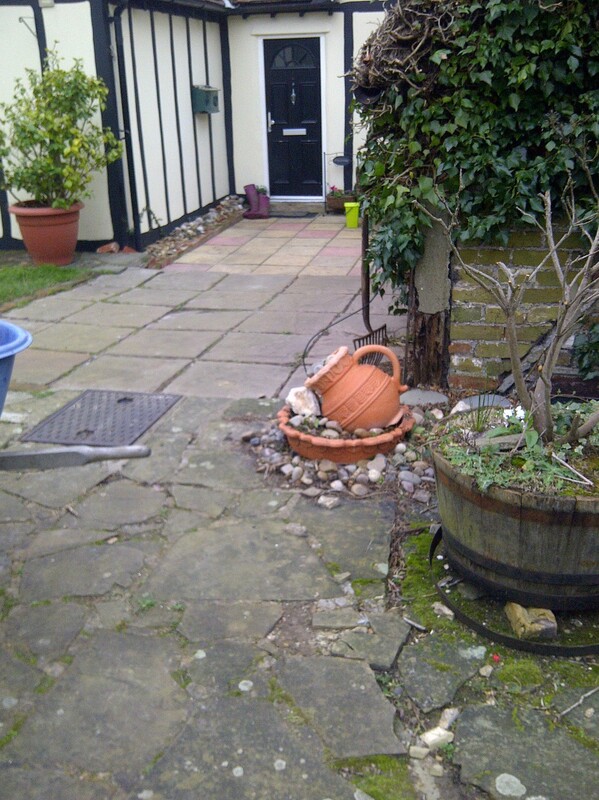 Those of the garden appear here2. 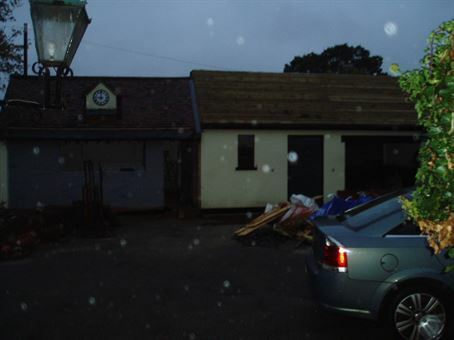 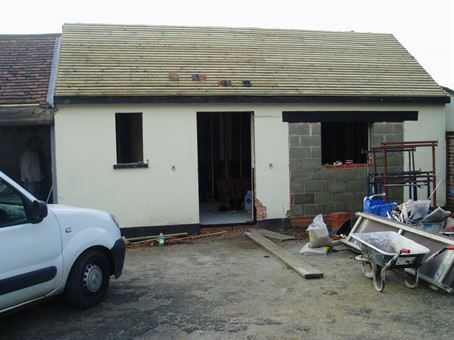 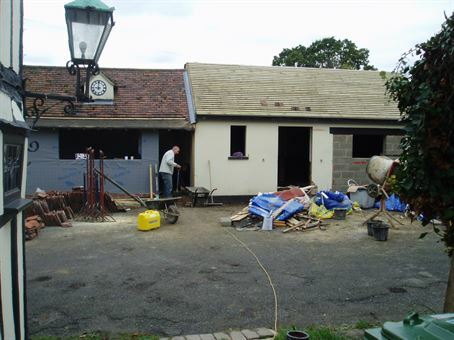 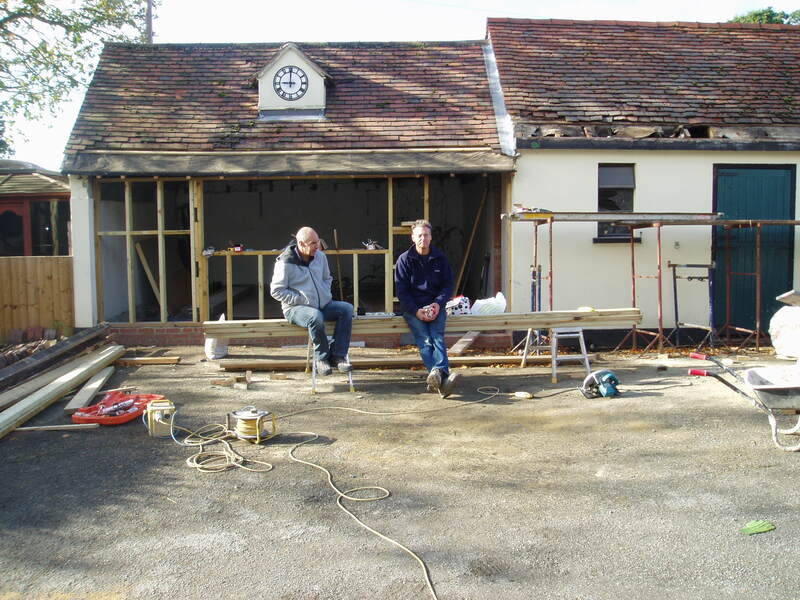 Conversion of the Outbuildings (October, November & December 2012). 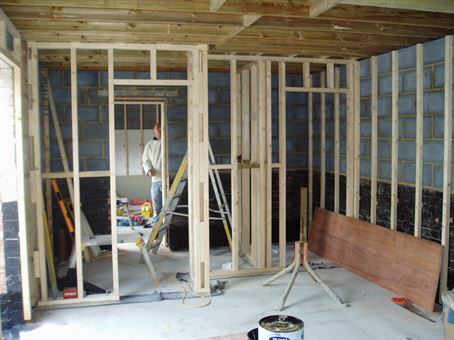 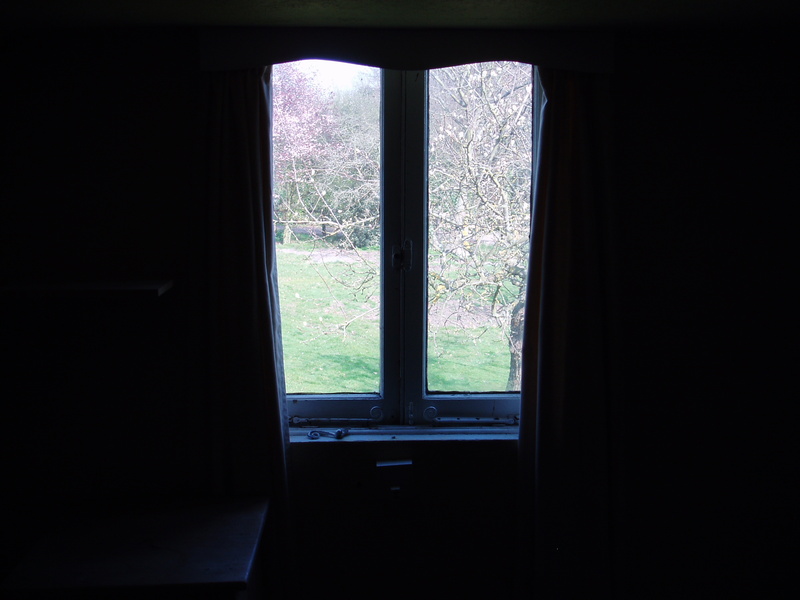 Conversion of the 'Wonky Room' (April 2012). 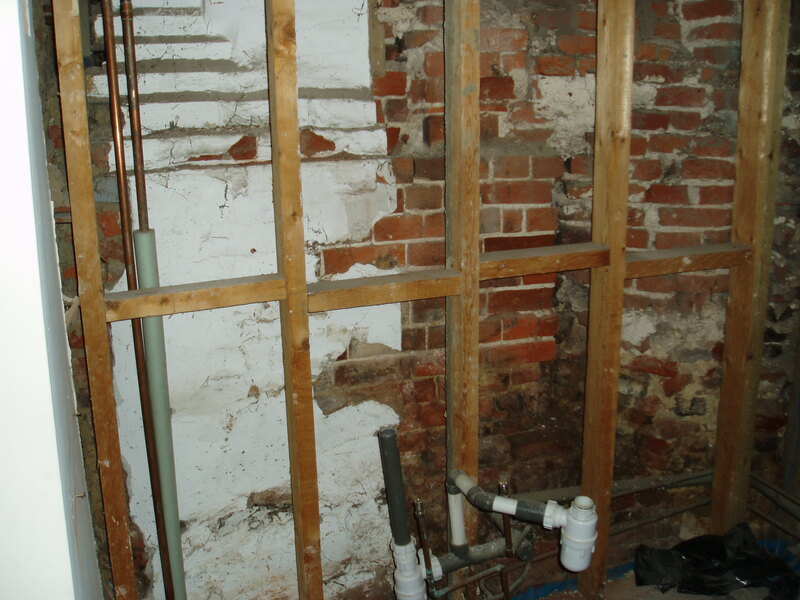 Conversion of the Utilities Room into a Shower Room (April 2012). 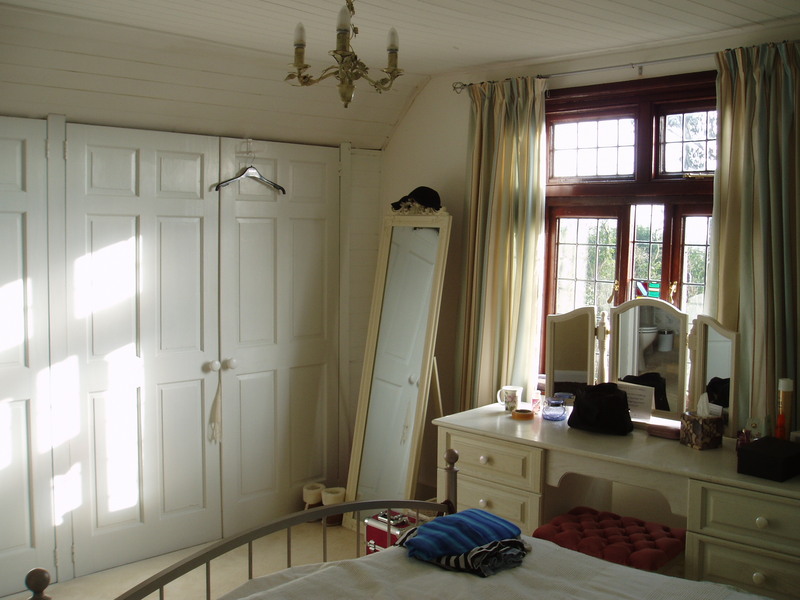 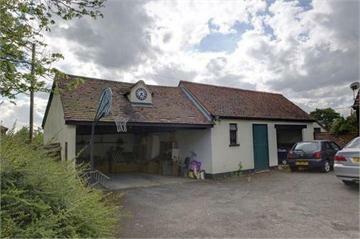 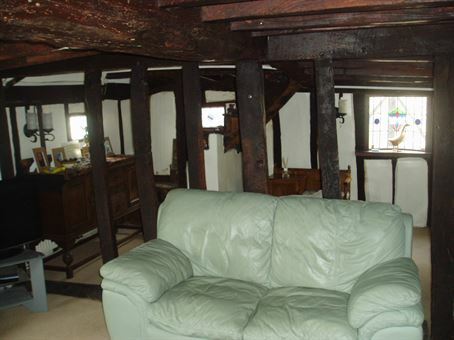 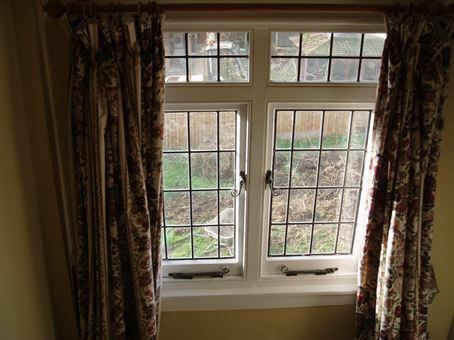 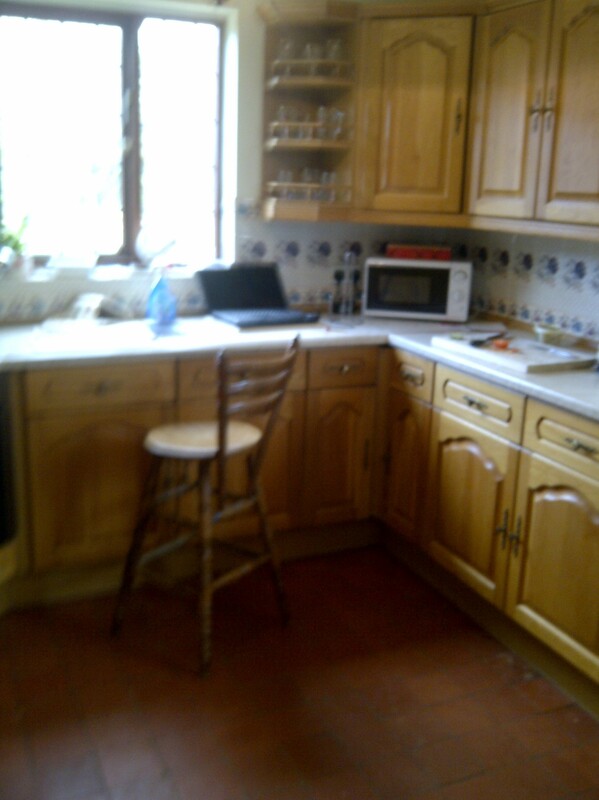 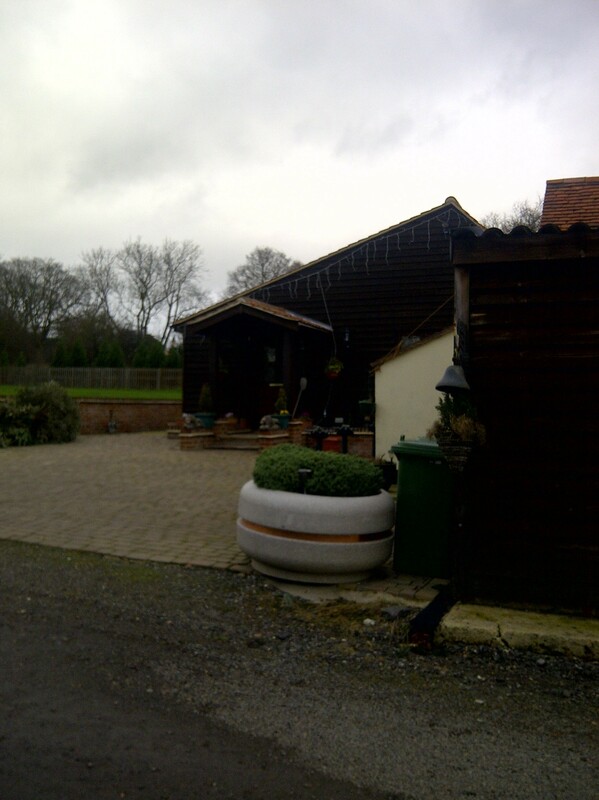 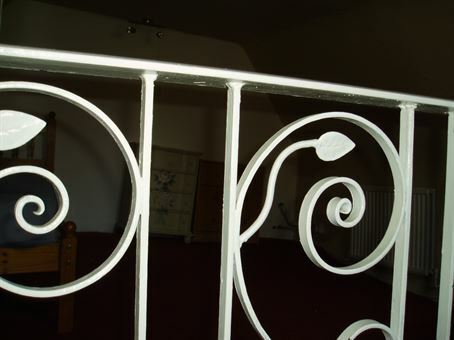 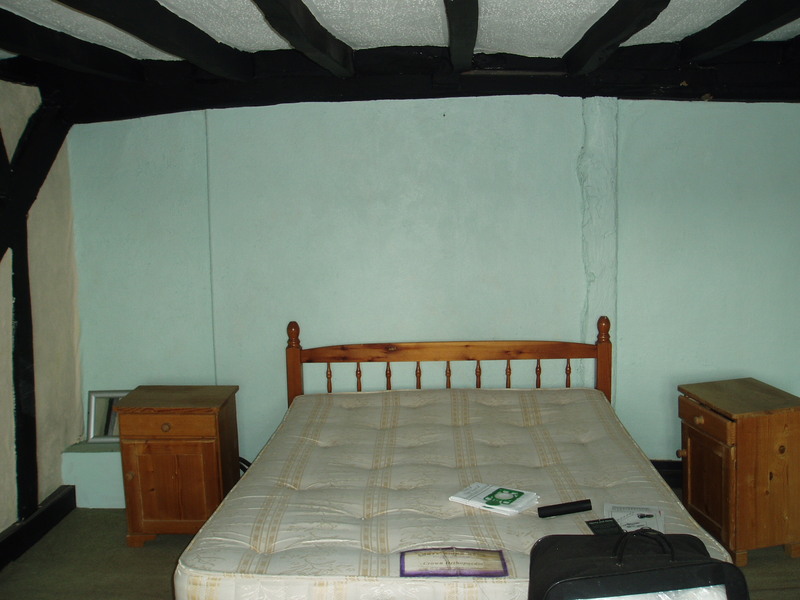 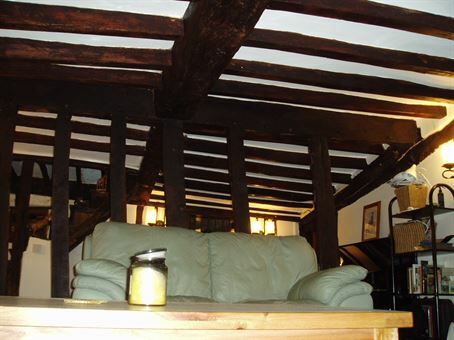 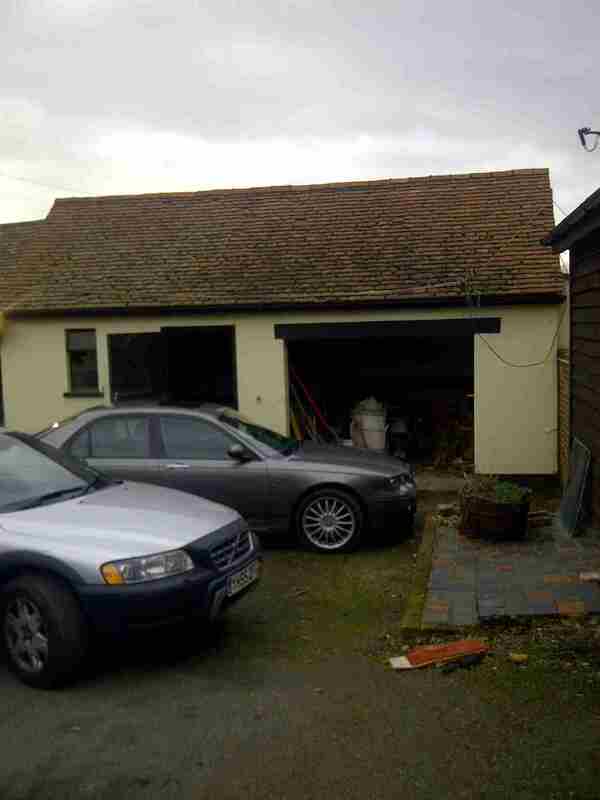 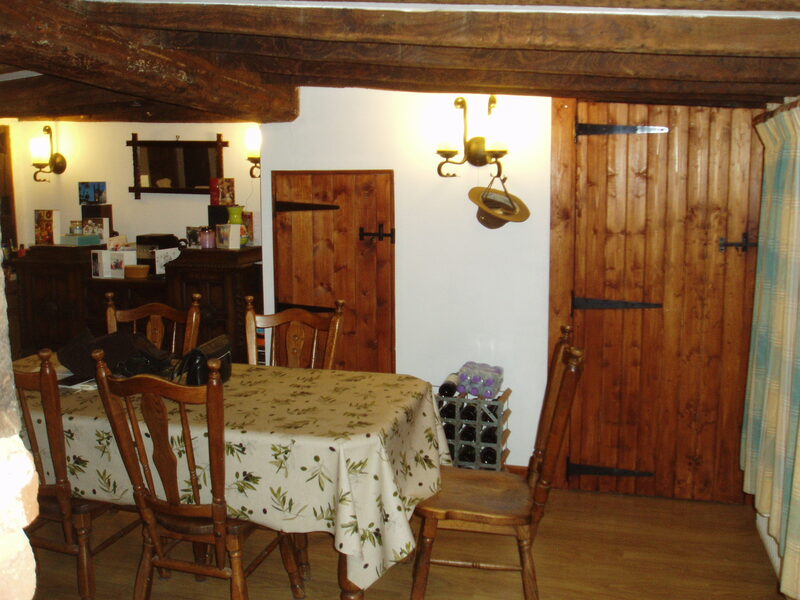 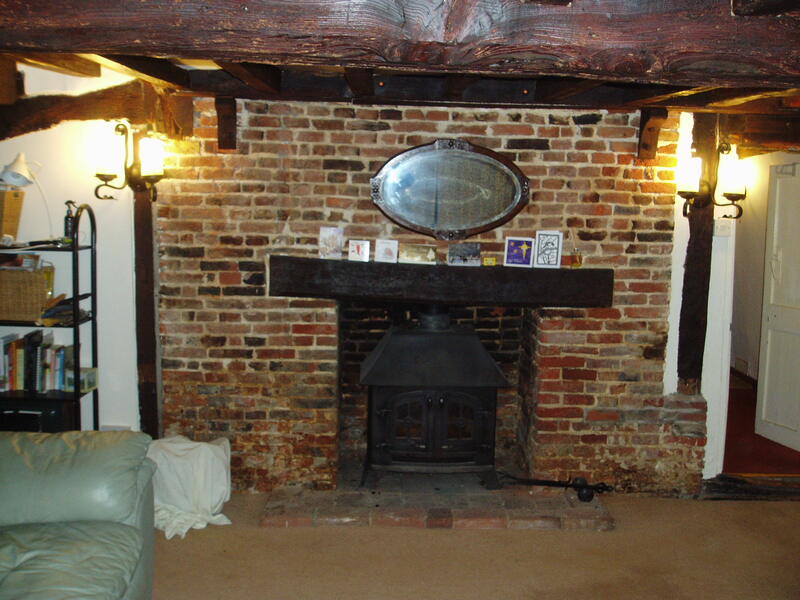 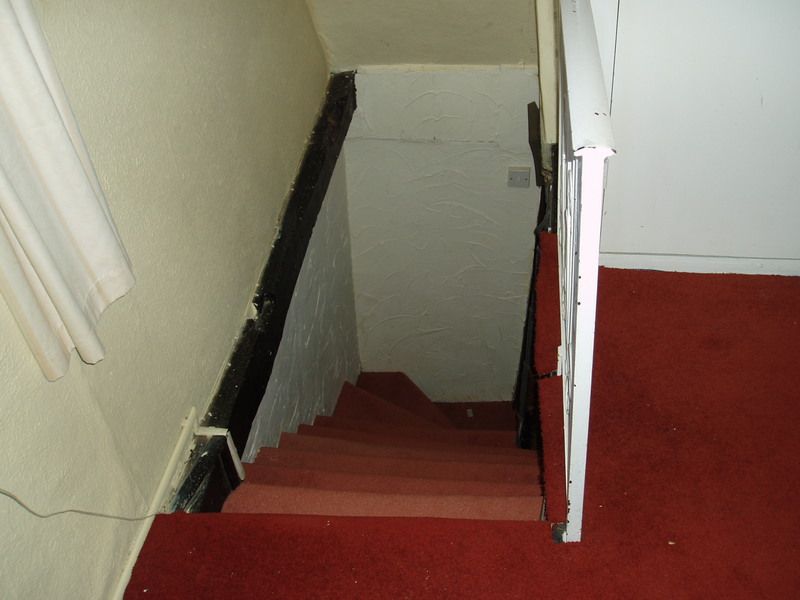 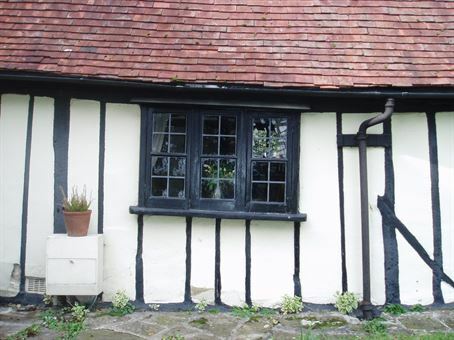 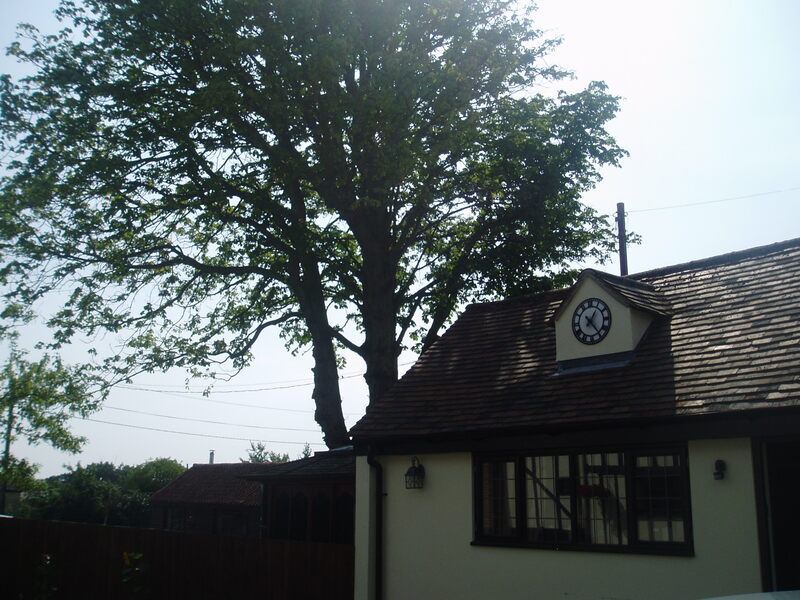 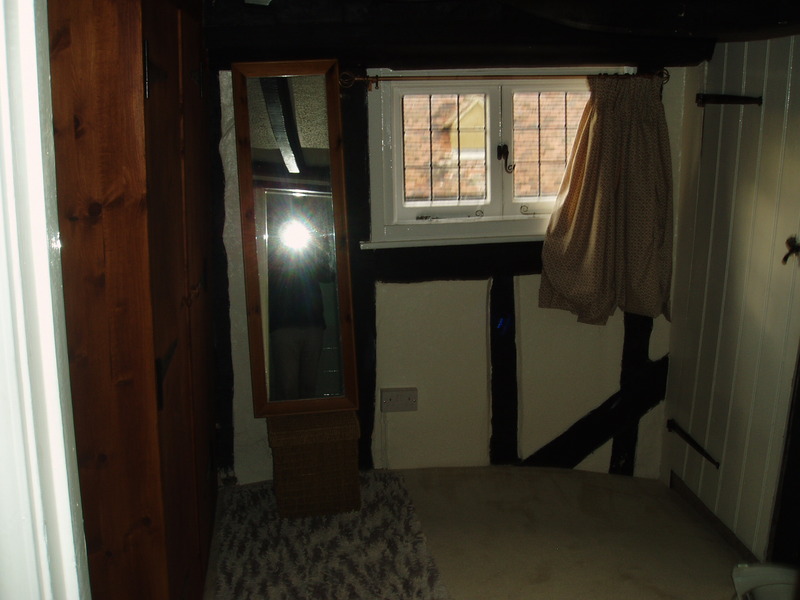 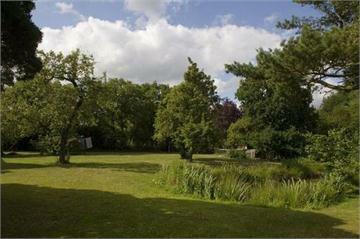 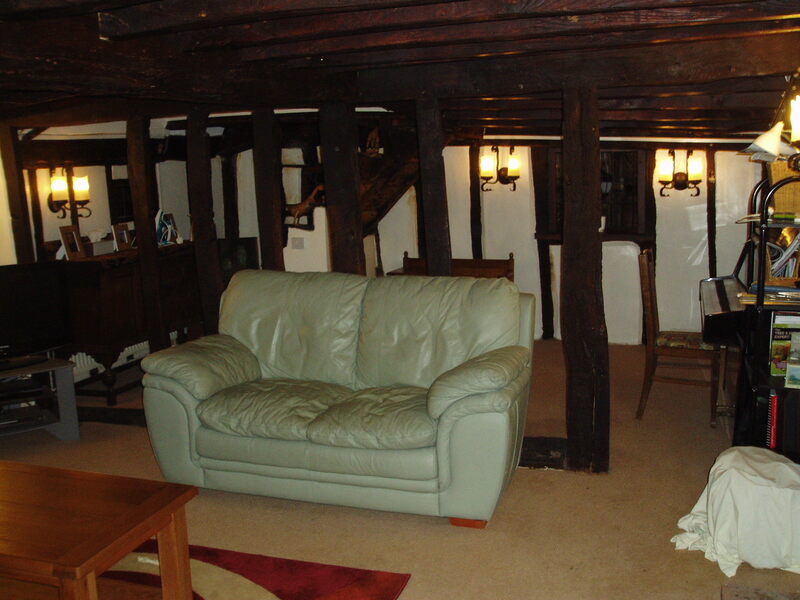 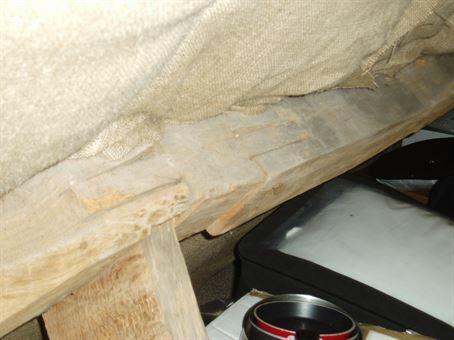 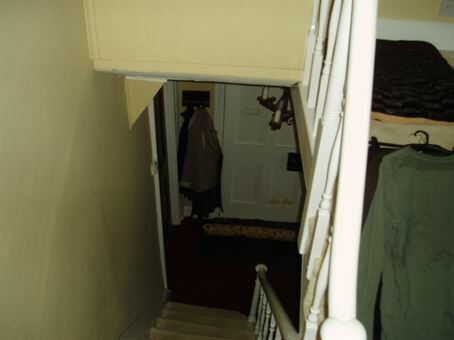 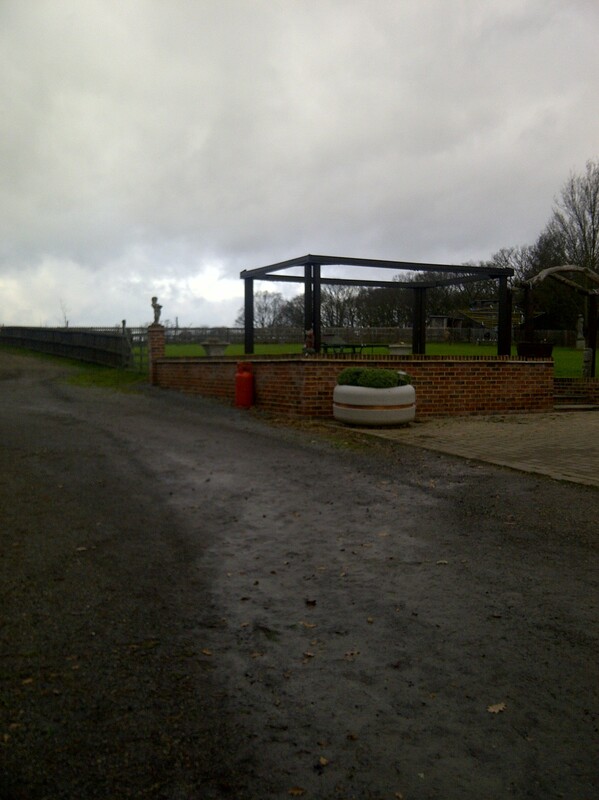 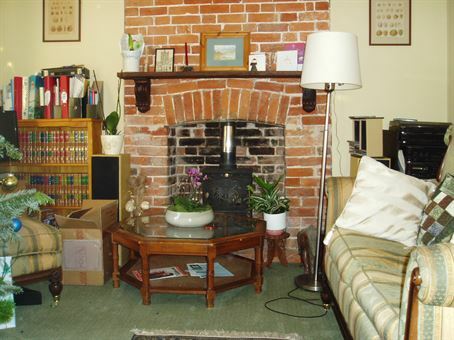 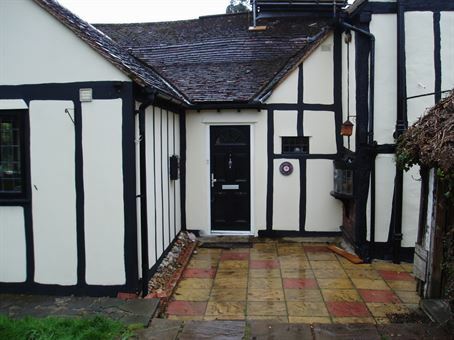 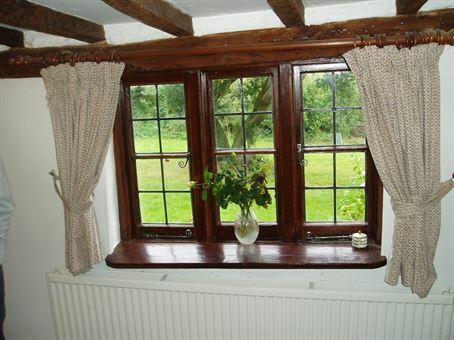 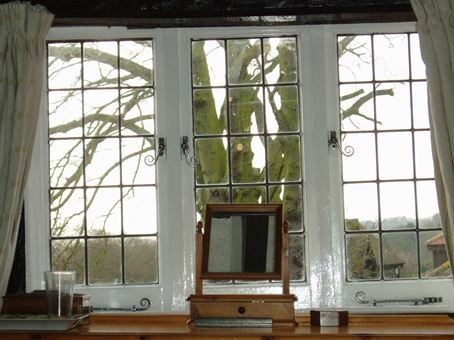 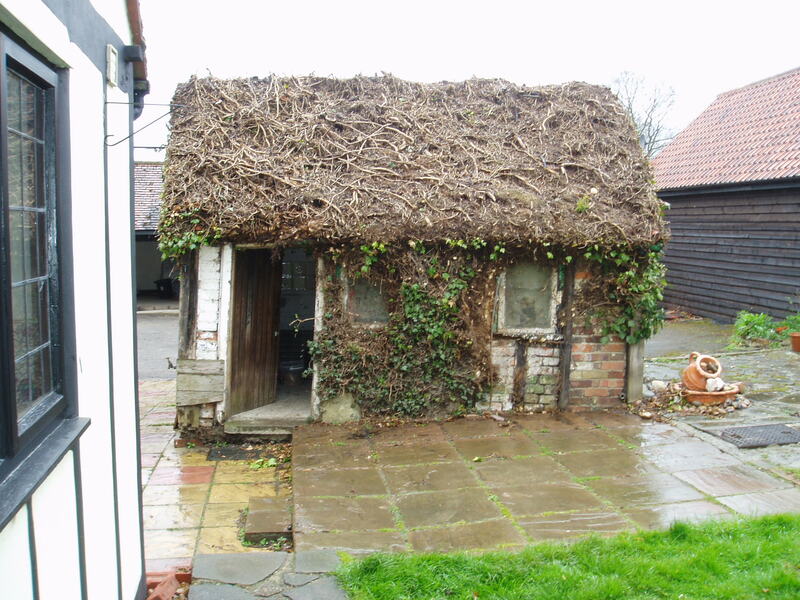 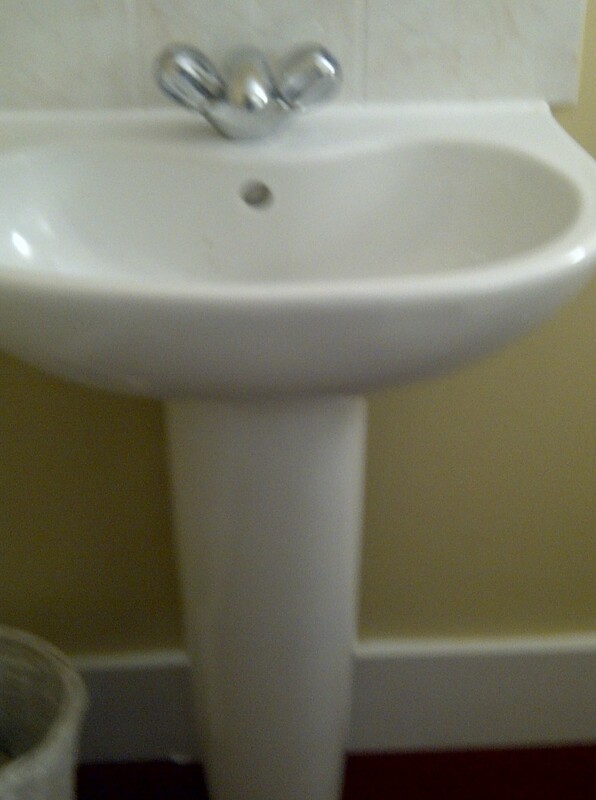 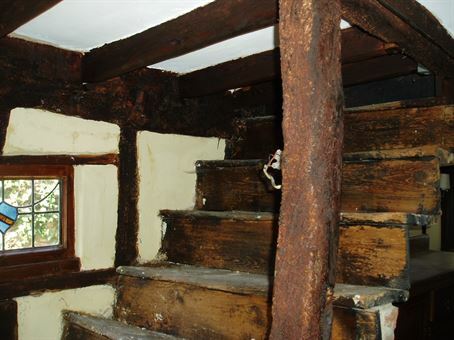 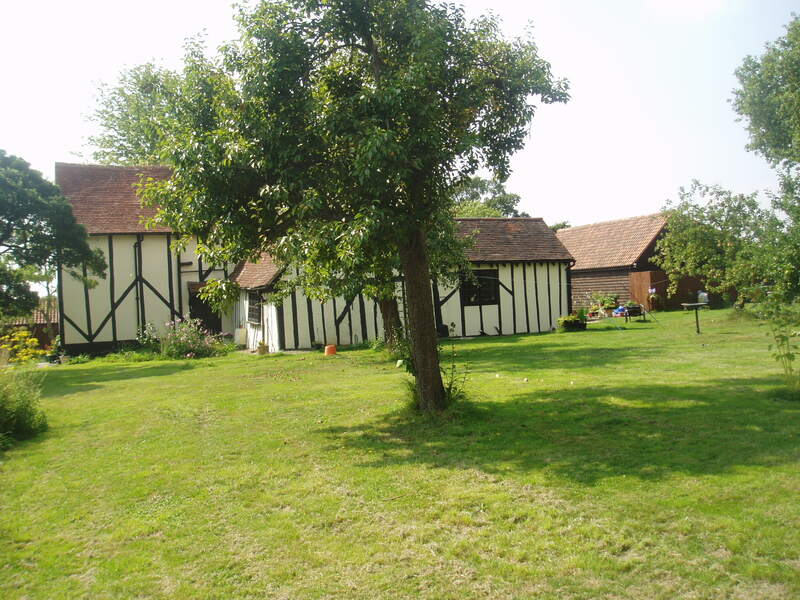 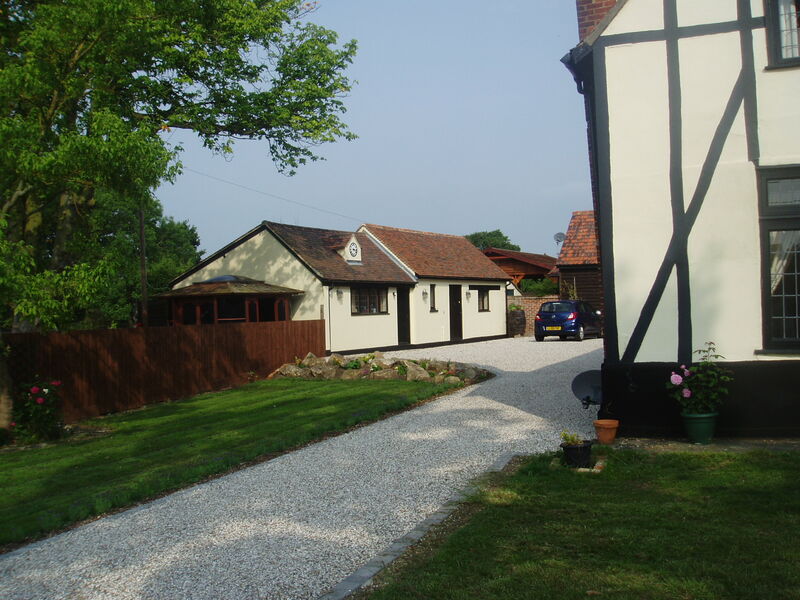 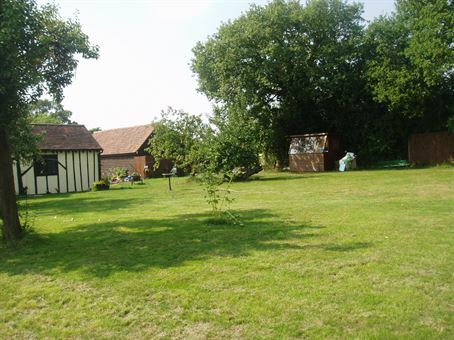 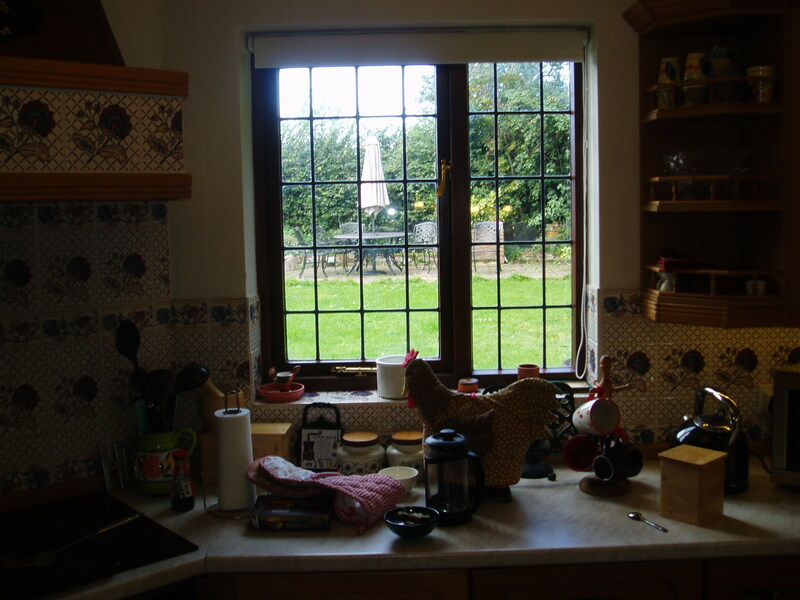 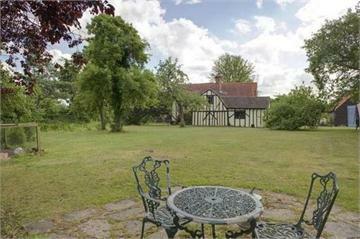 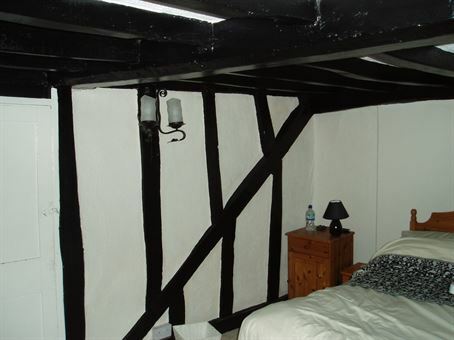 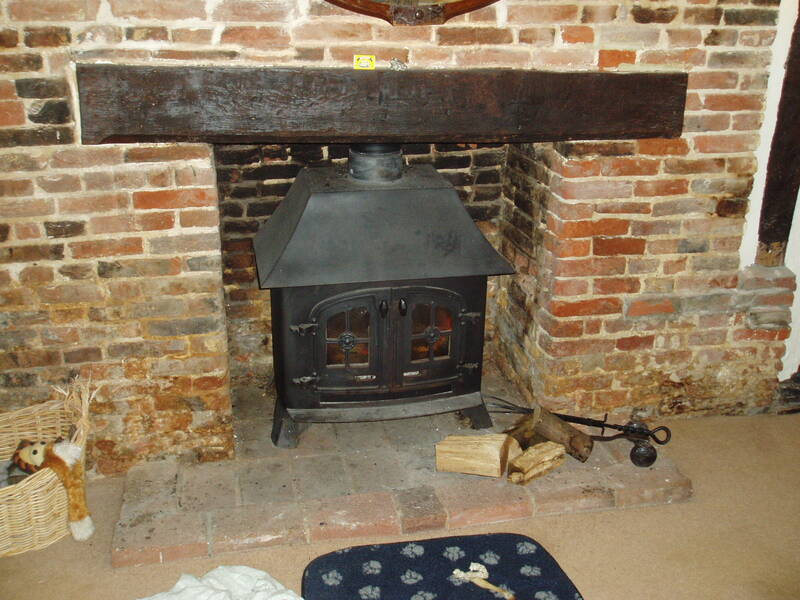 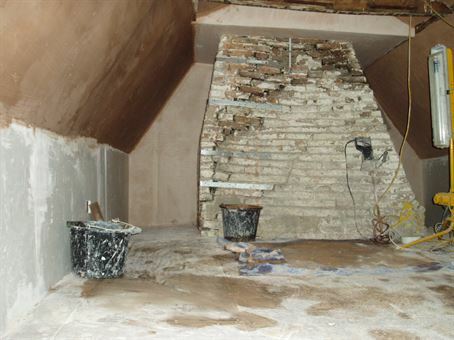 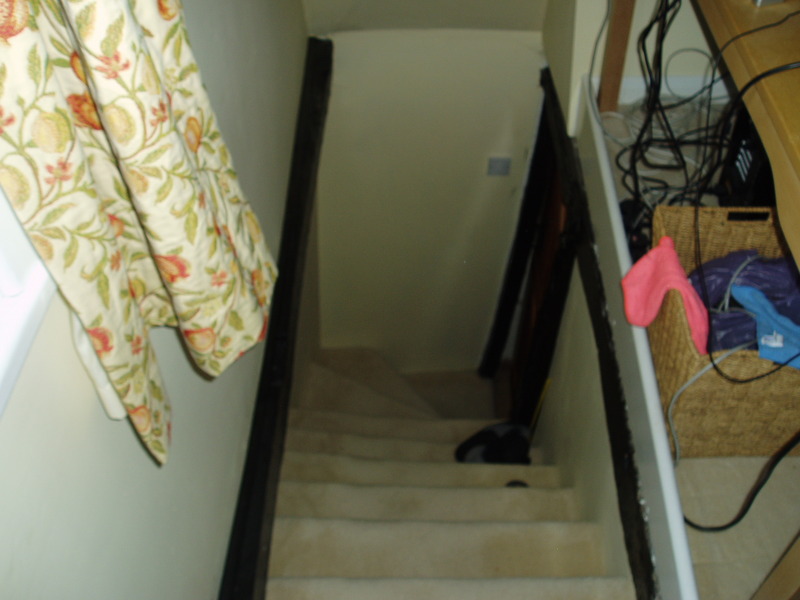 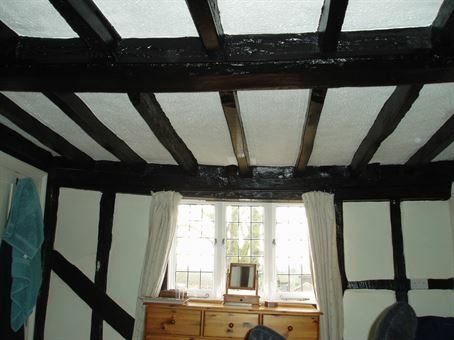 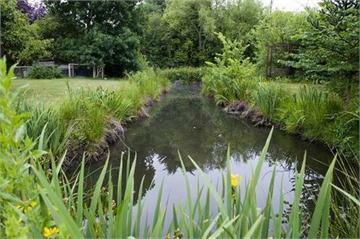 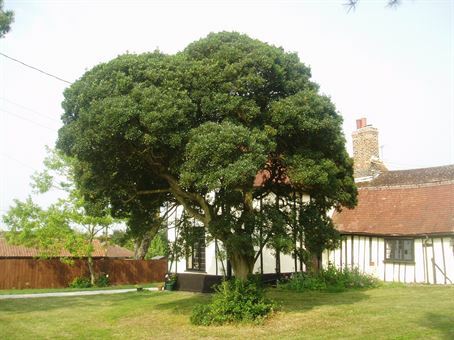 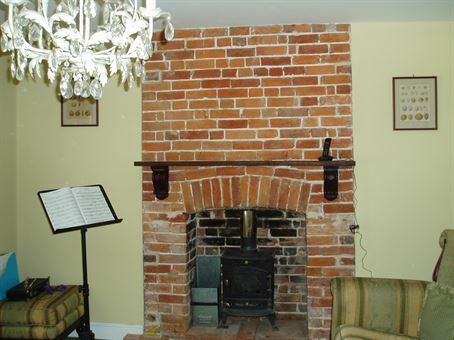 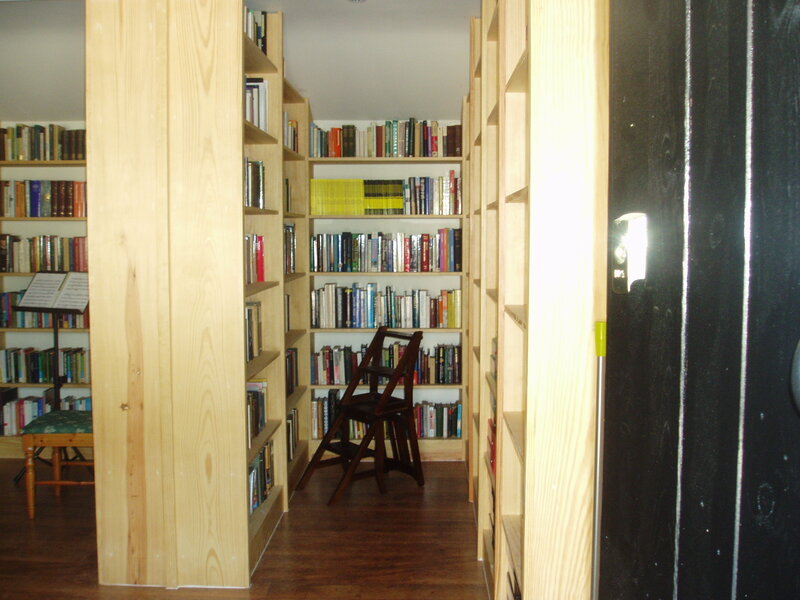 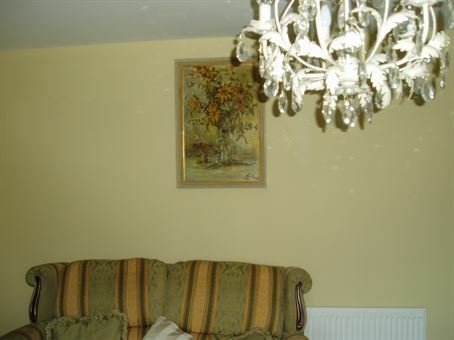 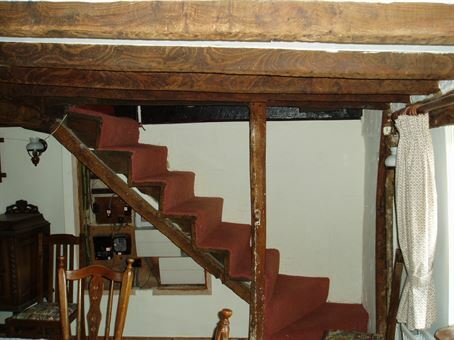 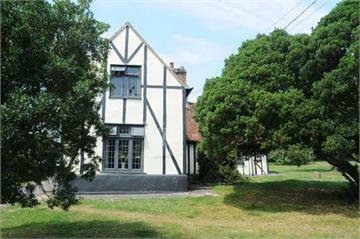 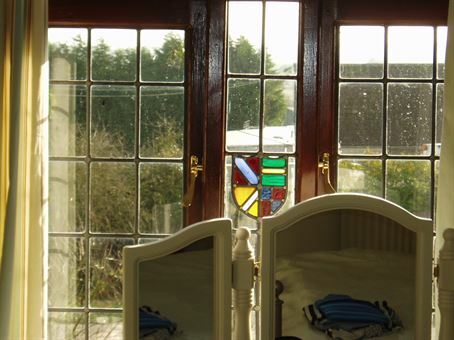 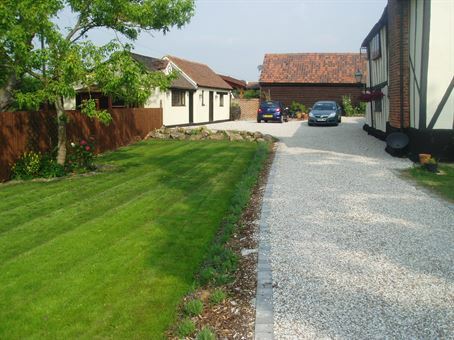 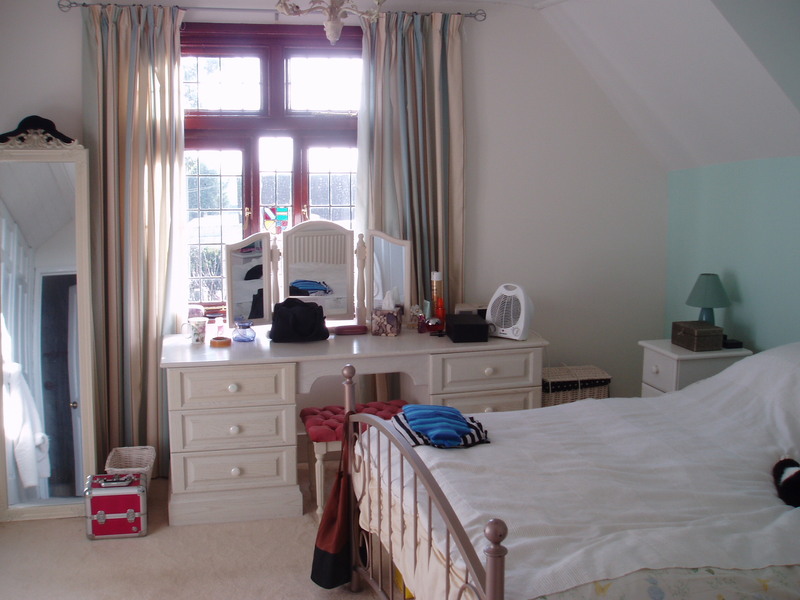 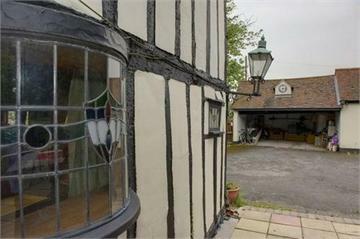 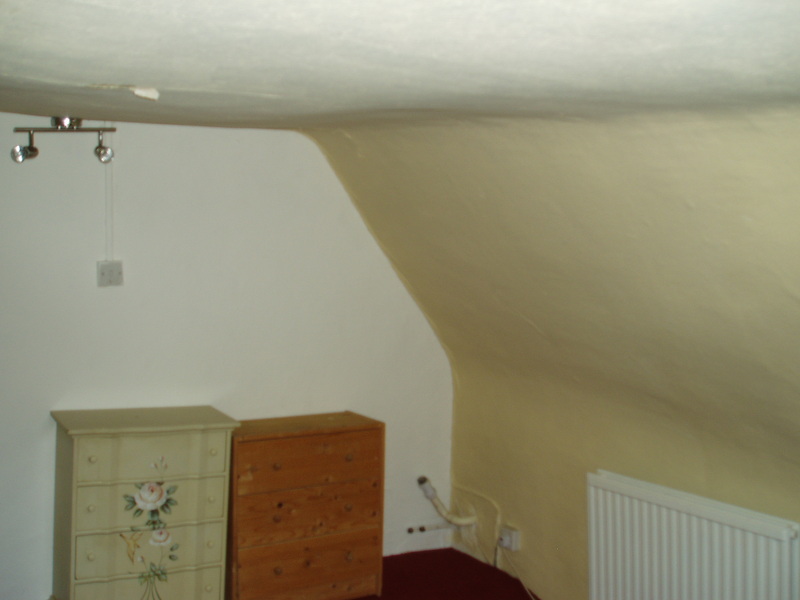 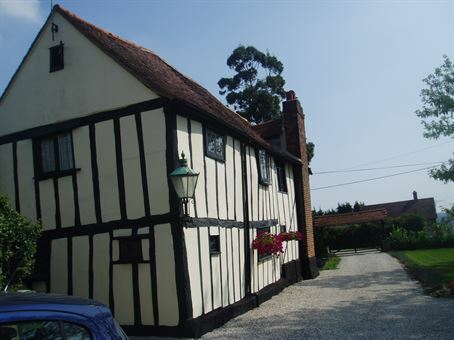 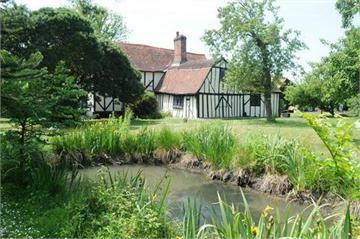 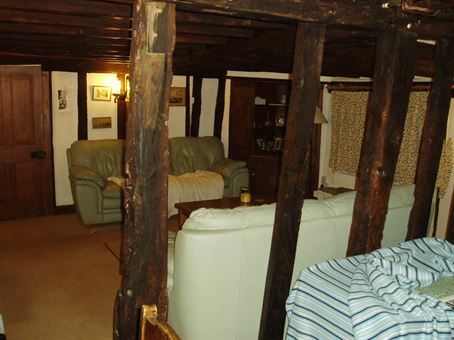 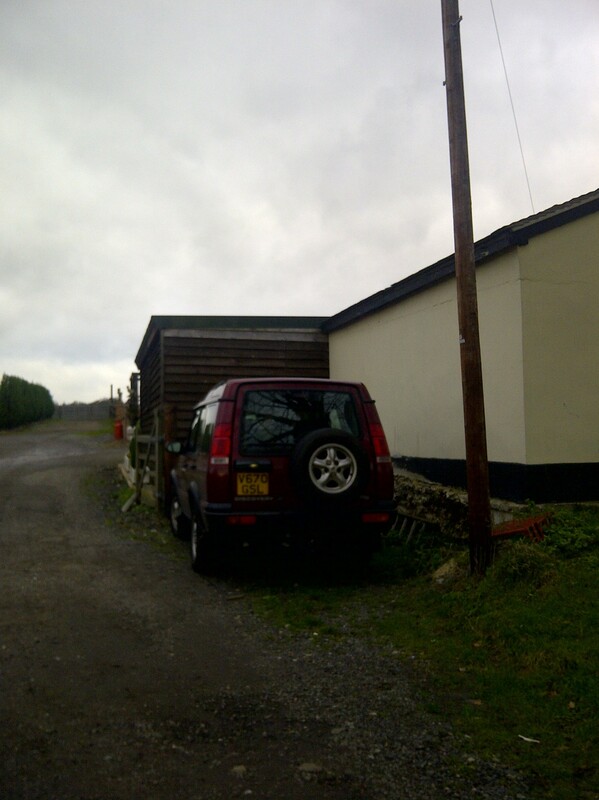 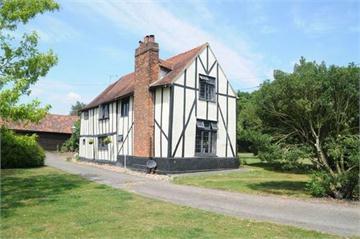 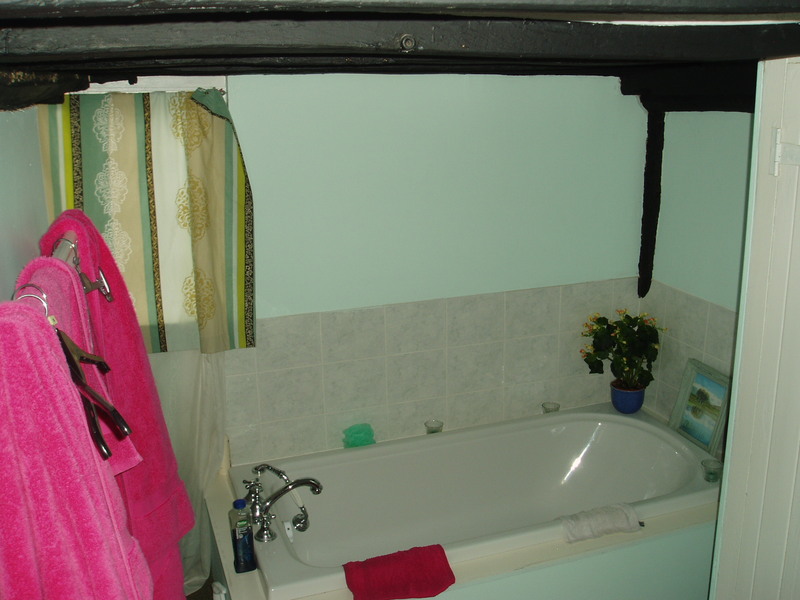 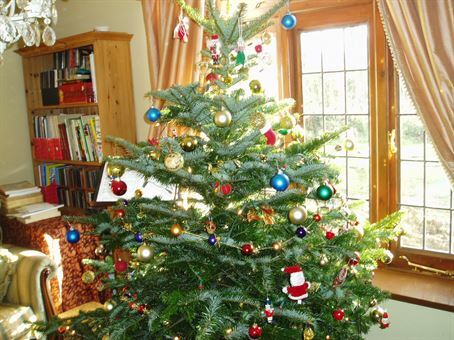 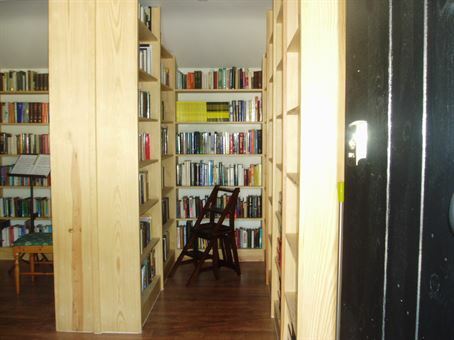 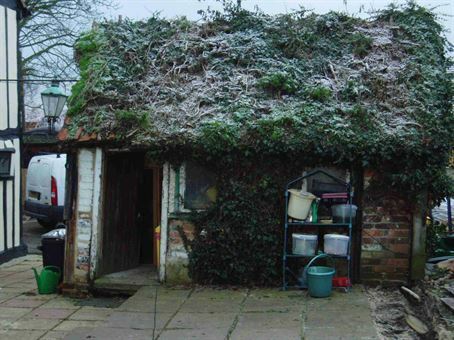 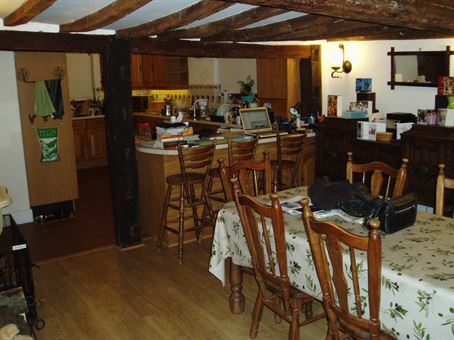 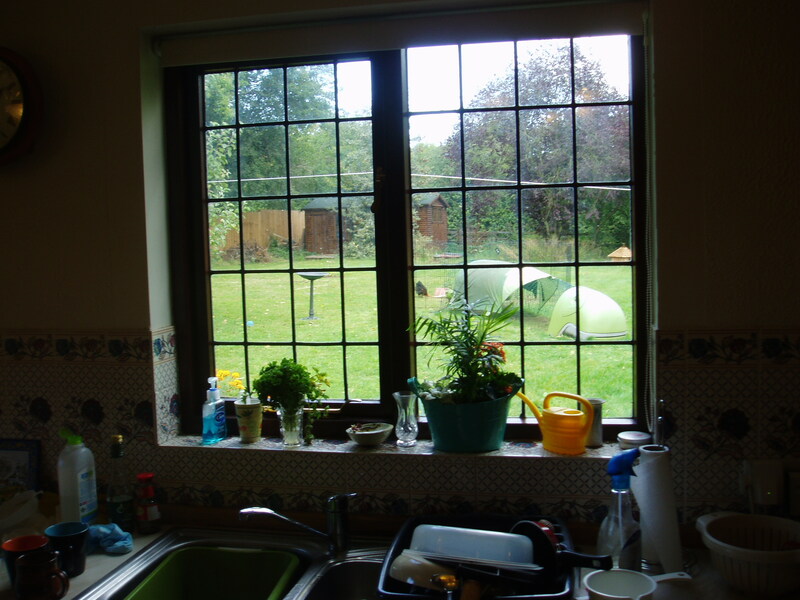 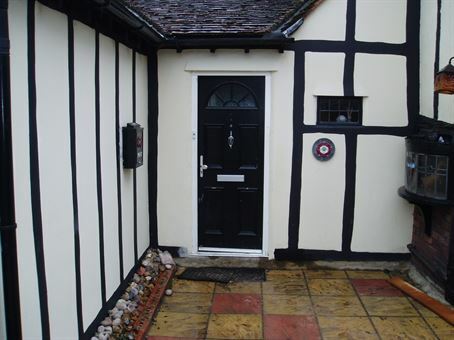 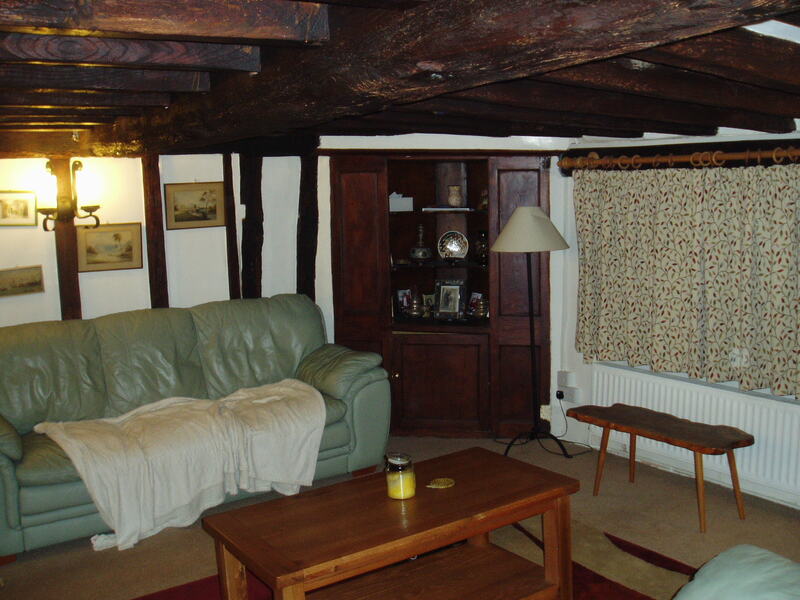 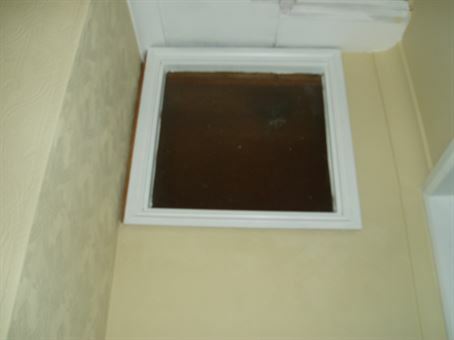 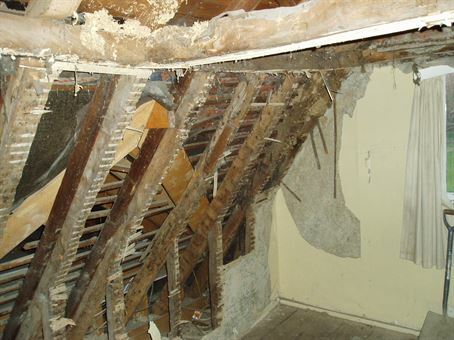 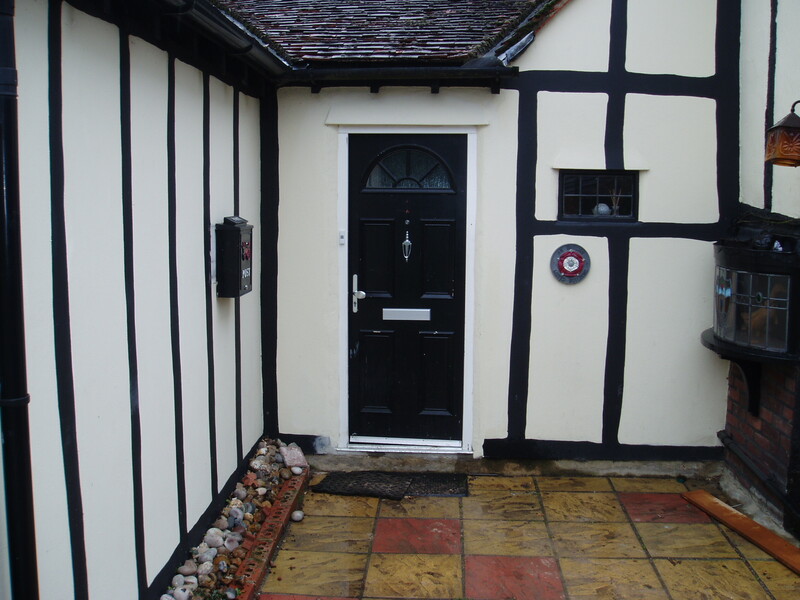 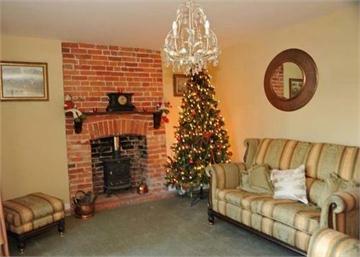 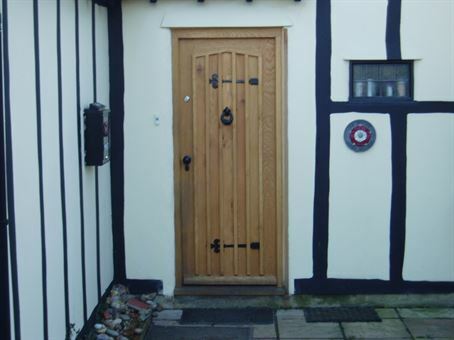 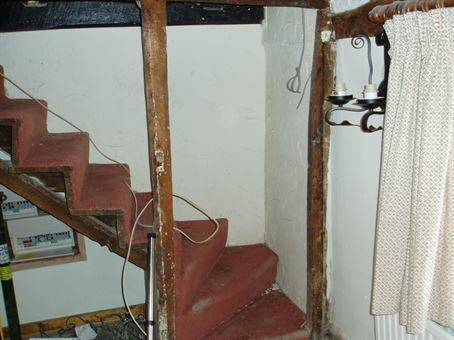 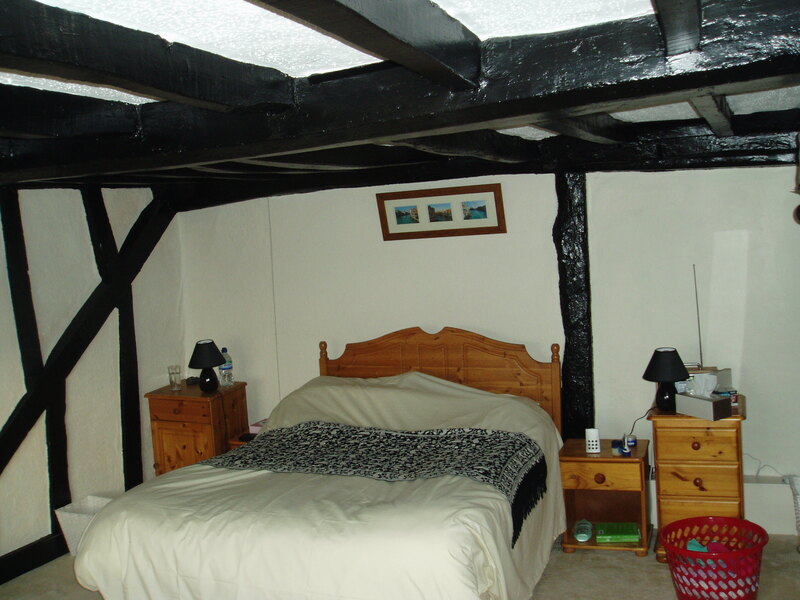 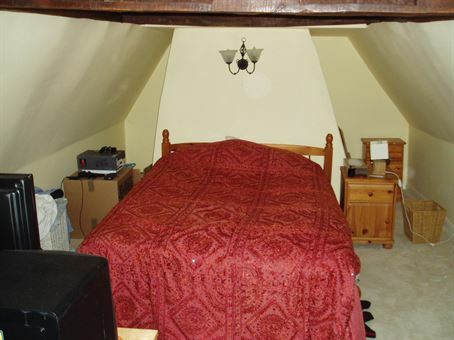 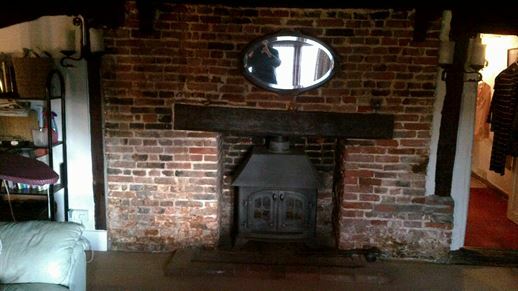 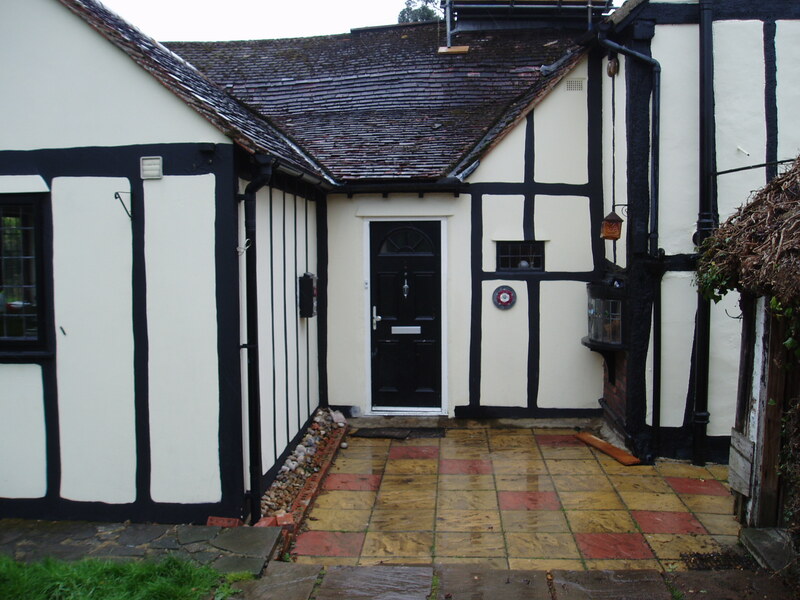 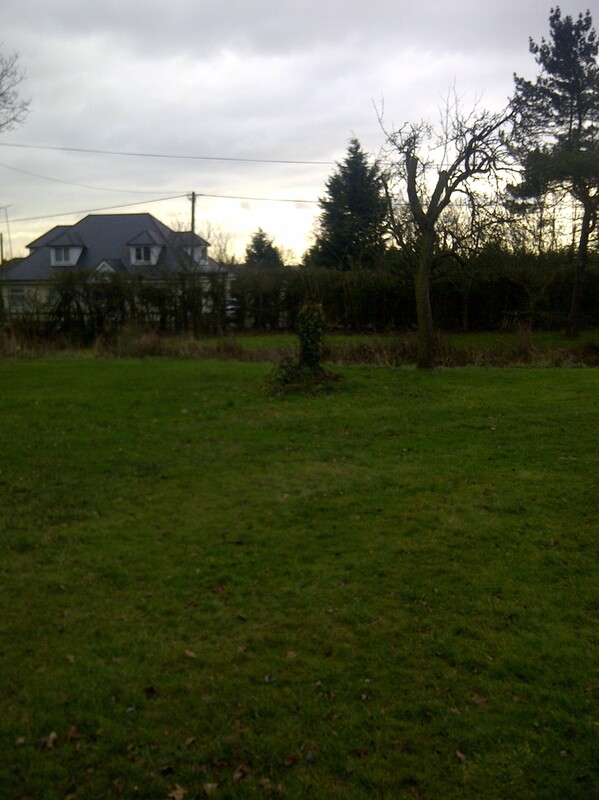 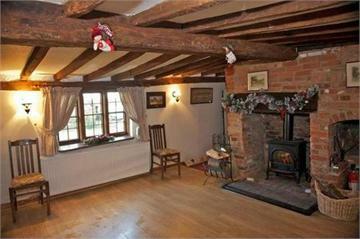 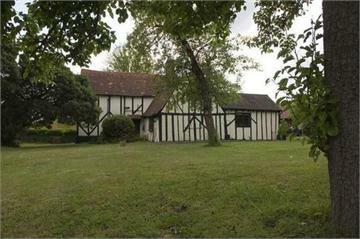 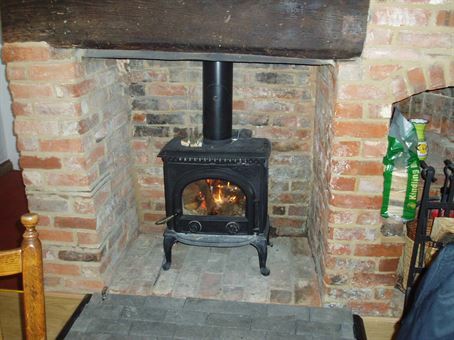 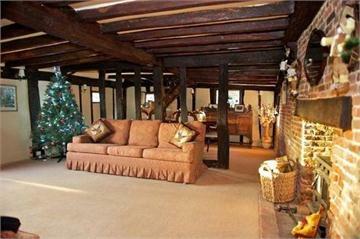 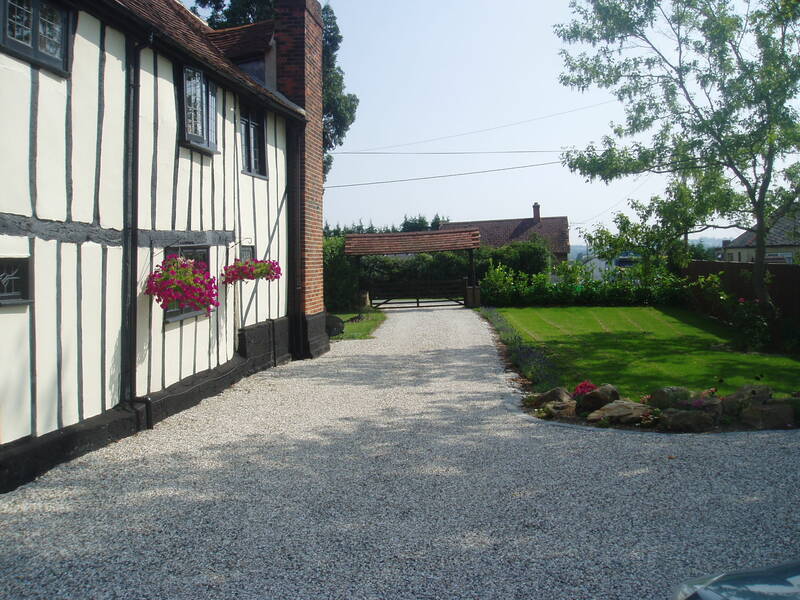 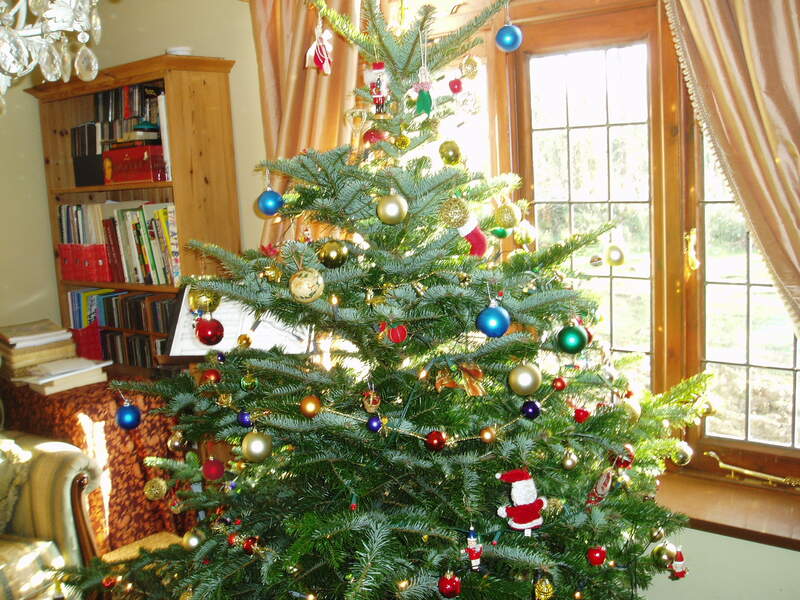 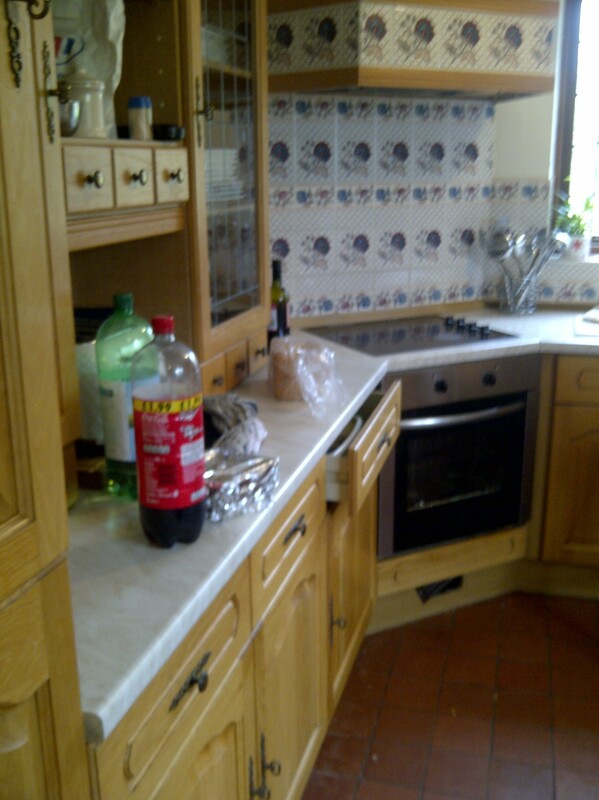 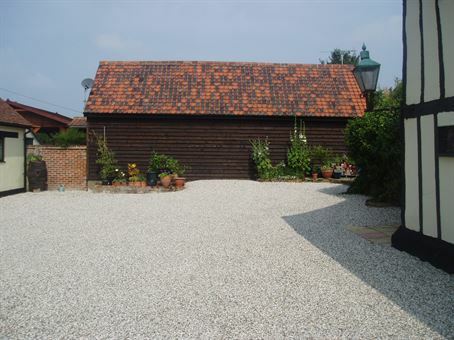 Photos from the Estate Agent's Website (January 2012). Photos from the pre-purchase Survey (January 2012). 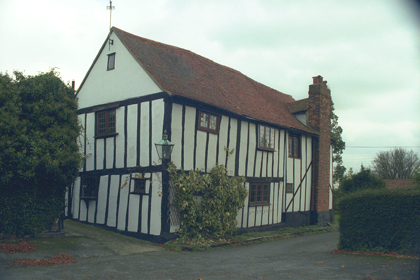 The photo from the Images of England website (October 1999). 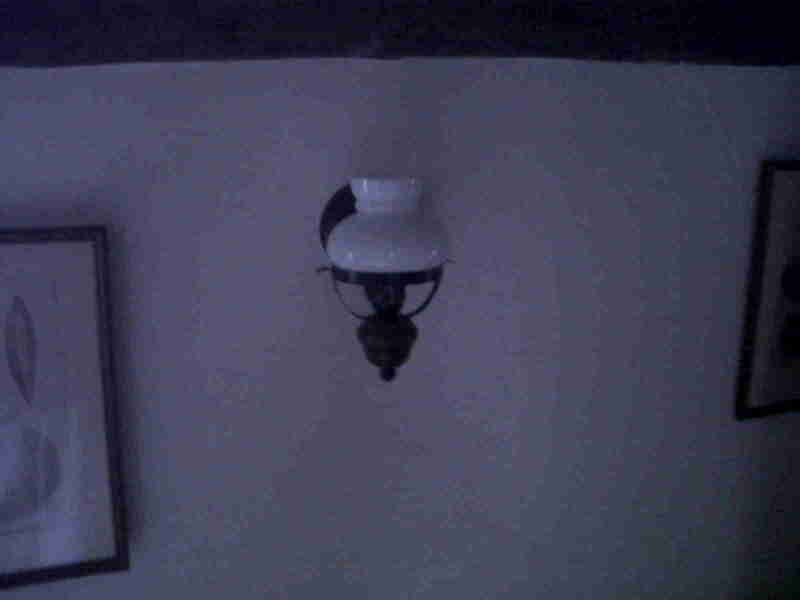 At the moment, these photos are rather random. 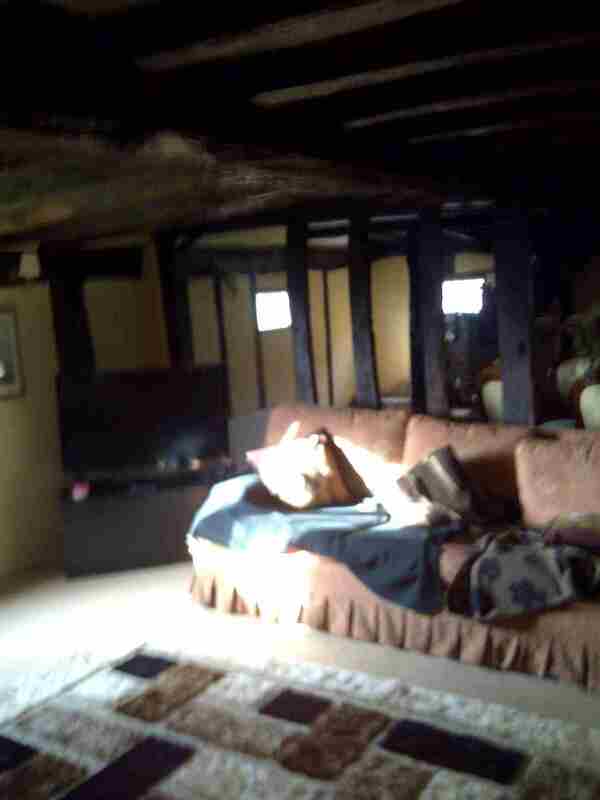 Many have been collated from my iPhone, though in general they were not taken on it. 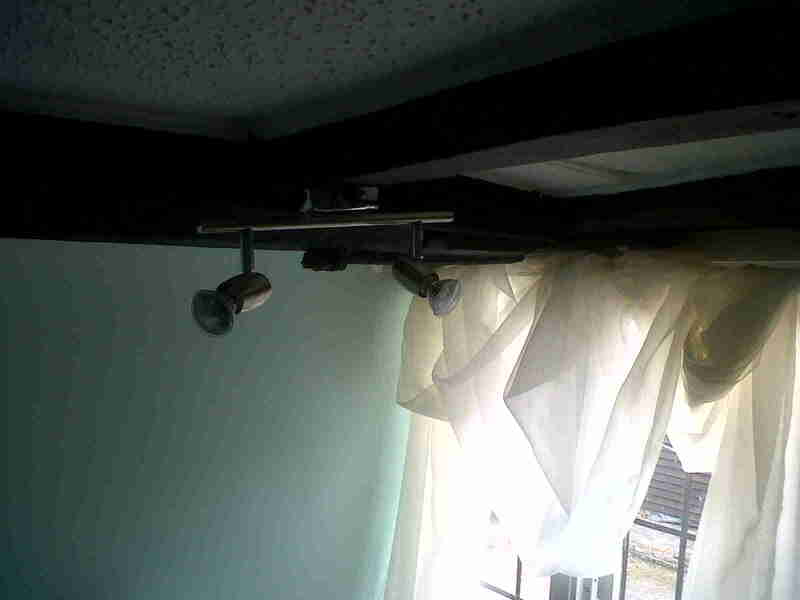 The rest were stashed away on my PC hard-drive. Some had no date embedded in the JPEG header - or recorded against the directory - and appear at the end. 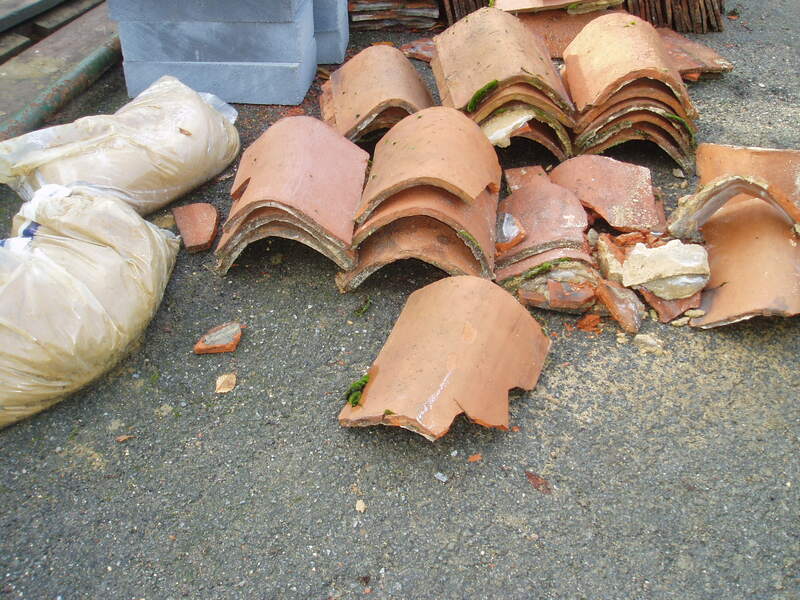 I'll try to sort these out in due course. 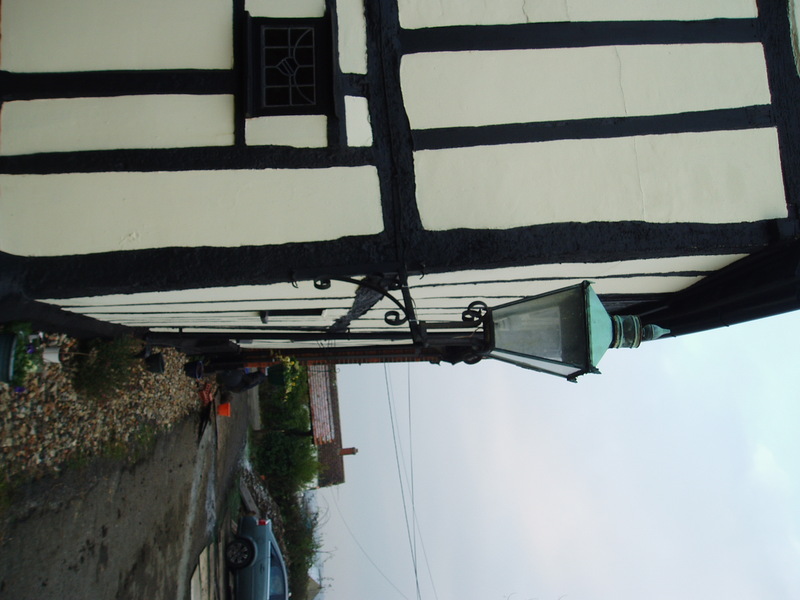 For my developing thoughts on the maintenance of such properties, see my Note "Tottering Towers & Listing Buildings3". In due course I'll complete the narrative section there that describes my own experiences with Coxes Farm, though I've already made some progress. Click here4 for a couple of technical remarks on the webpage. Click on the links below to jump to the photos for a particular month, or scroll down. 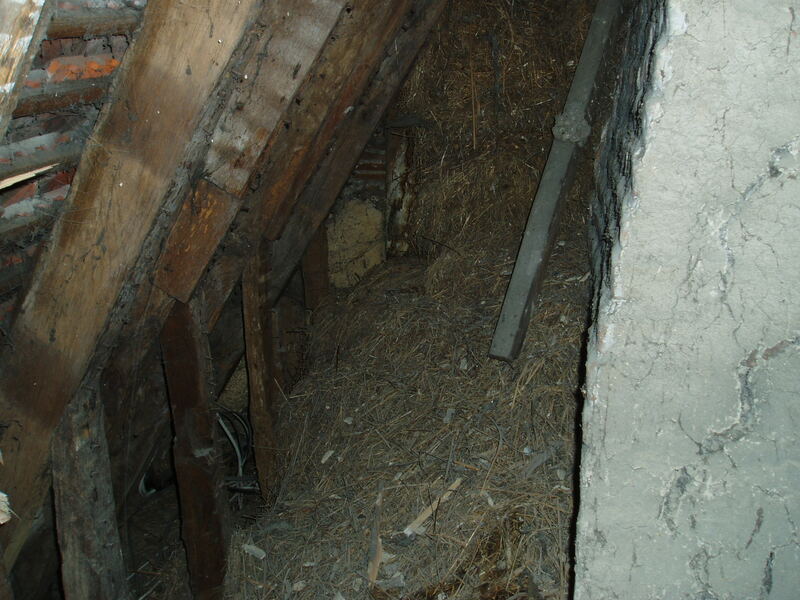 Mouse-over the date pops-up a summary of the situation that month. 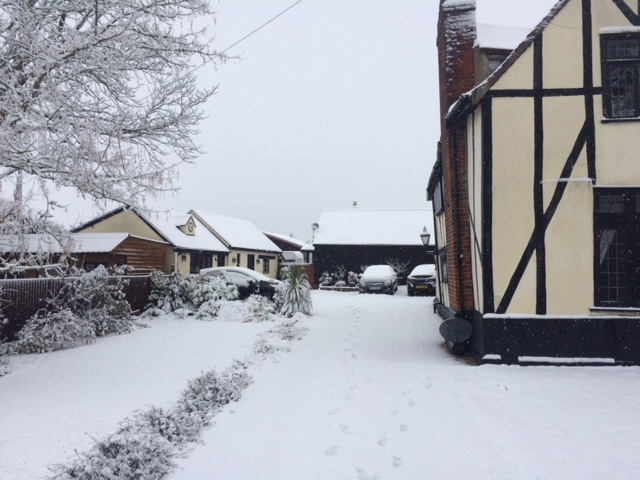 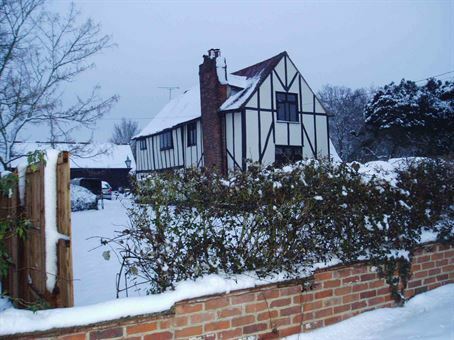 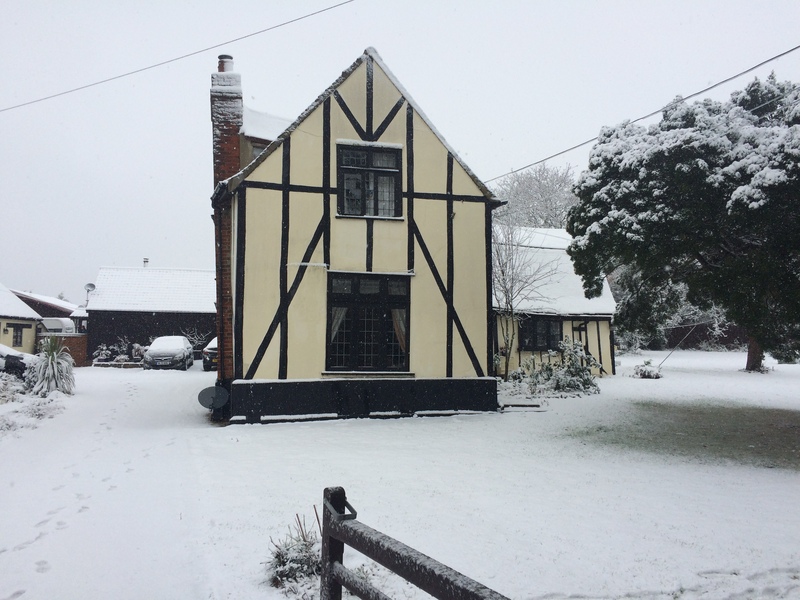 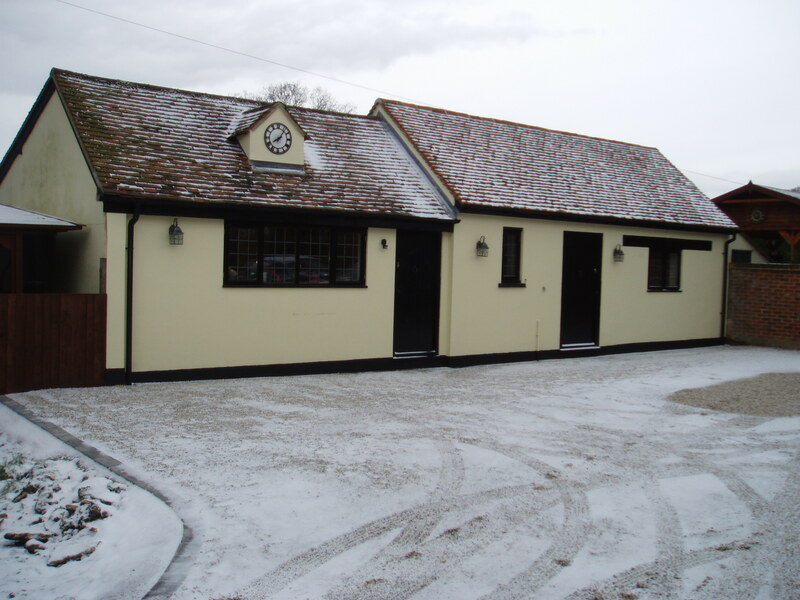 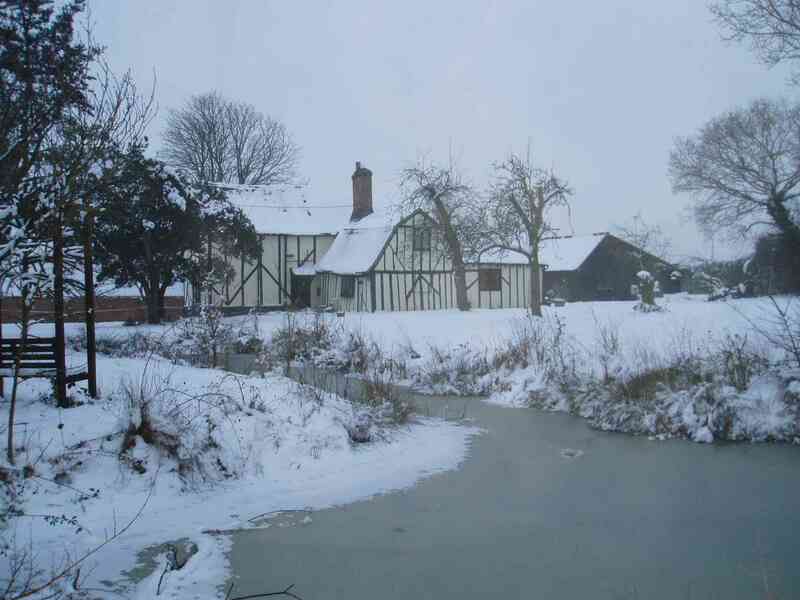 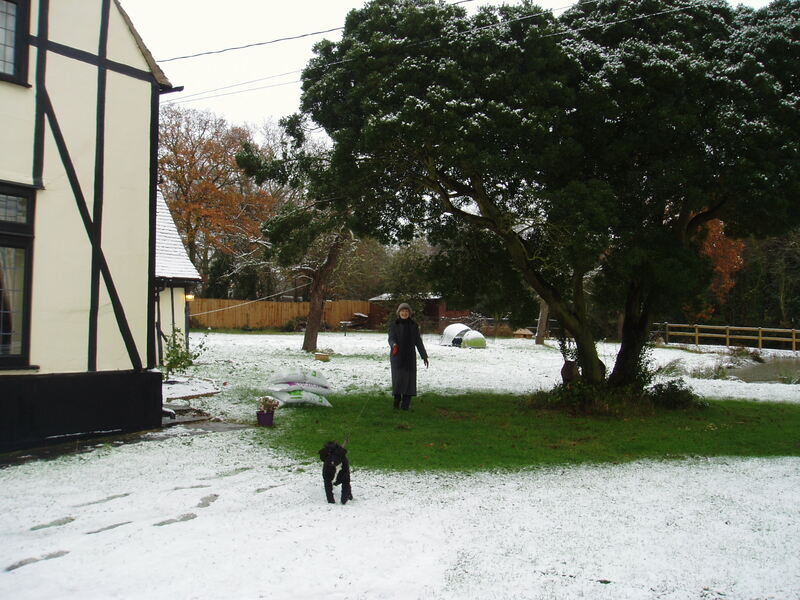 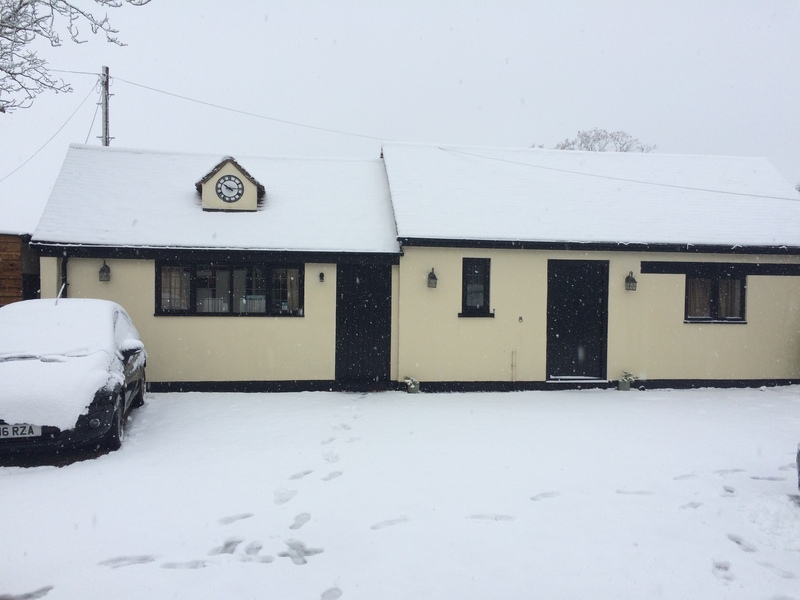 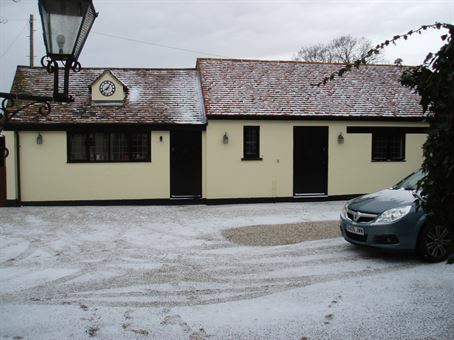 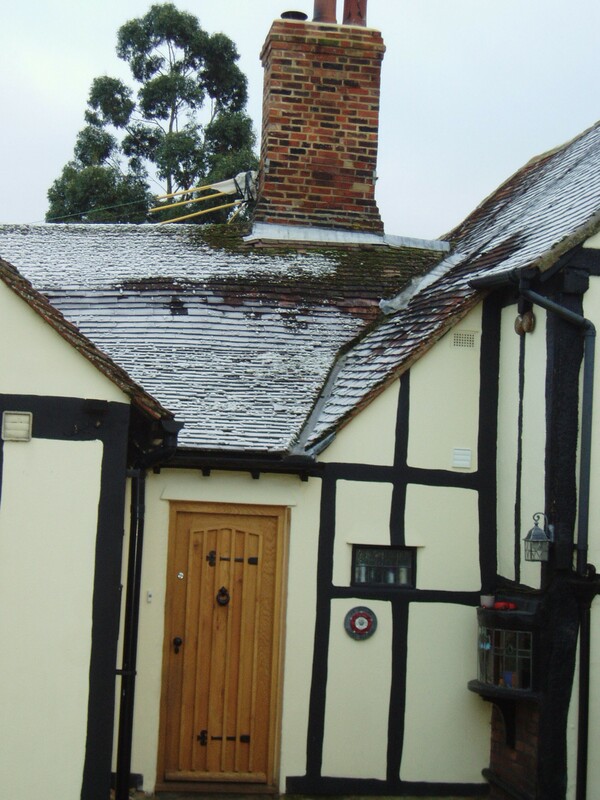 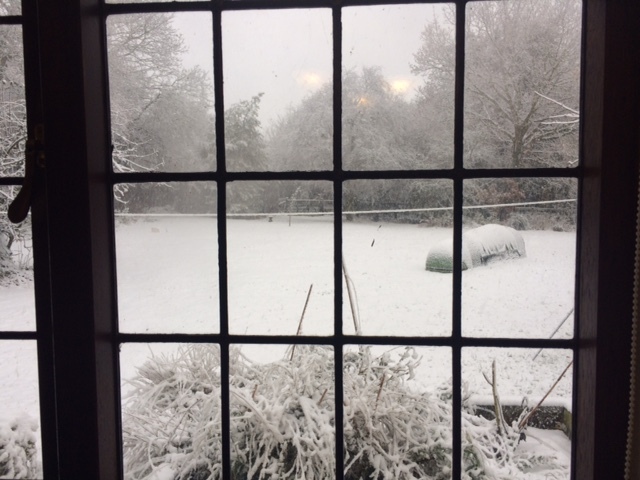 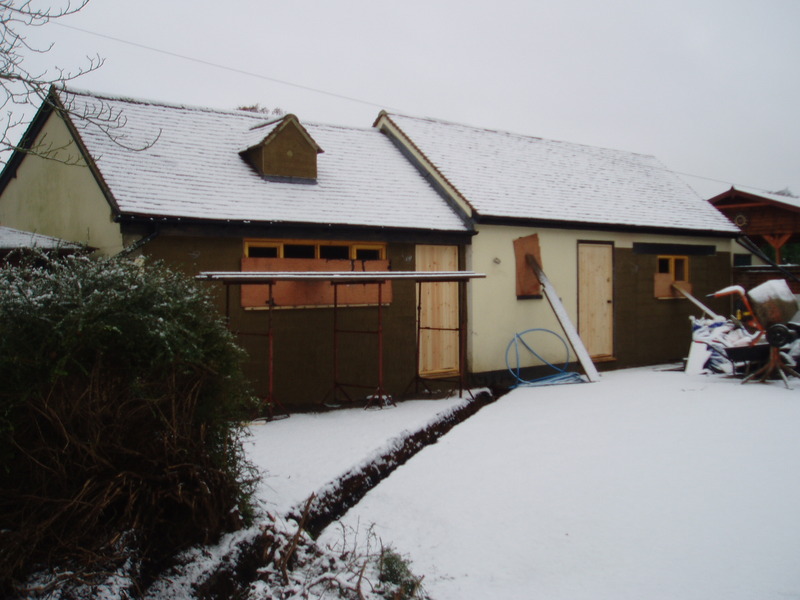 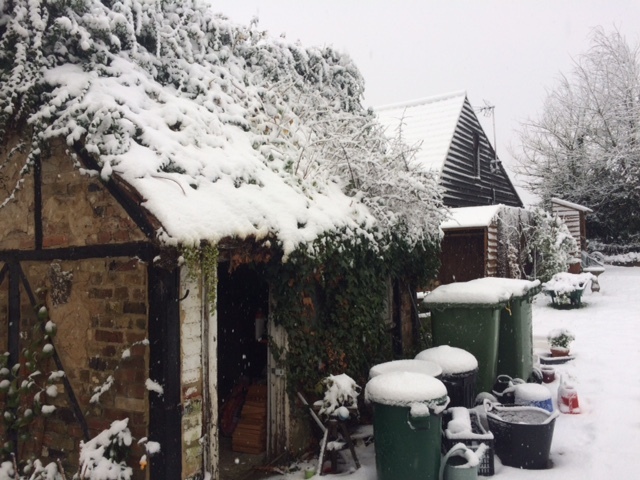 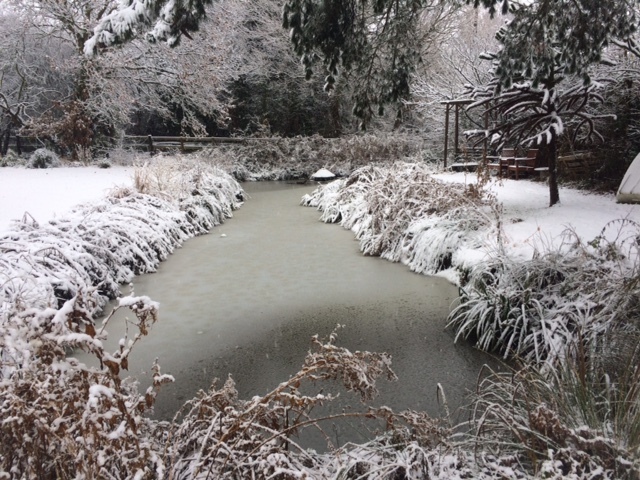 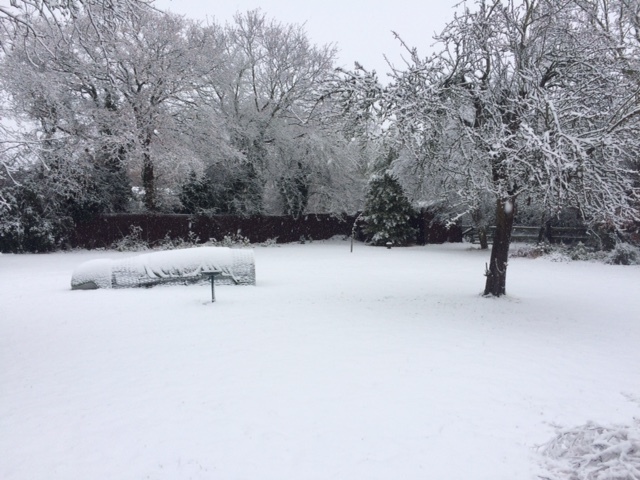 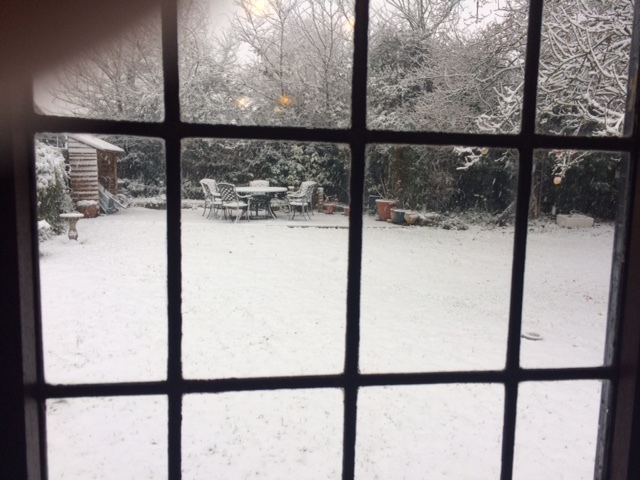 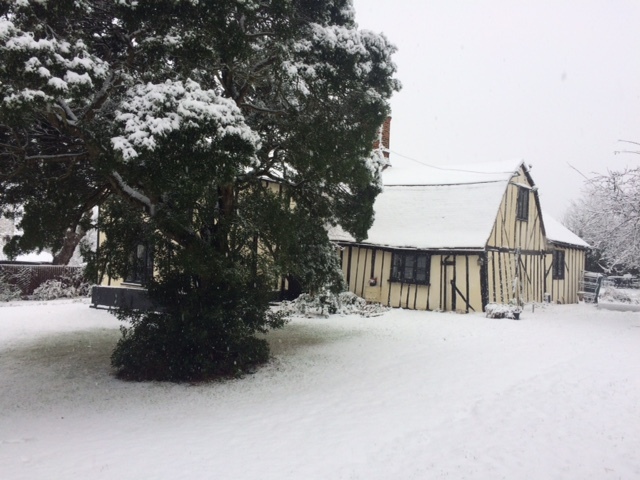 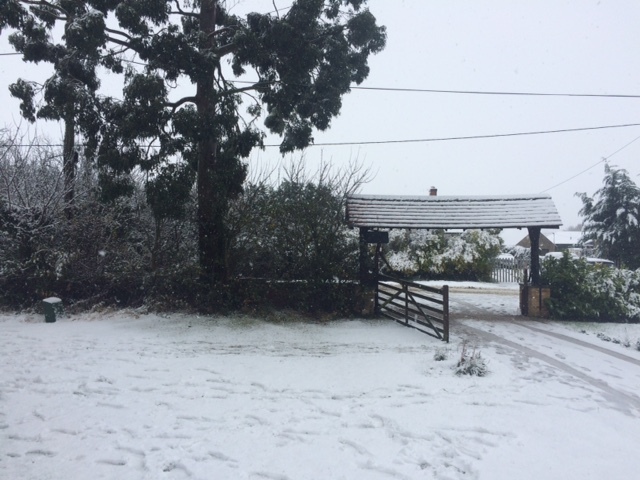 Coxes Farm in the snow - before the crack appeared. 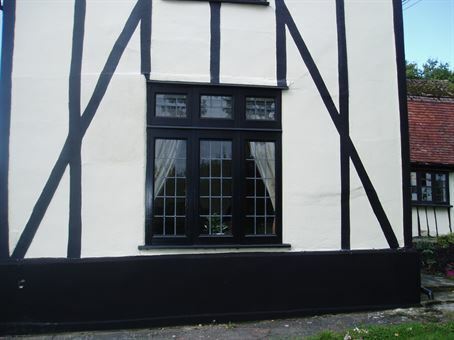 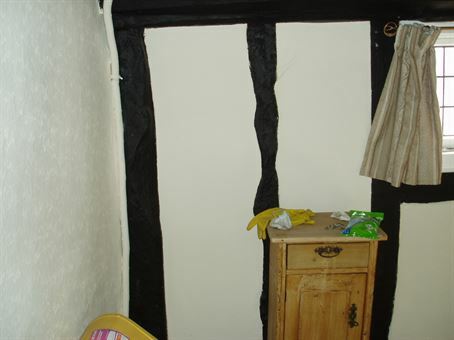 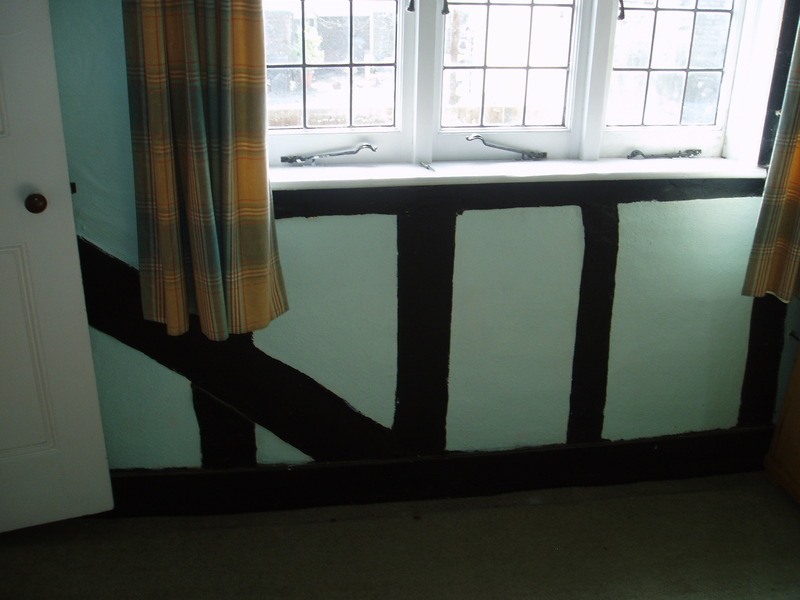 The 'wonky wall' - that juts out to the side of the house, to the side of the dining room and supports the 'wonky room' (the spare bedroom). 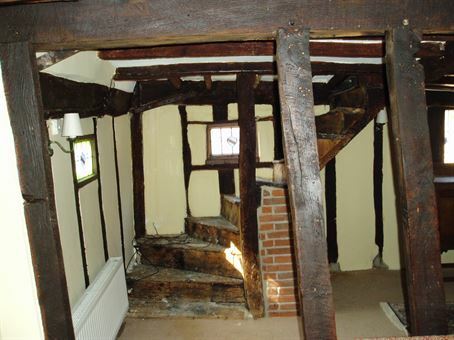 This has always looked the least stable, though structural engineers haven't been worried by it. 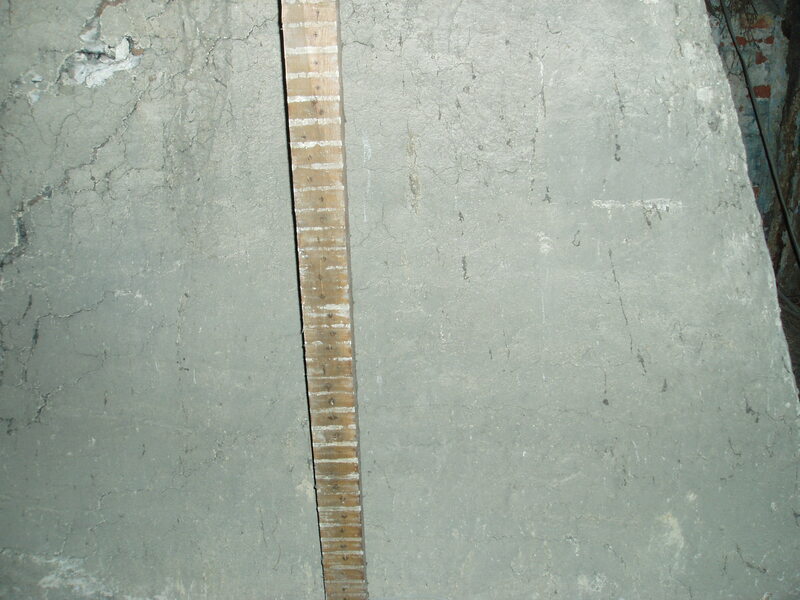 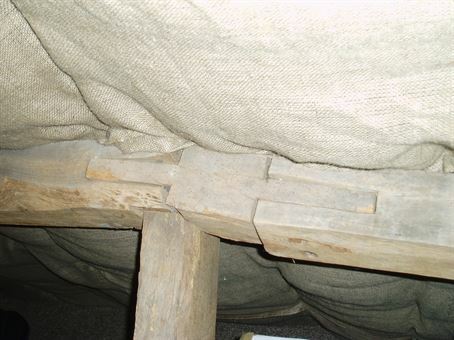 The central post is compromised, as are several struts, and there's most likely no surviving sole plate. The bressumer and corner posts seem sound, however. The electrics enter through this wall, on the inside of which are three fuse-boards. It has been known to let water in. 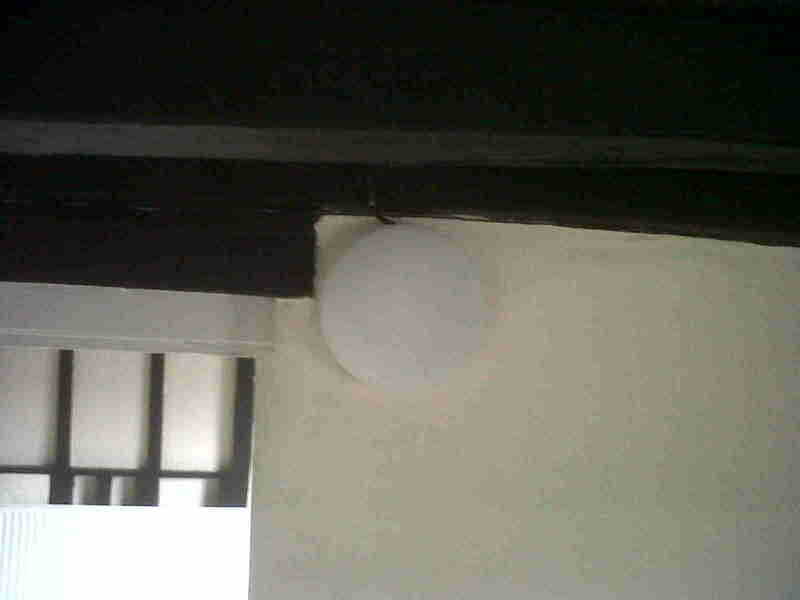 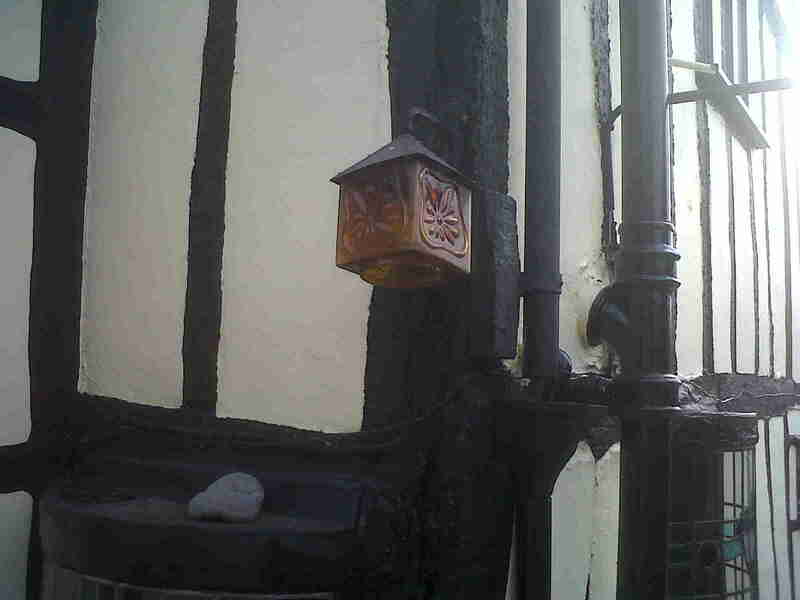 A plate to the right of the bedroom window has moved out from its place somewhat. Note that there's no sign of the subsequent gaps appearing in the brick infill at this stage. 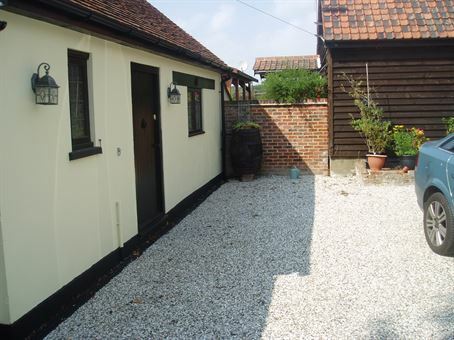 The (probably modern, and supportive) brick infill seems sound, but the patio is too high and has covered the sole plate. 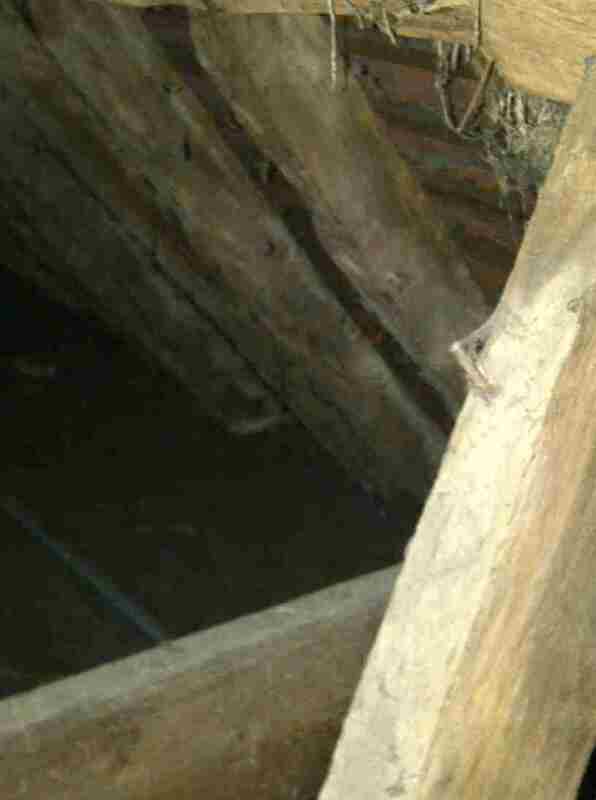 The timbers around the central 'chevron' are in poor condition. 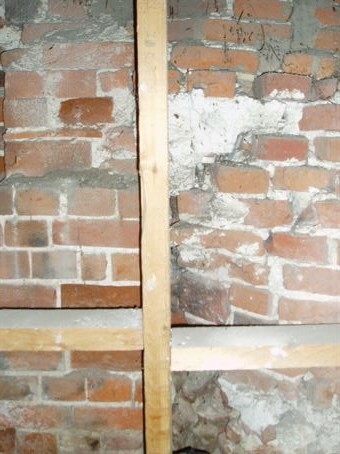 The 'wonky wall' in profile, showing the bulge. 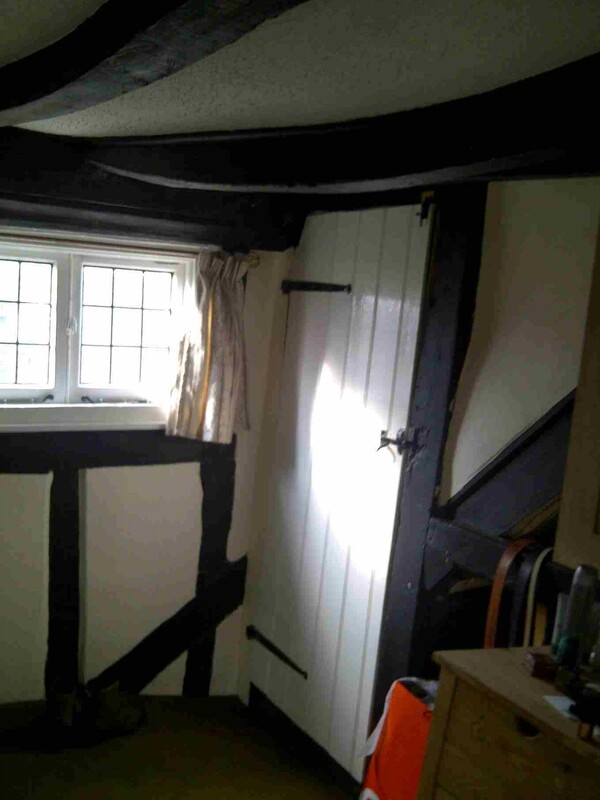 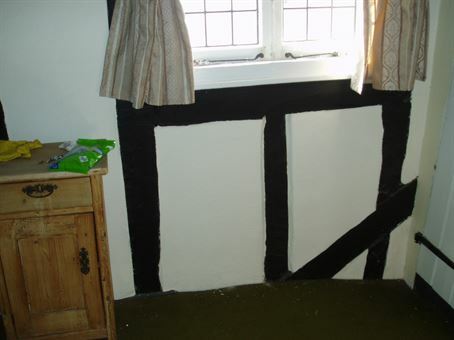 More photos of the 'wonky wall' and the adjacent kitchen - a 1980's addition to the 15th / 16th century original. 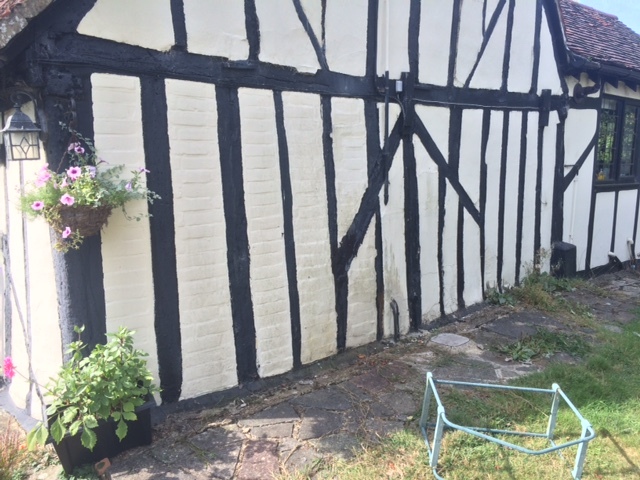 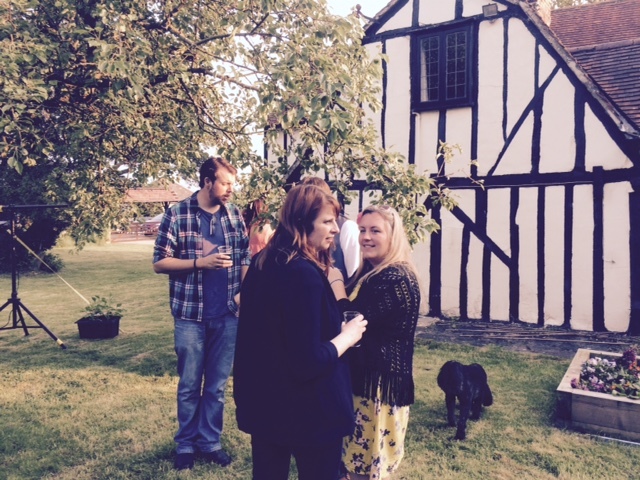 Henry the dog and unknown guests in front of the 'wonky wall'. 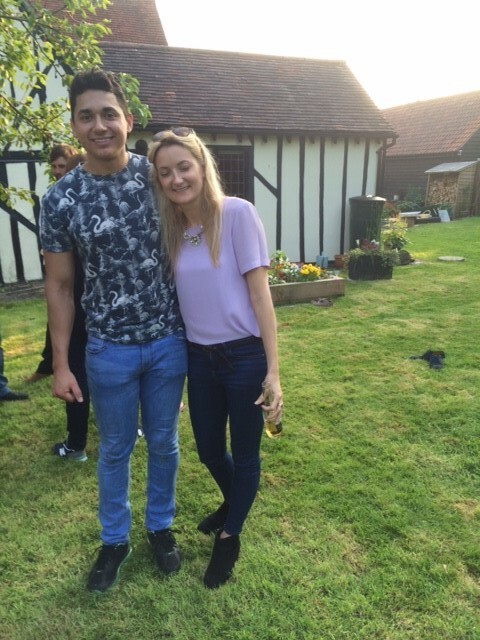 Naomi & Leandro. 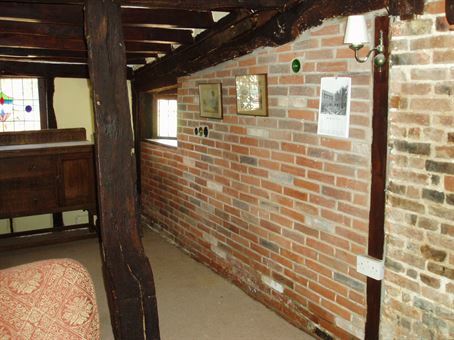 'Wonky wall' and kitchen in the background. 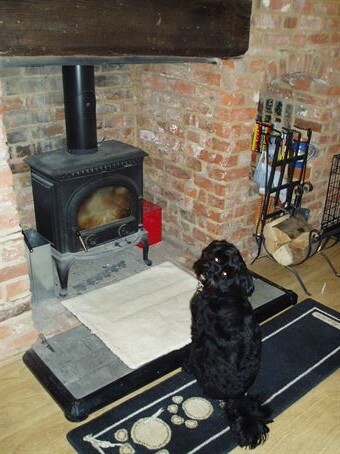 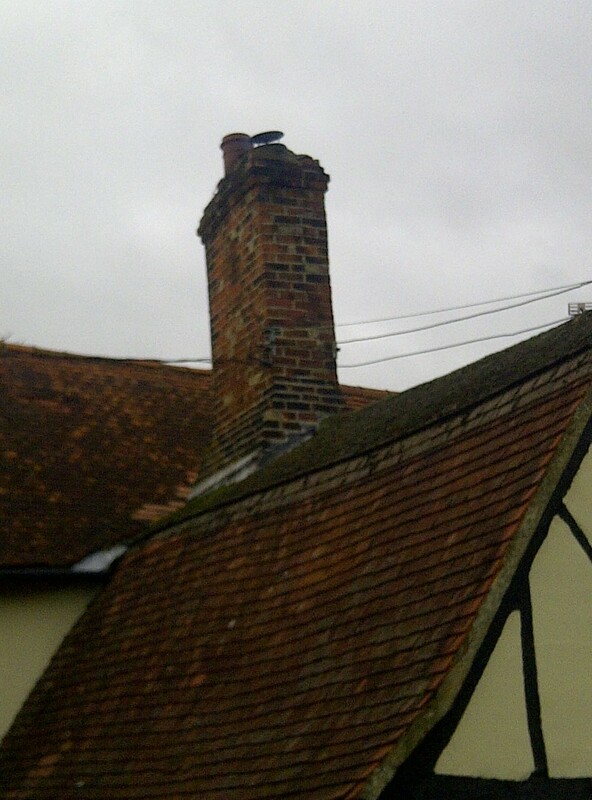 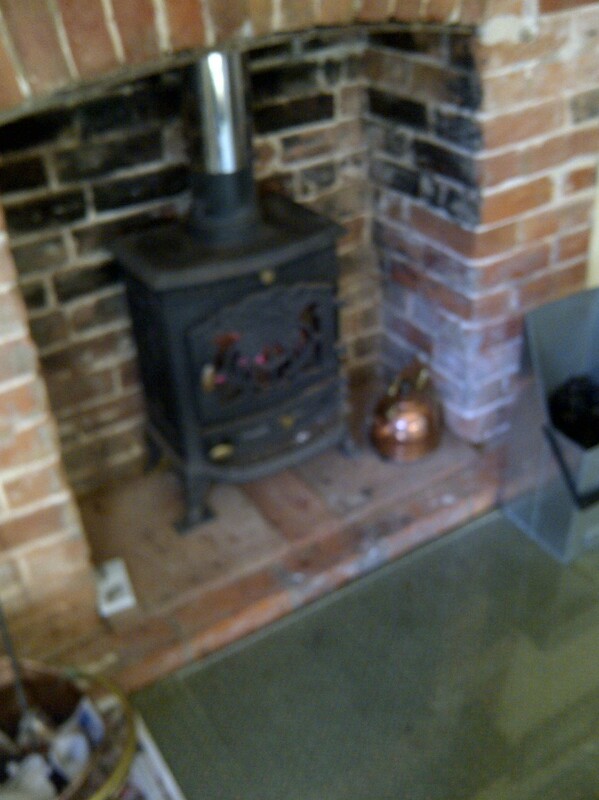 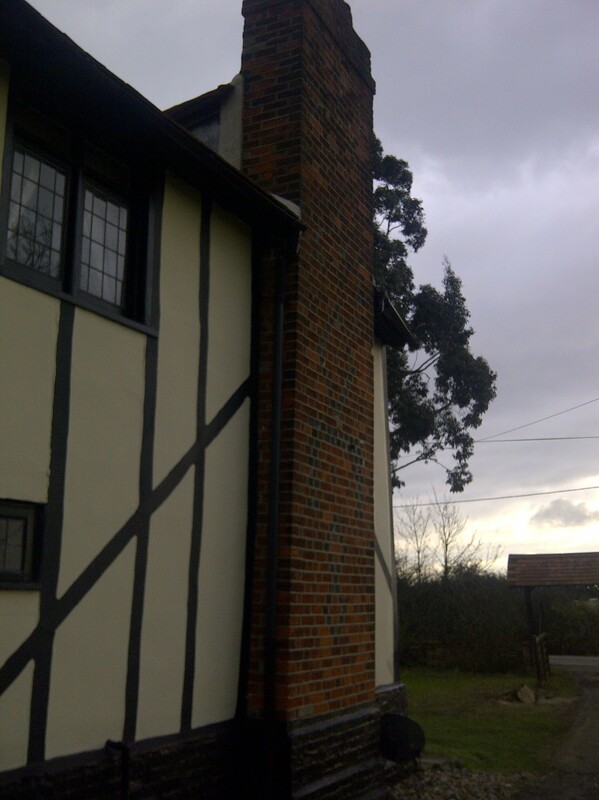 Photos taken the first time we were trying to get the lounge chimney lined. For a later attempt, follow this link5. 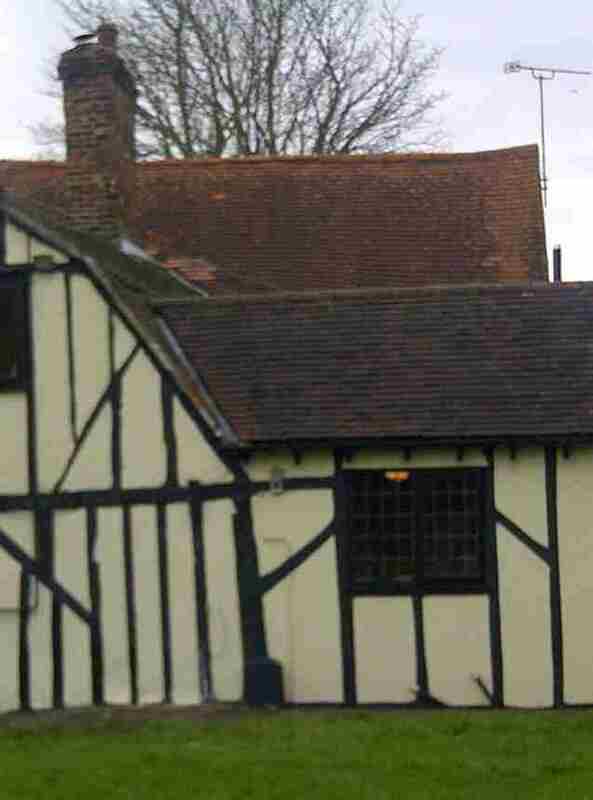 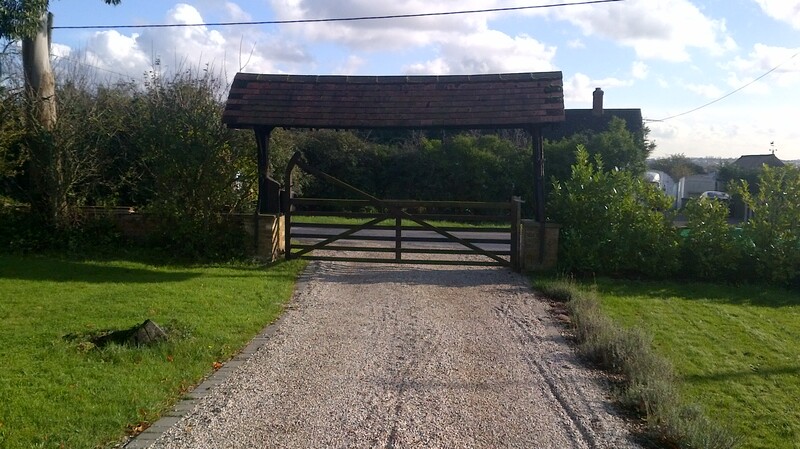 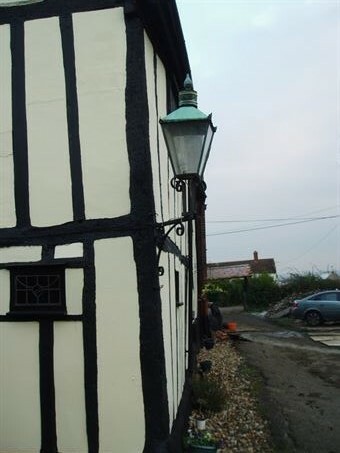 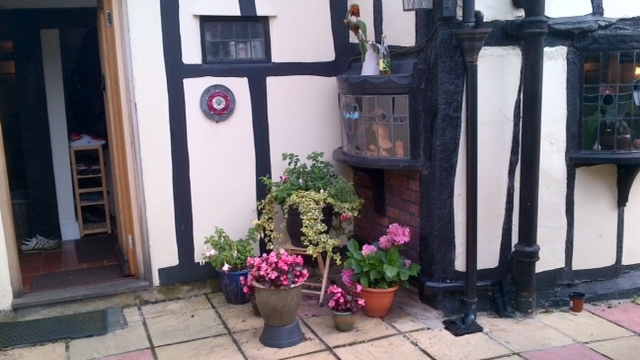 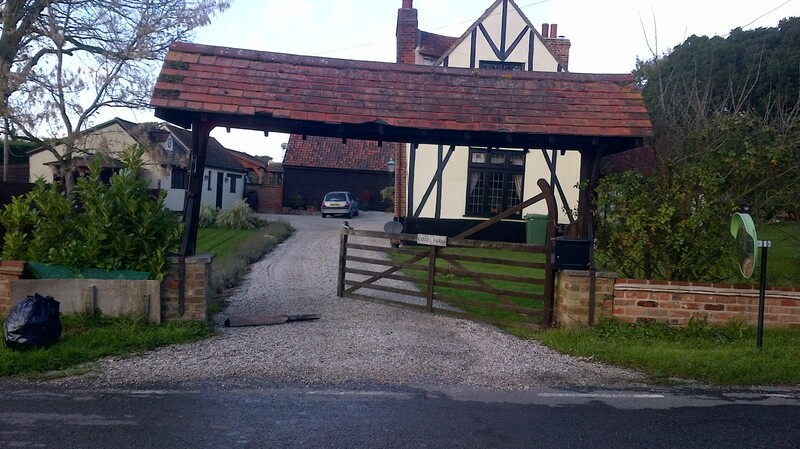 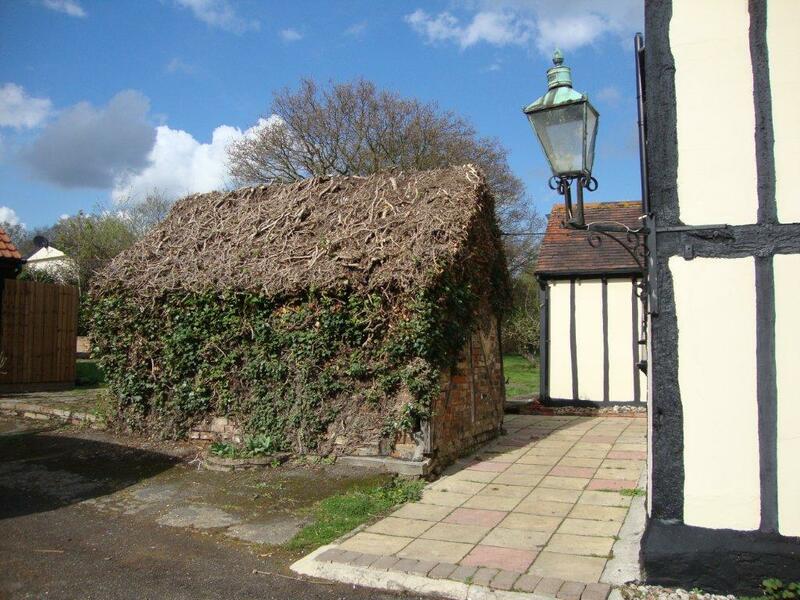 The lych gate after Julie had shunted the left-hand column six inches with the car. 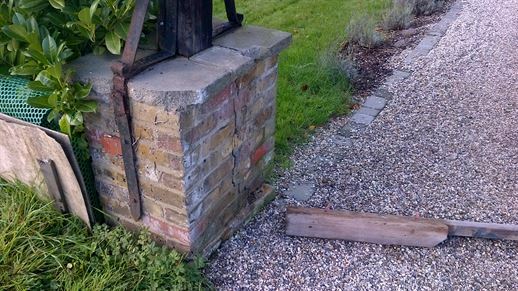 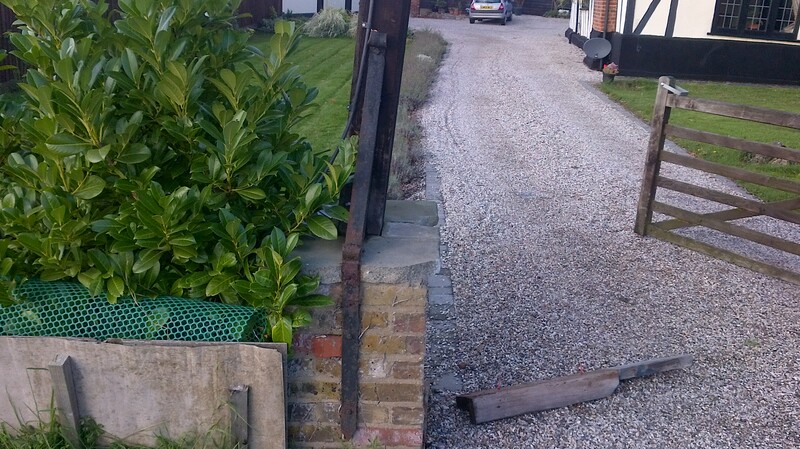 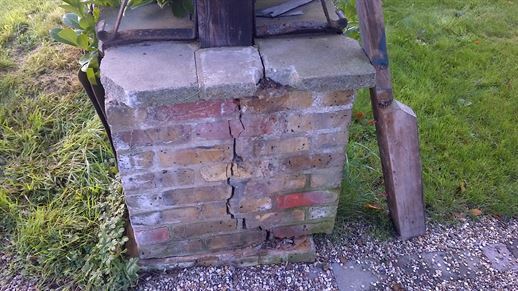 Turned out the post was rotten as well, and the ironwork was rusted, but insurance paid out for the accident. 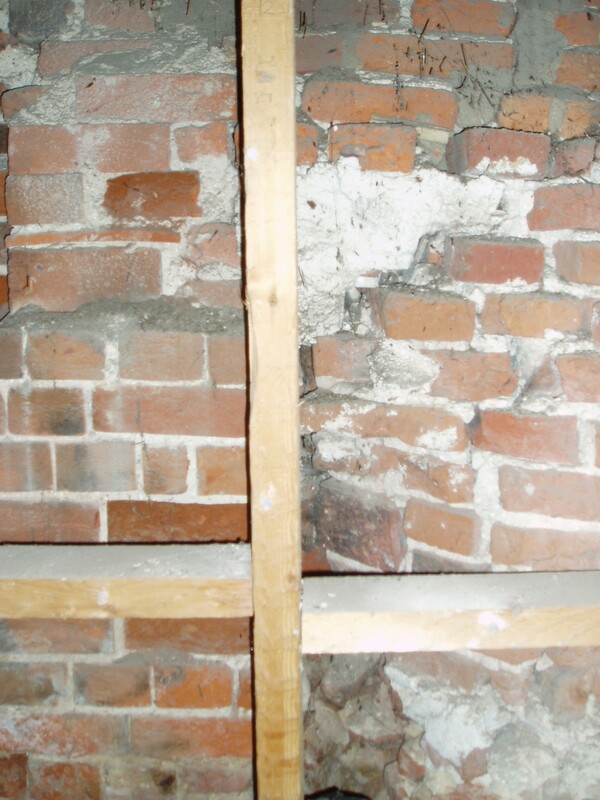 Fixed by a chap with an impressive-sounding name, but who knew nothig about lime mortar. 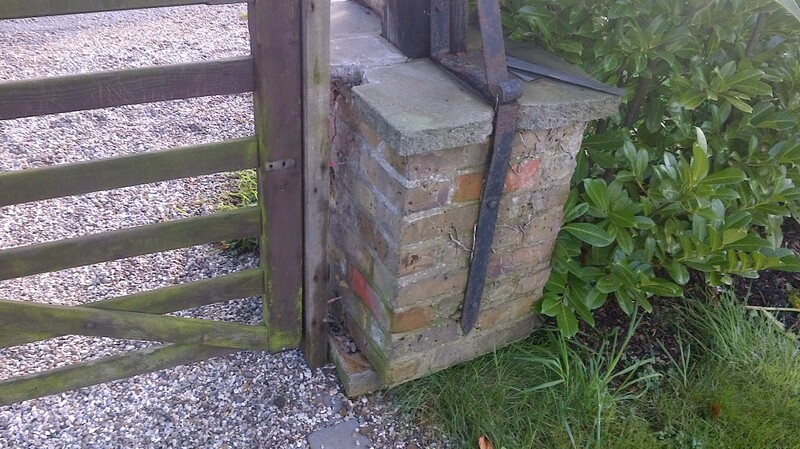 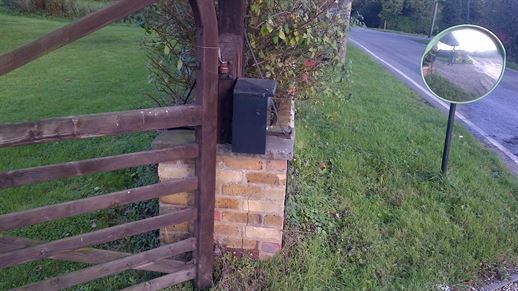 Still, the post and the ironwork were replaced fine, but the lime morter was frost-damaged. 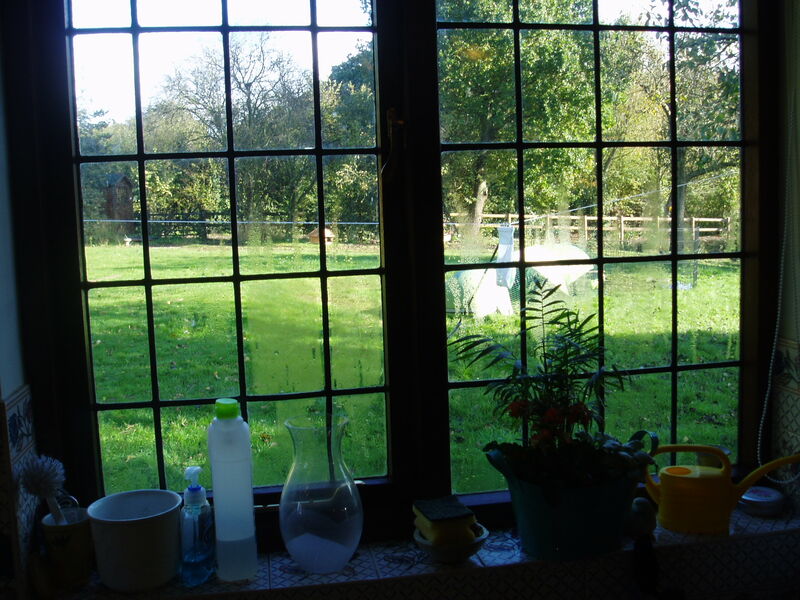 Random photos of the house and garden. 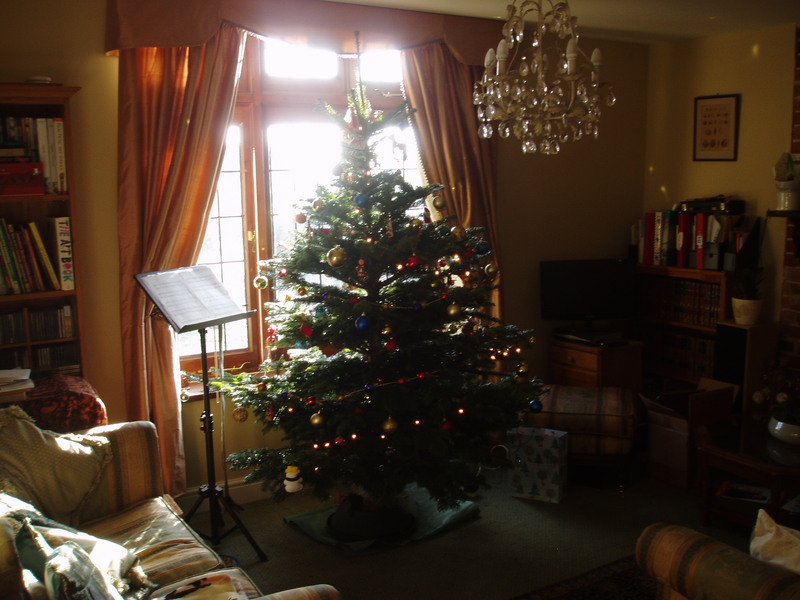 Much as the previous year - Nothing much happening. 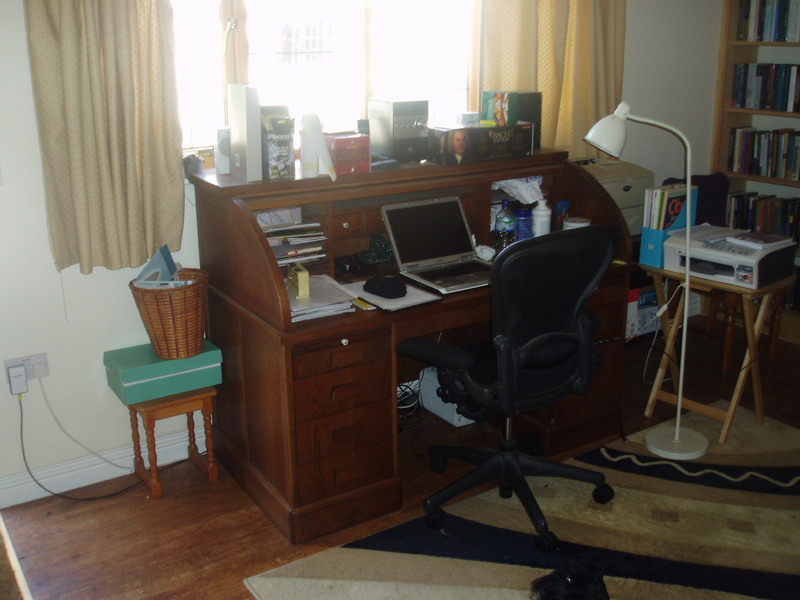 Shows my desk and a portion of the library. 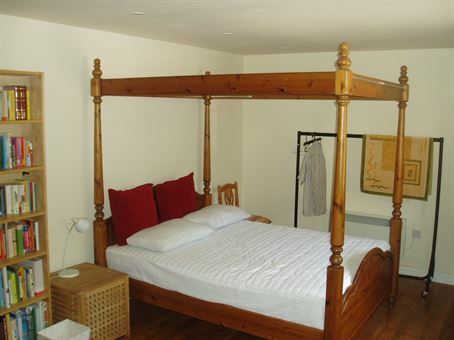 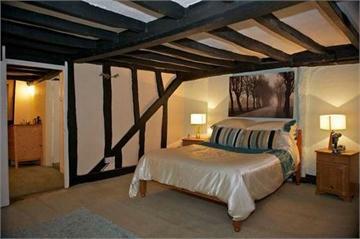 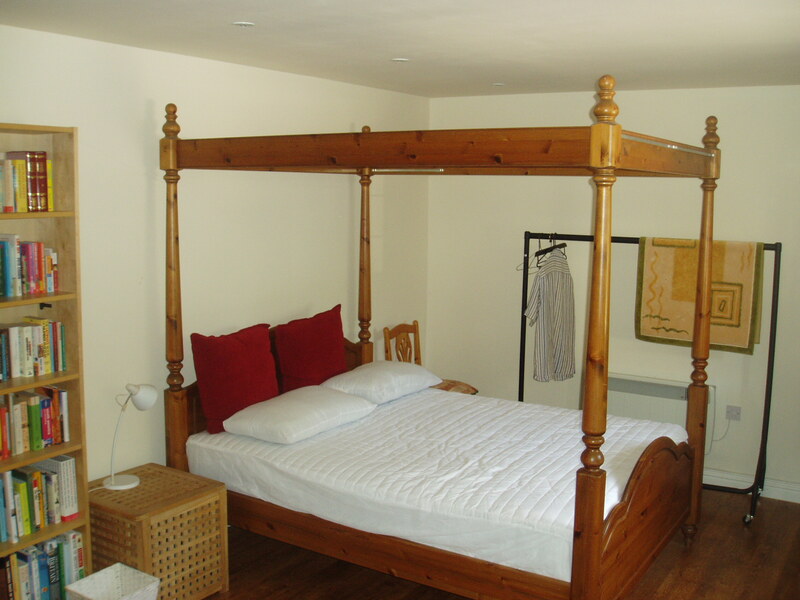 Shows the four-poster in the guest room. The attic sometime after being made habitable. 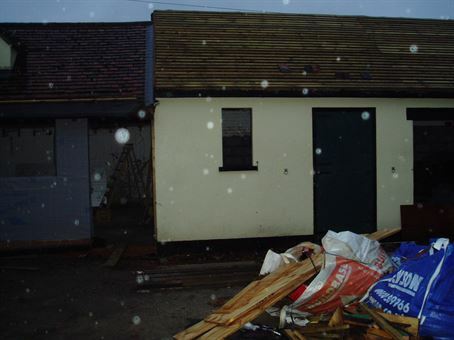 I used it as a study while the outbuildings were being converted. 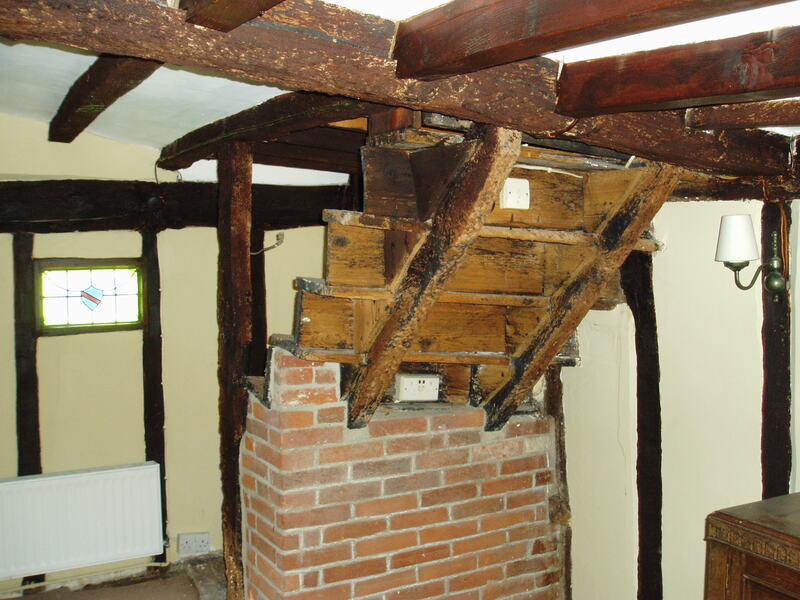 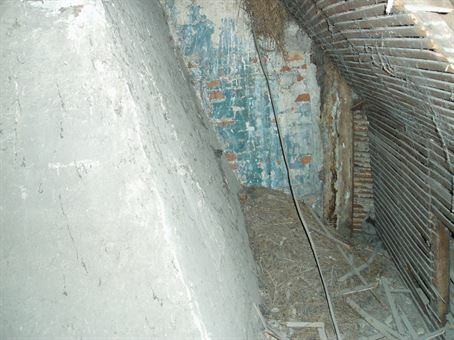 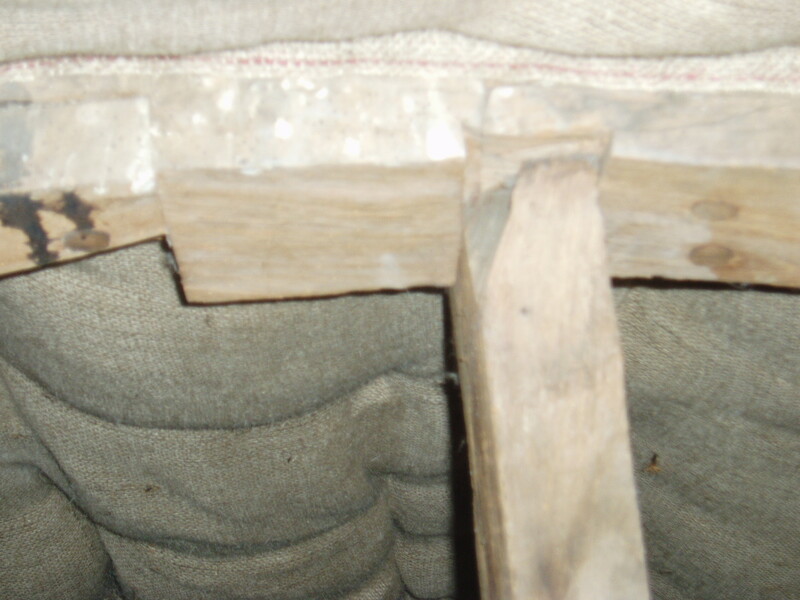 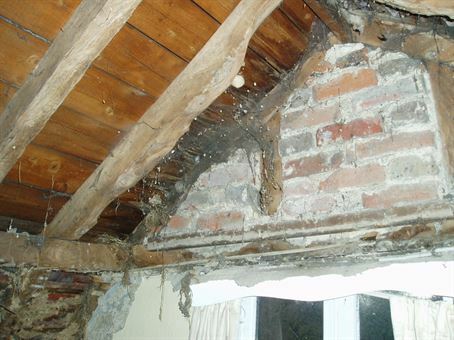 Photos show the struts and beams that support the tiled roof. Of particular interest are the joints, one of which is compound and unusual. 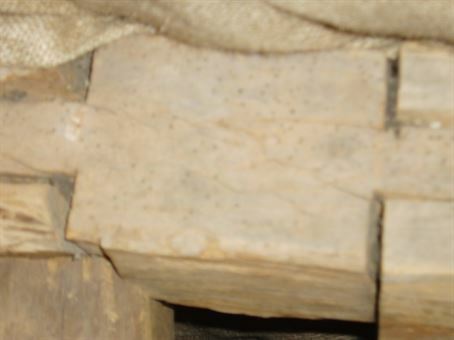 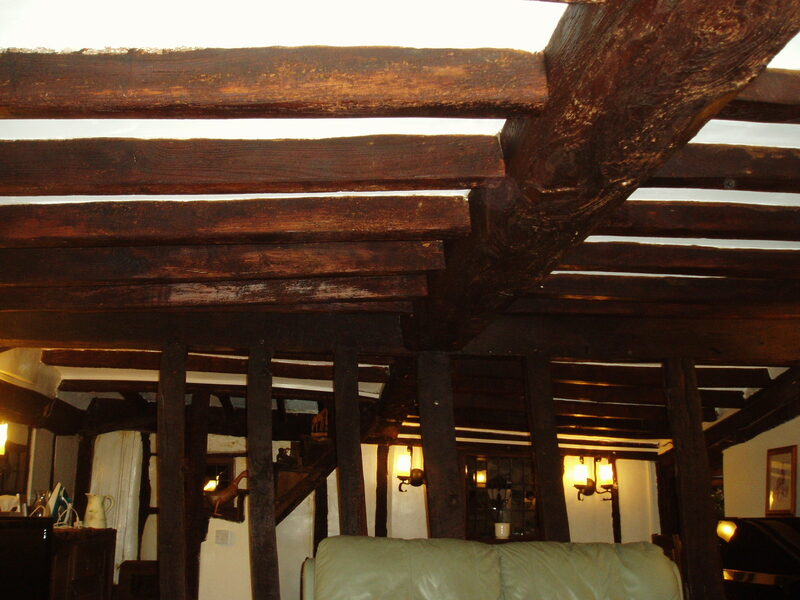 Note the wood stain used at the base of the struts and wall posts. This was added quickly prior to the carpet being laid to make it easier to paint the beams fully later without spoiling the carpet. 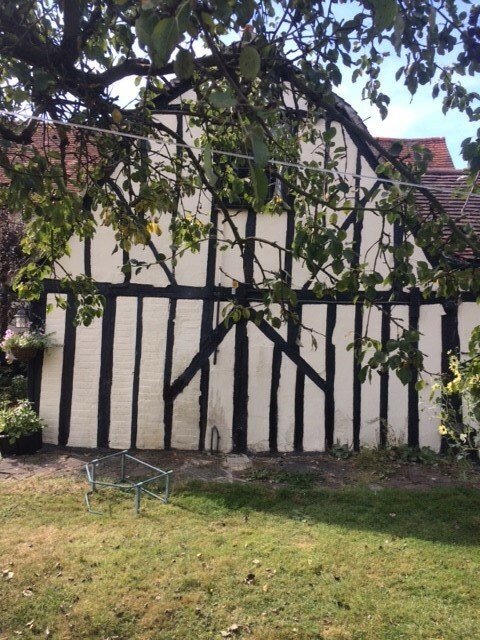 However, I was then advised by one of the team at Cressing Temple Barns that it's best to leave the wood unpainted - as in the barns - if it had not yet been painted, so I held fire, leaving the rather silly situation as photographed. 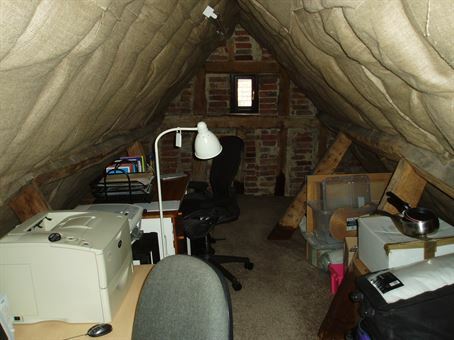 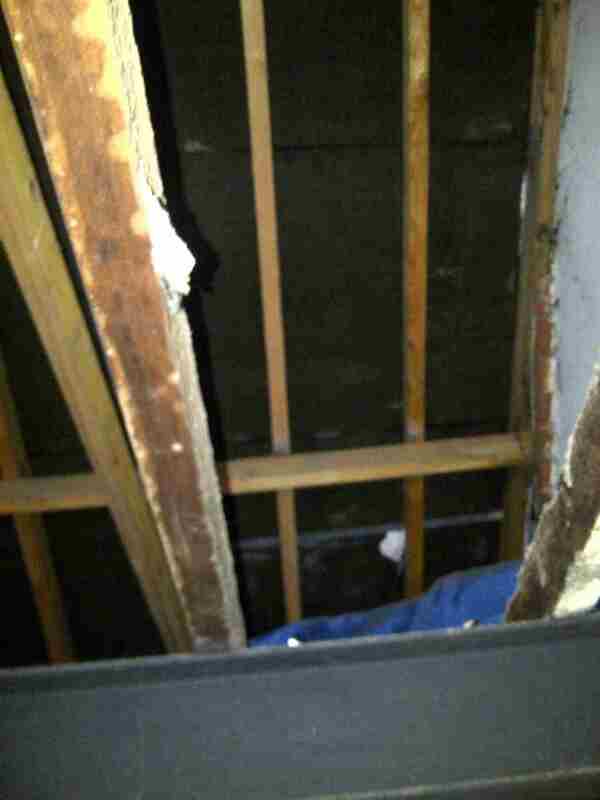 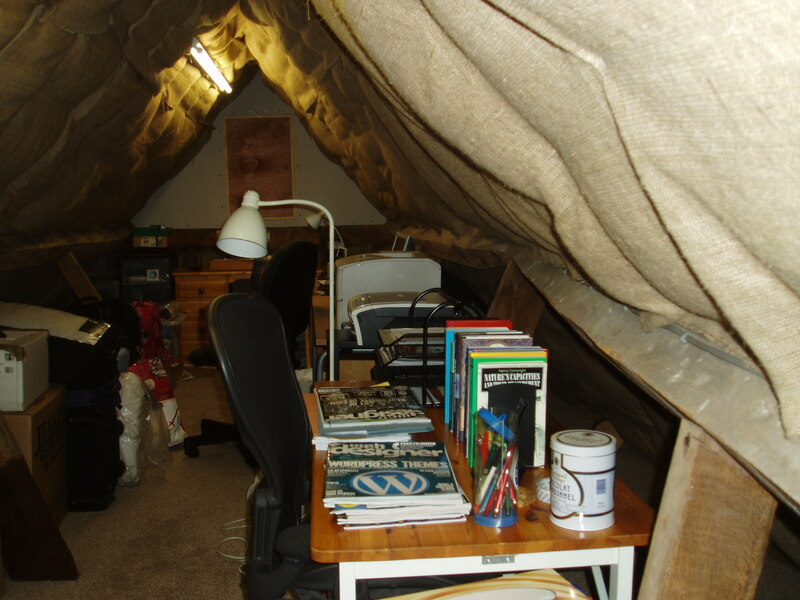 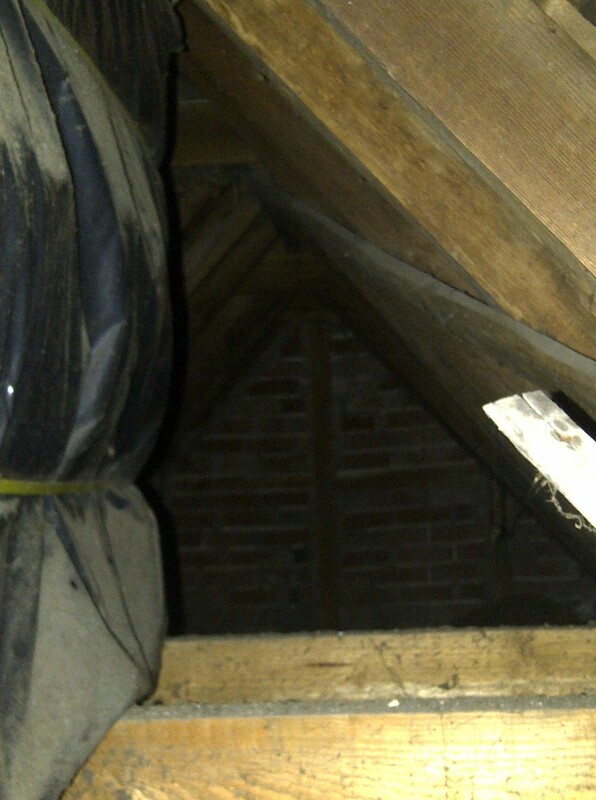 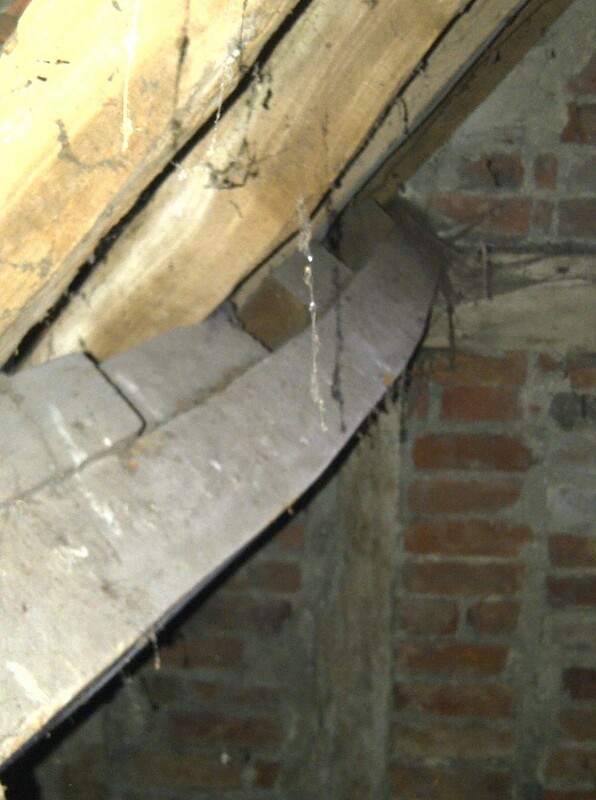 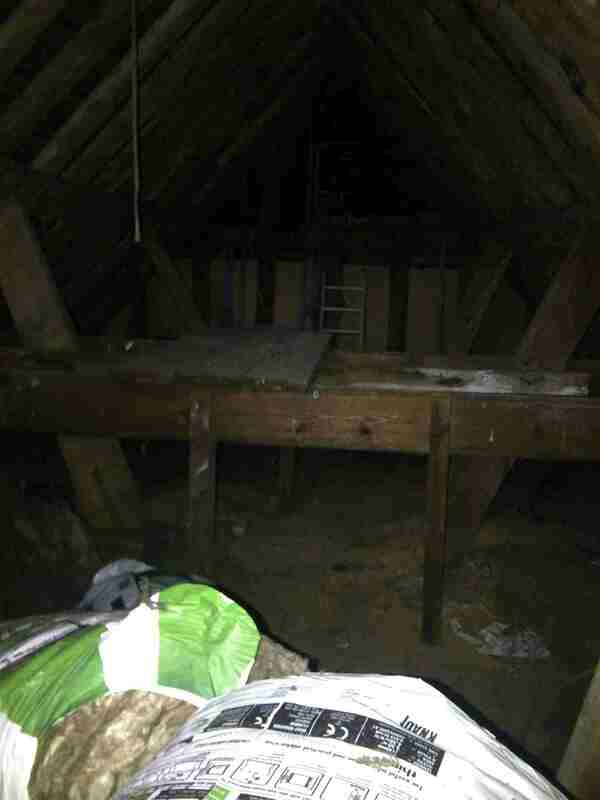 Until just before I bought the property, the attic wasn't insulated. 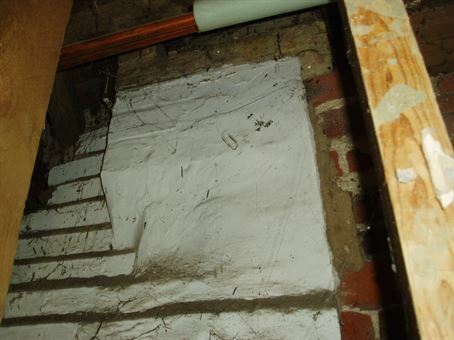 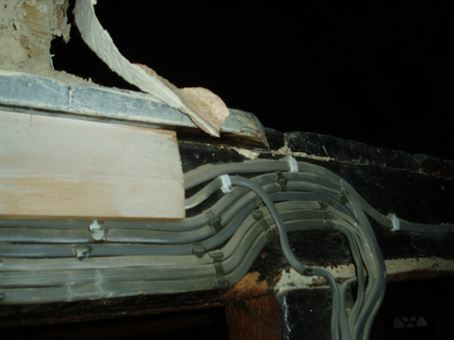 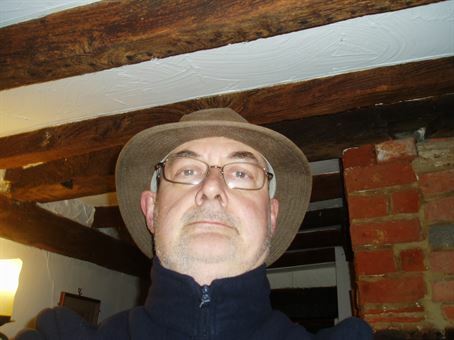 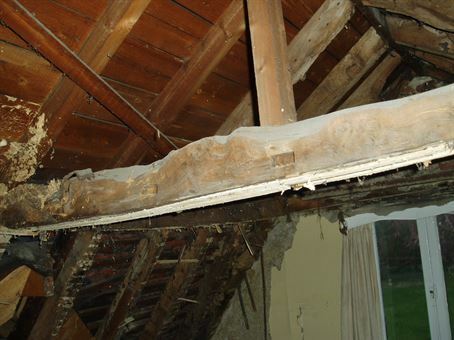 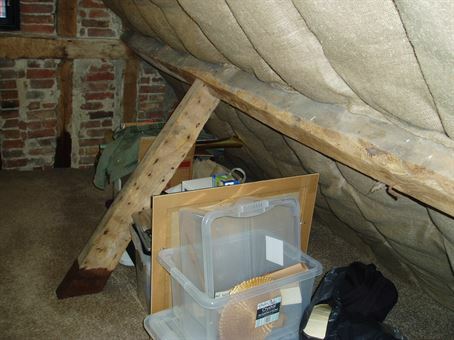 Terry Selway - the vendor who still lives next door - made a half-hearted attempt to insulate the attic with glass fibre, which kept falling down. I tried to get Terry Gregson's builders to board the ceiling, but it was too difficult given the curvilinear layout. 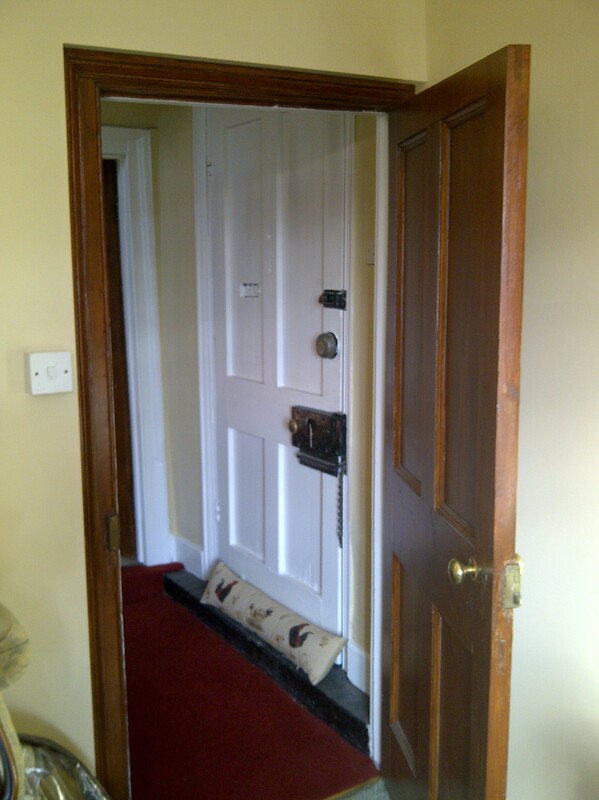 So, I bought a load of hessian and a staple gun and lined it myself, quite acceptably, I think. 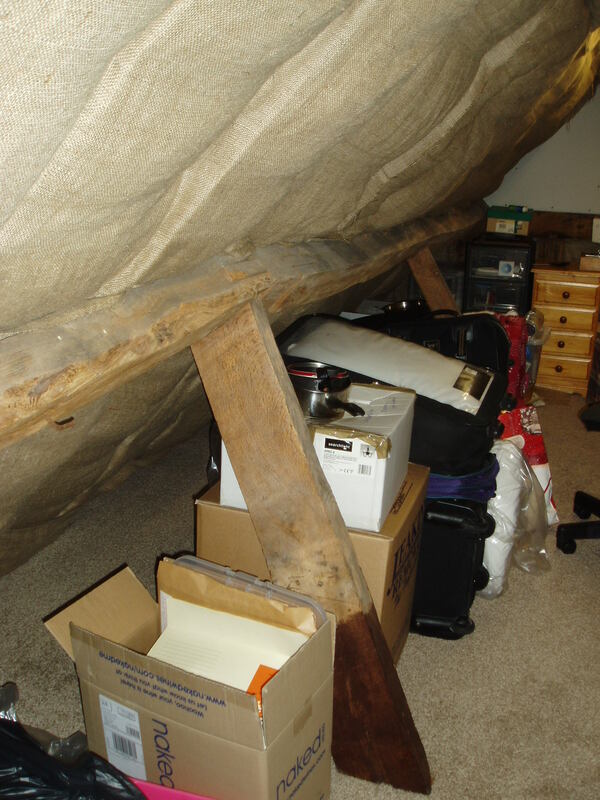 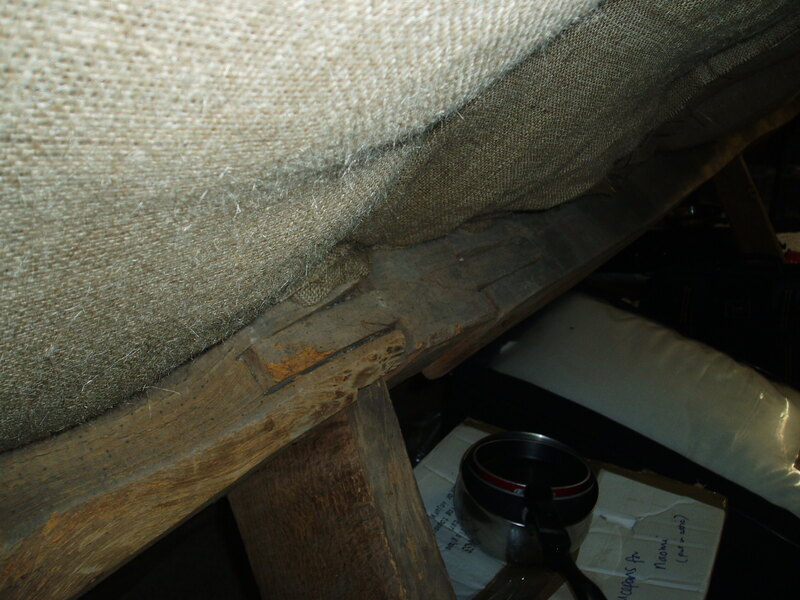 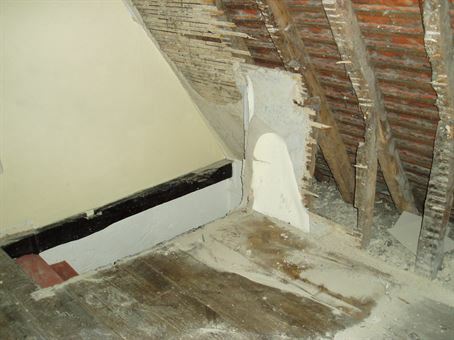 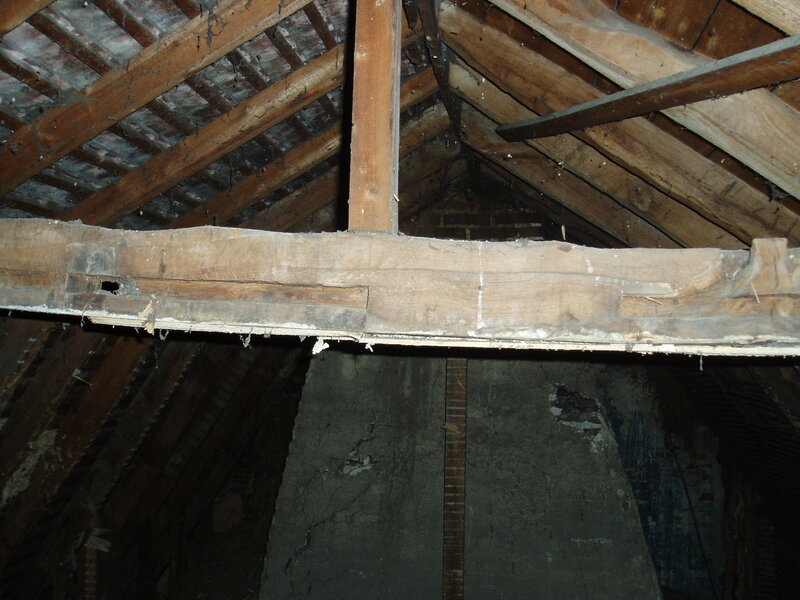 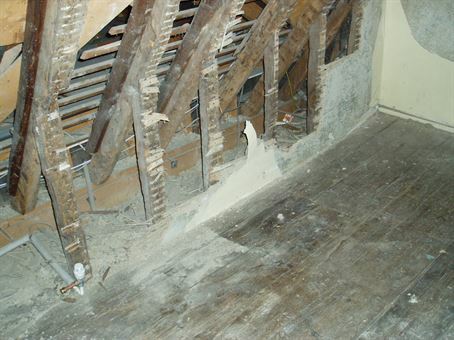 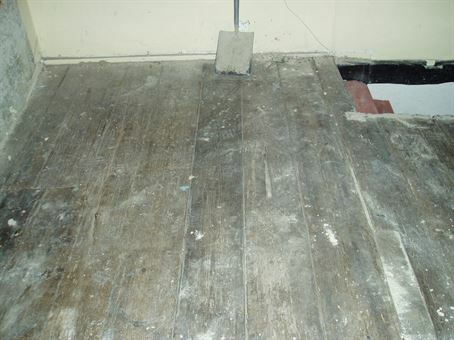 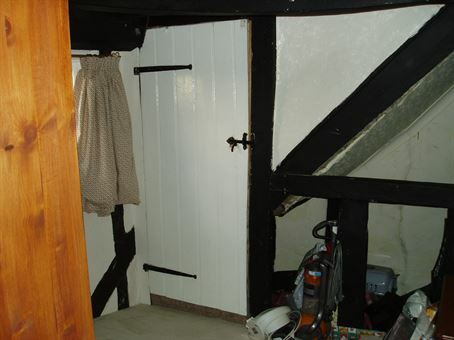 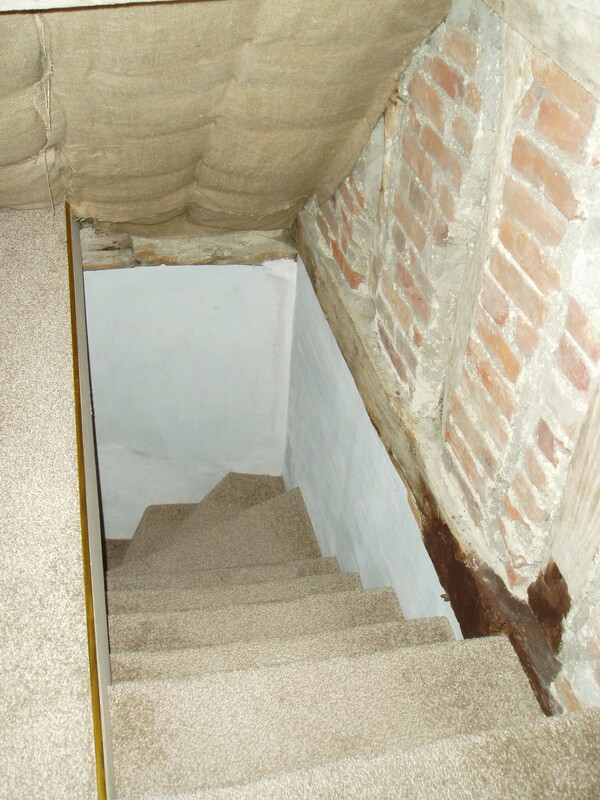 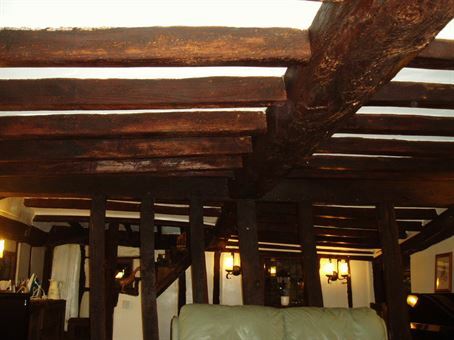 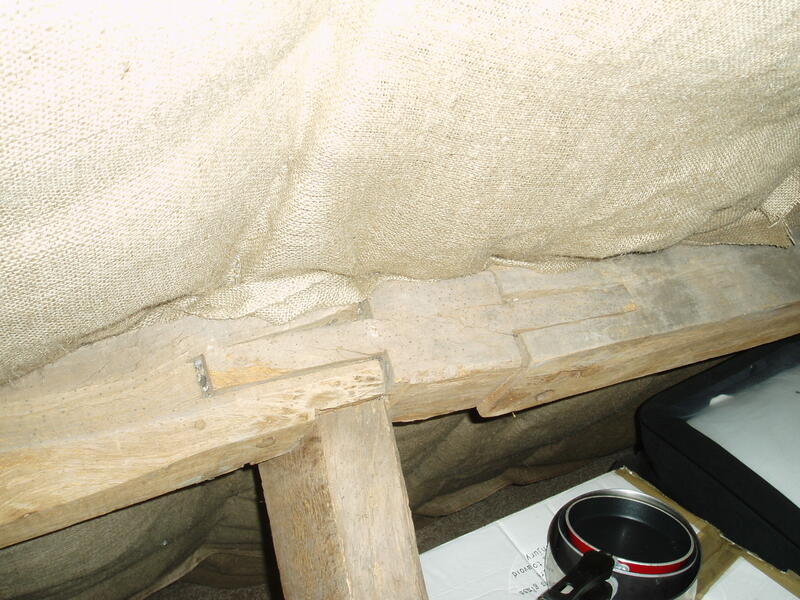 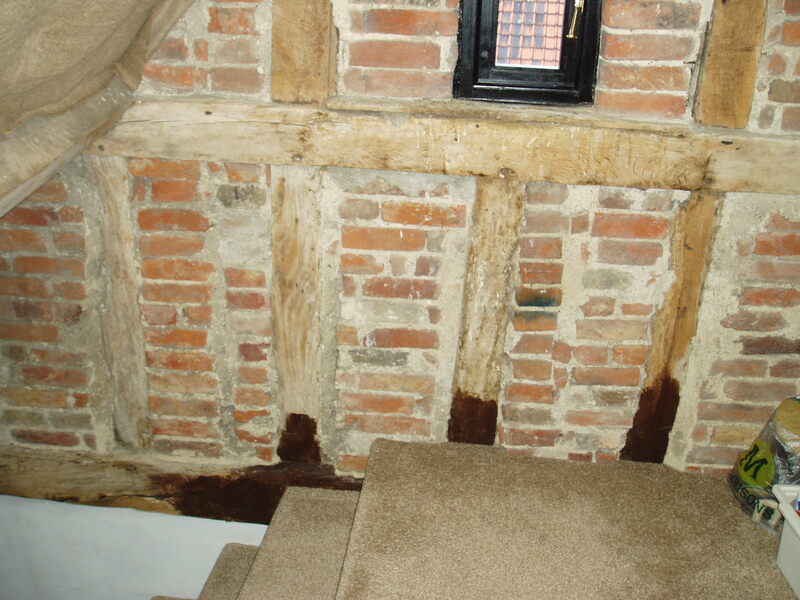 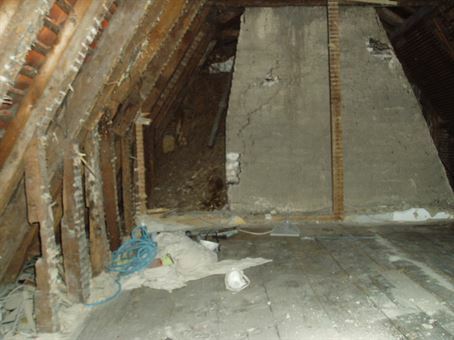 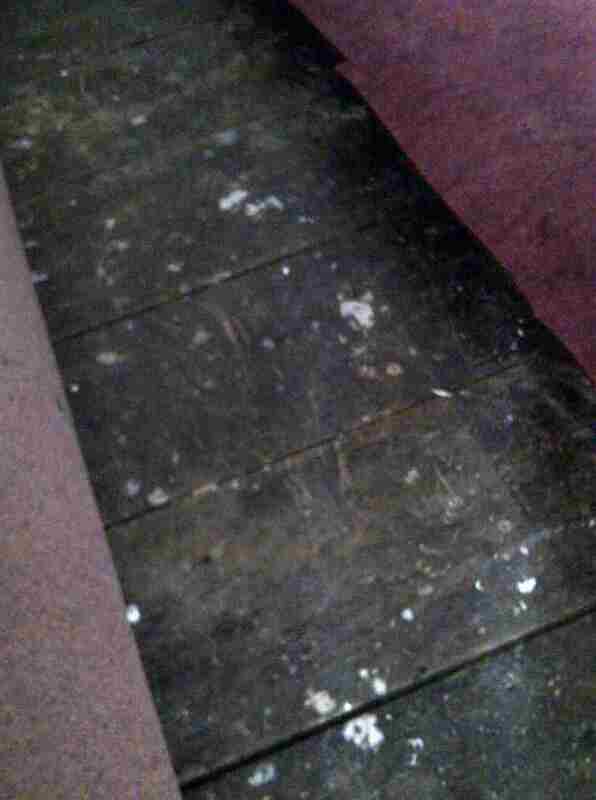 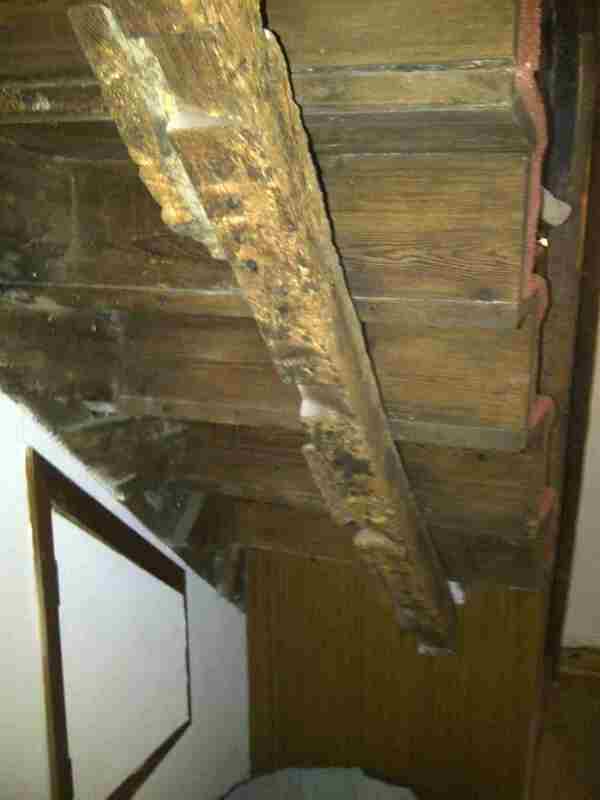 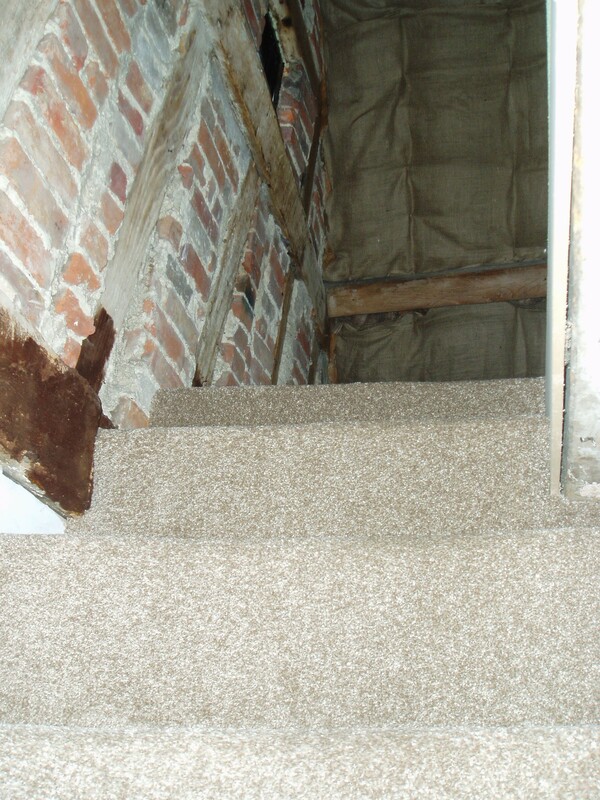 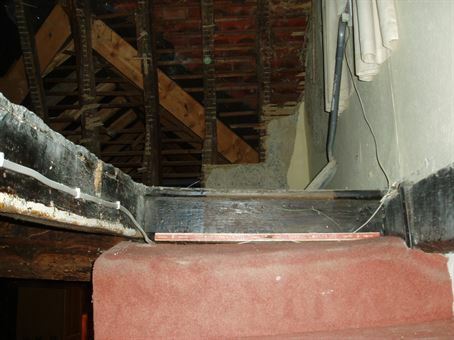 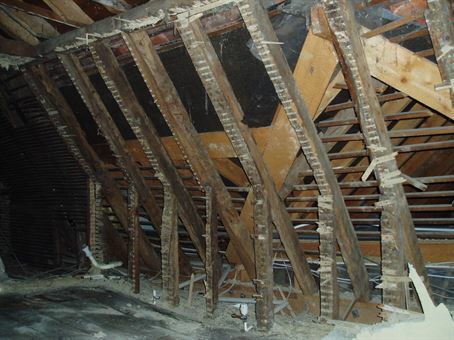 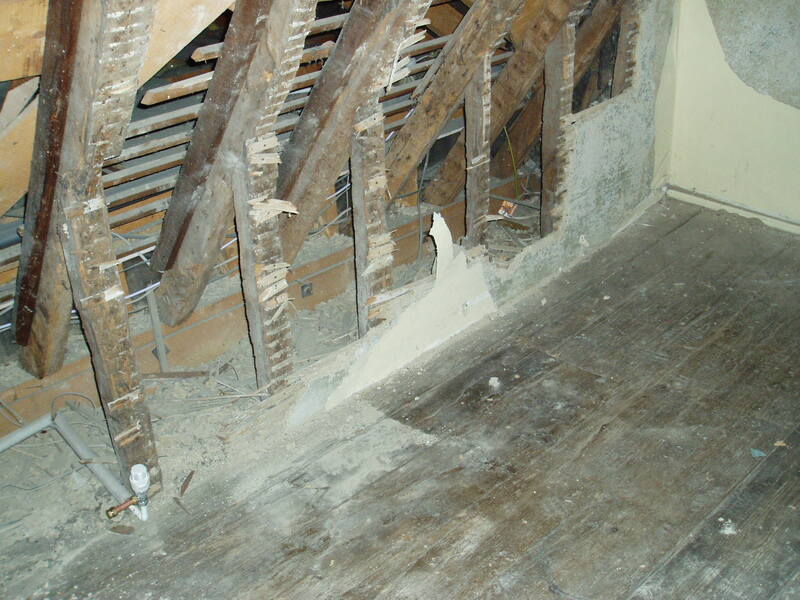 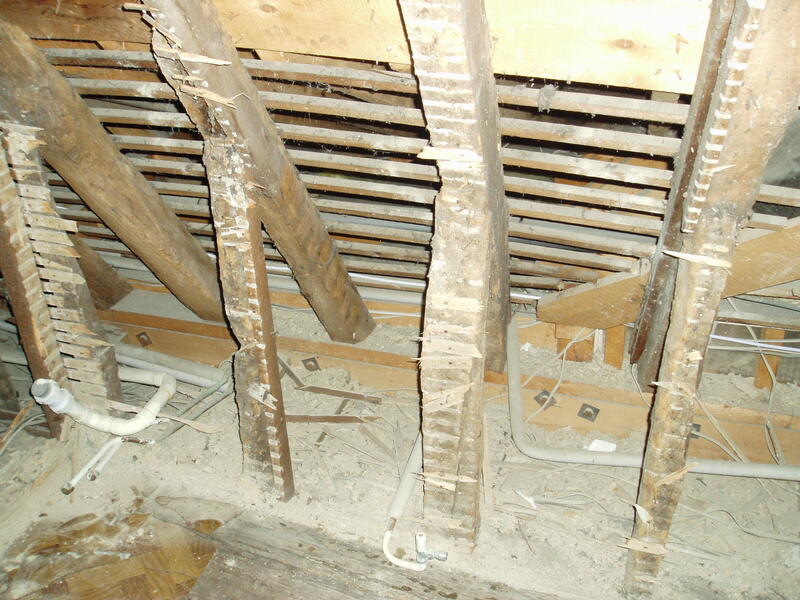 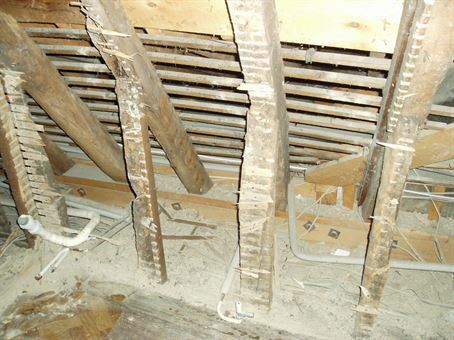 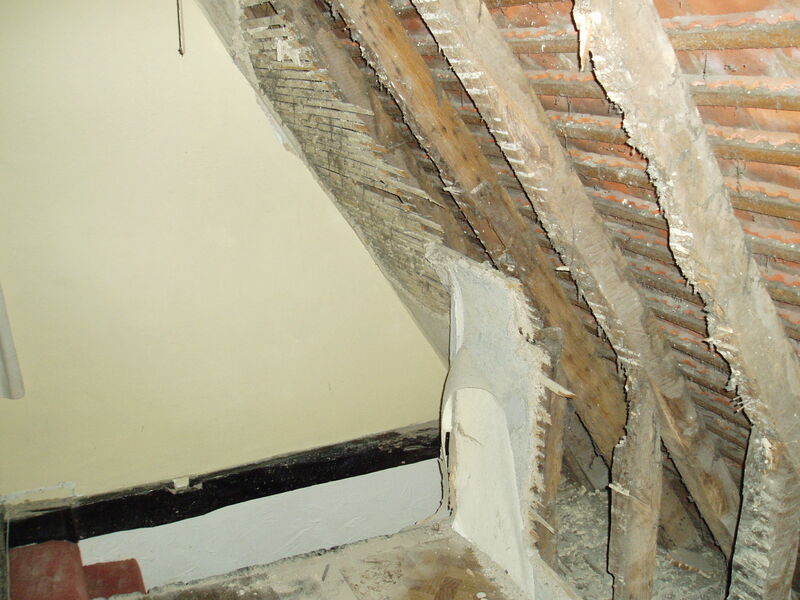 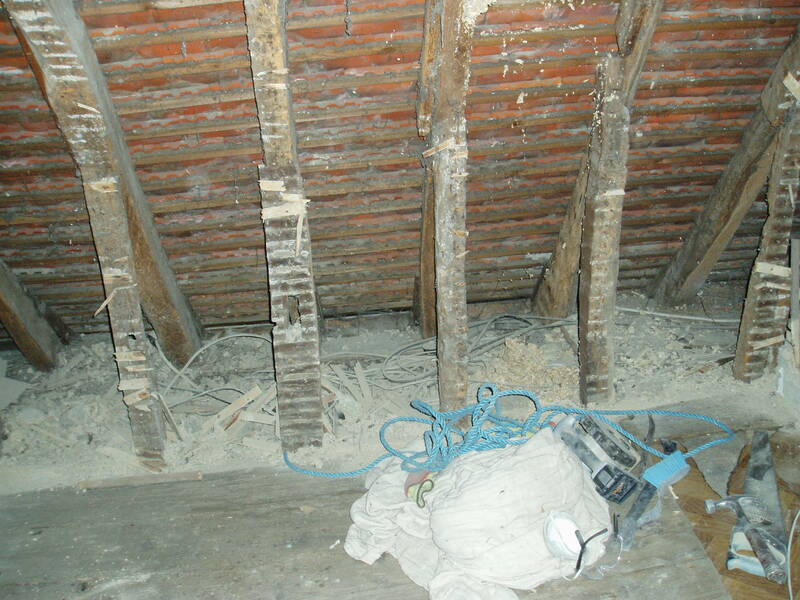 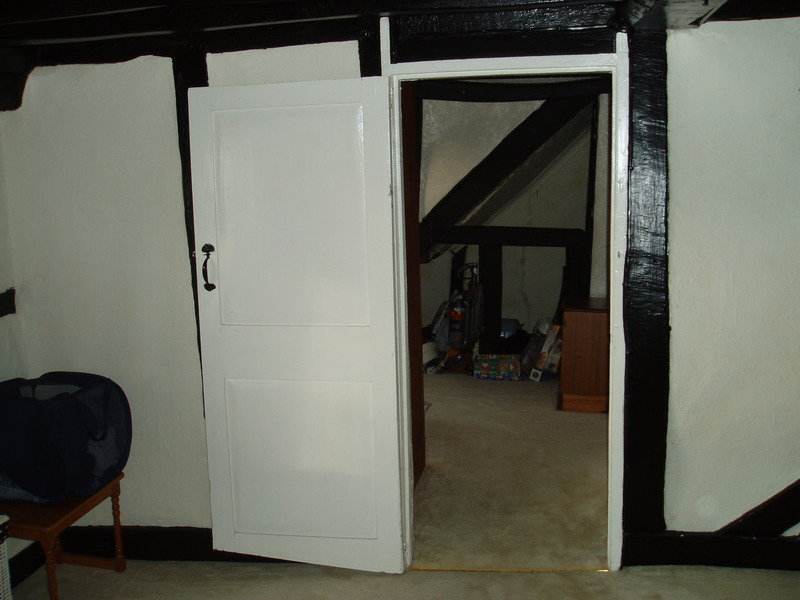 The floor of the attic was strengthened with pine beams and boarded over (leaving the old flooring – such as it was – in situ). 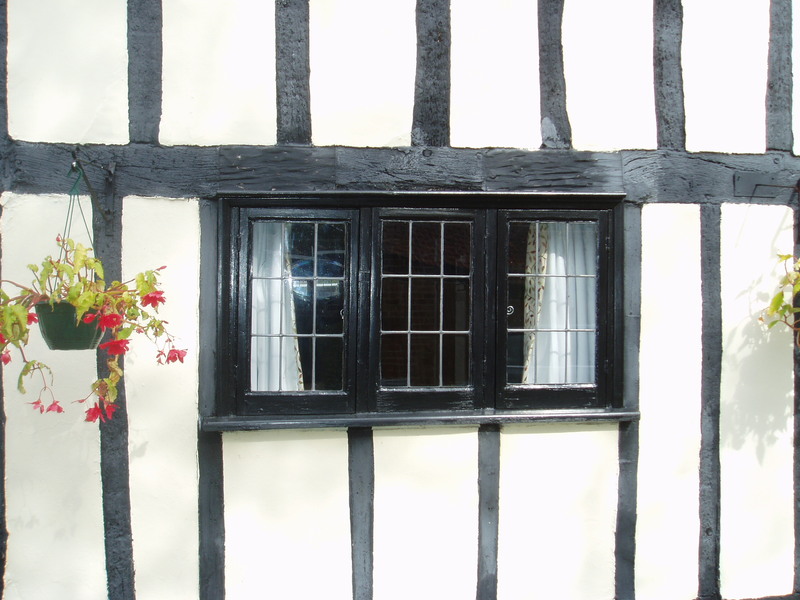 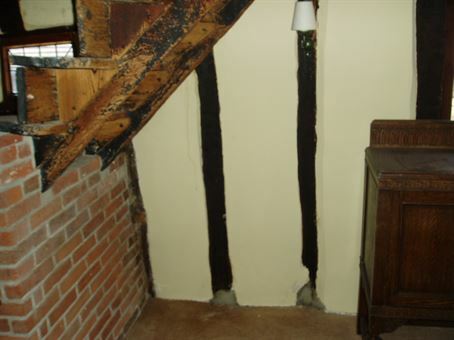 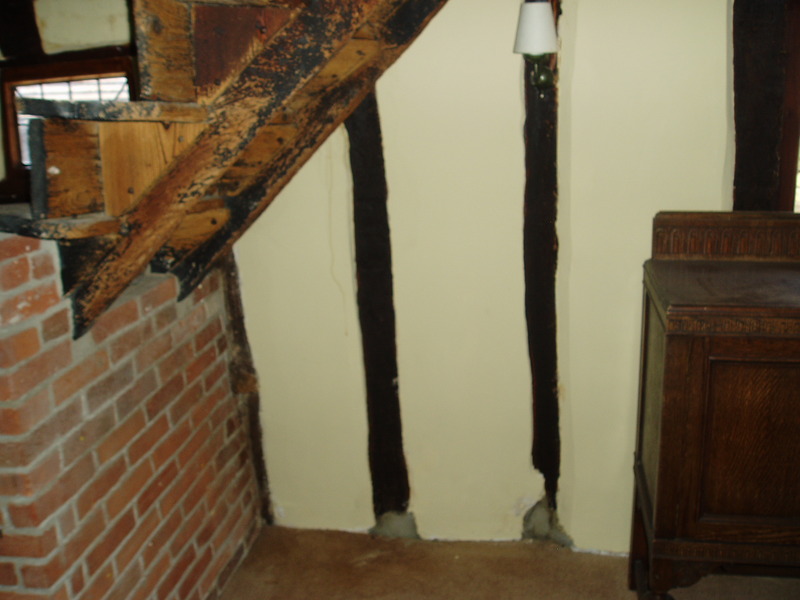 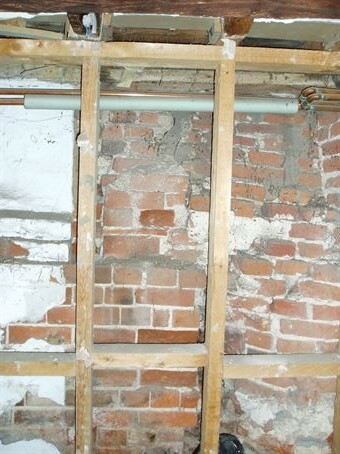 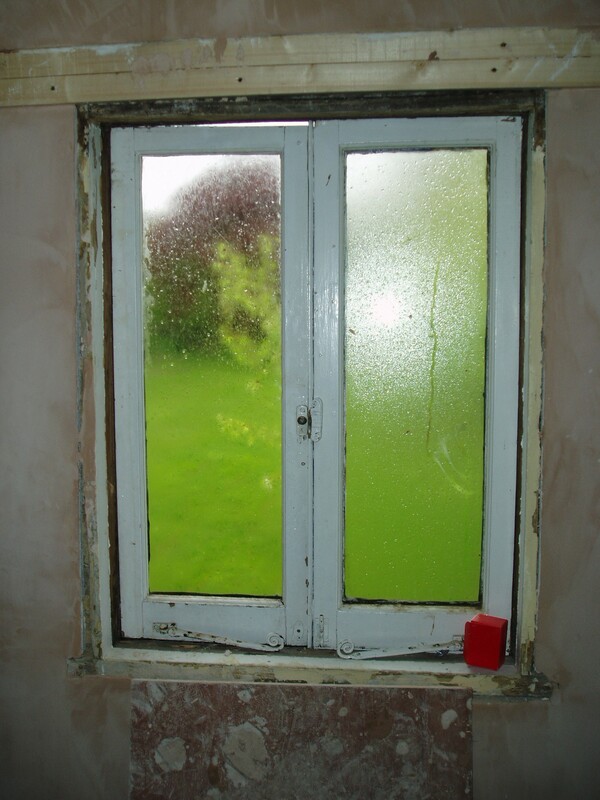 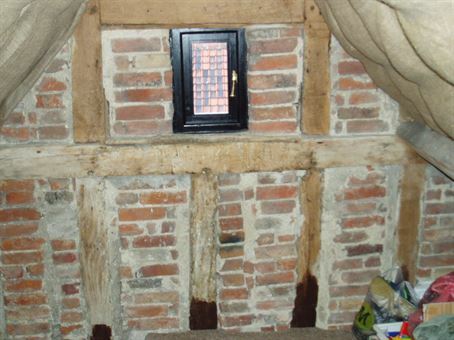 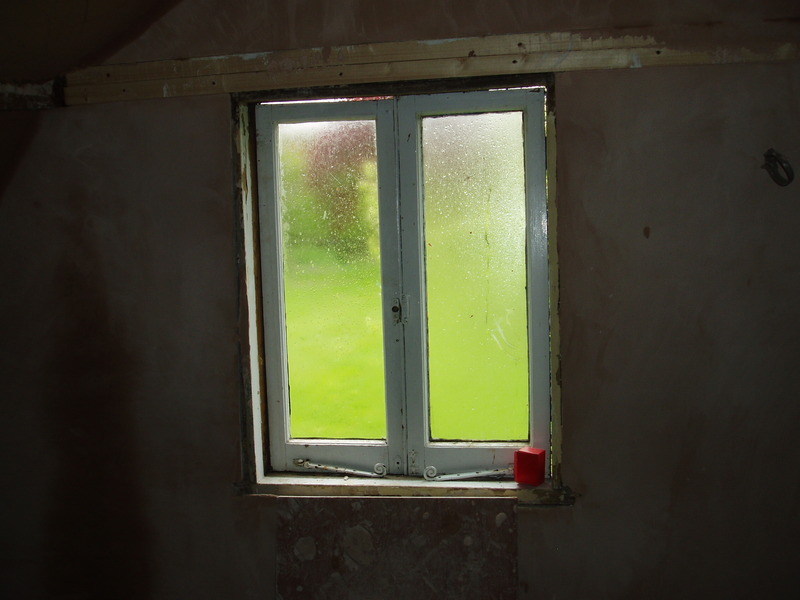 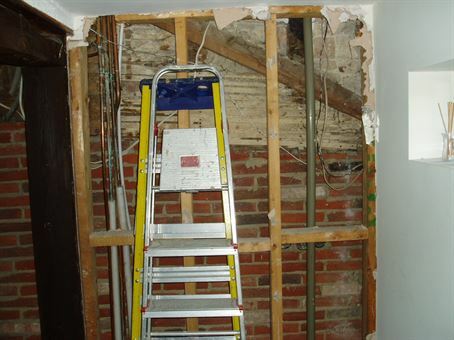 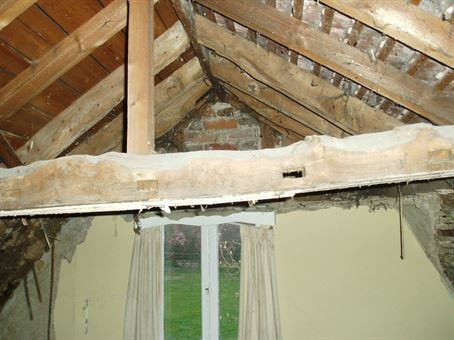 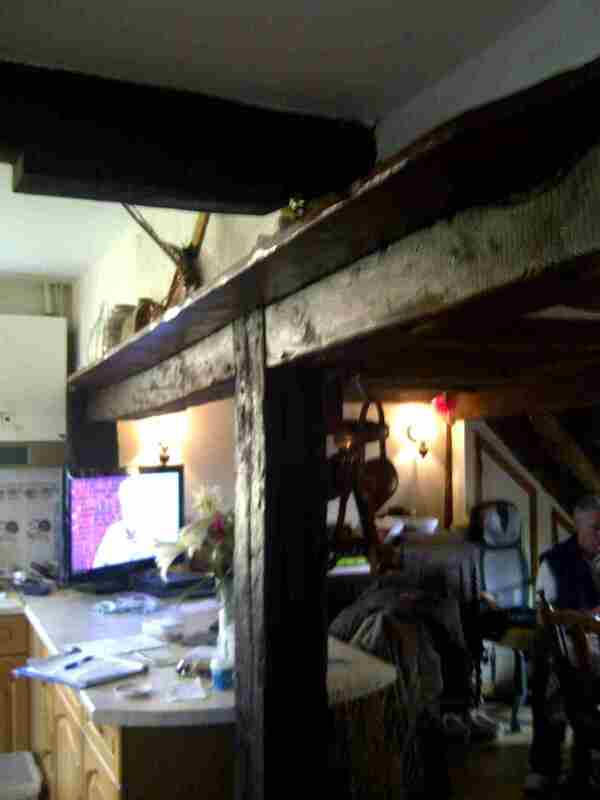 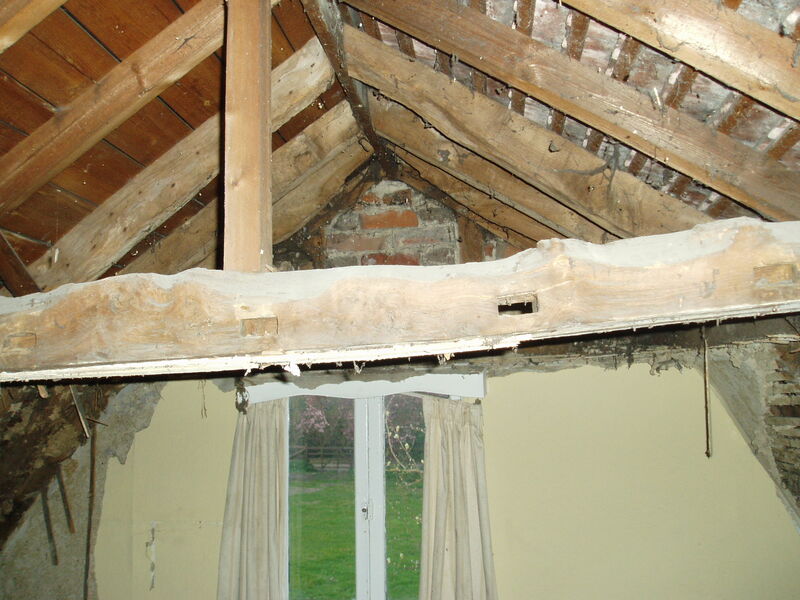 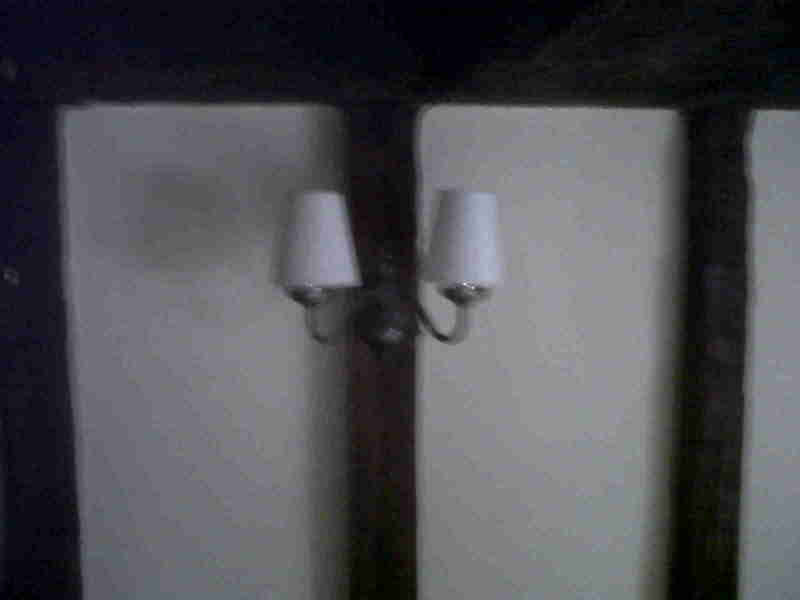 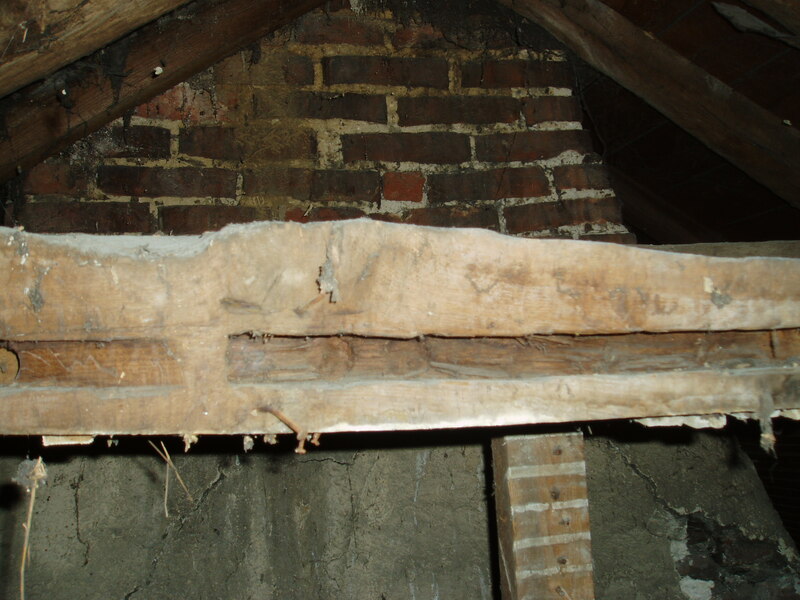 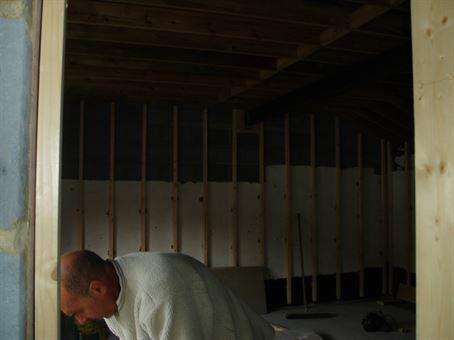 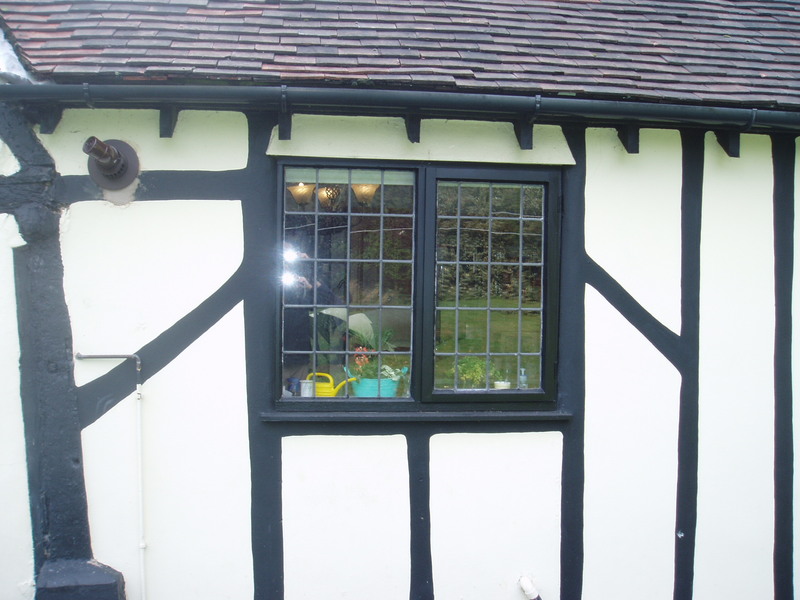 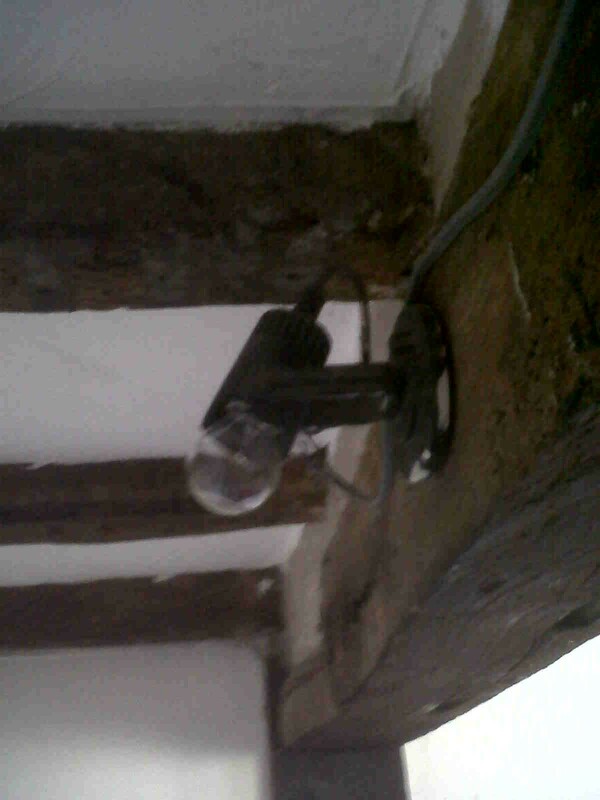 The small window in the back wall was replaced as the original had to be removed to allow entry of the beams. The attic was divided into two – that over the front of the house having too low a ceiling. 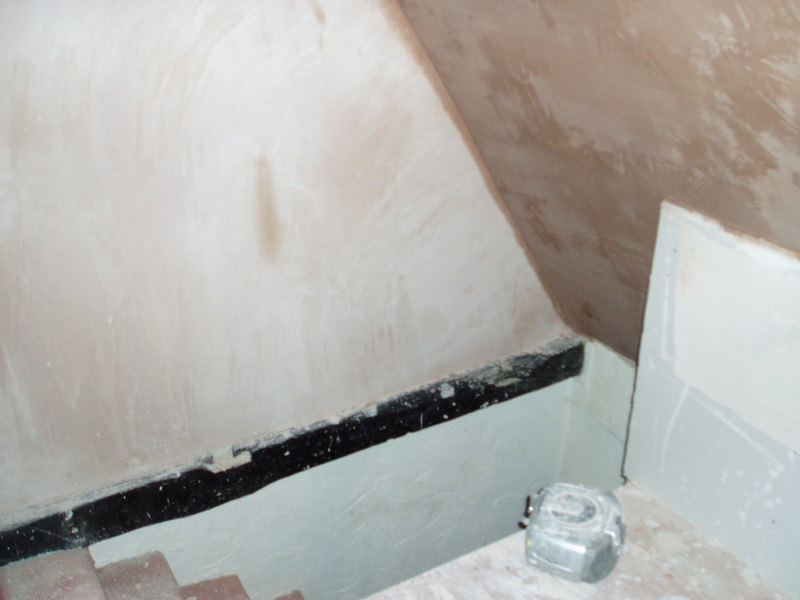 It contains the water tank and is only accessible via a hatch, though the tank controls are accessible by a small door in the plasterboard partition. 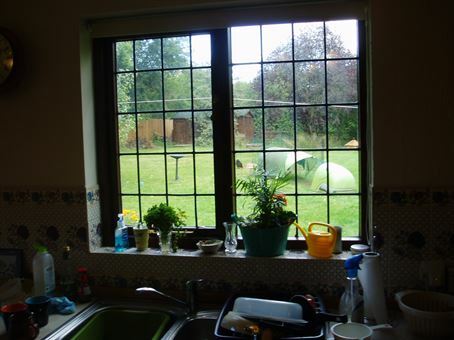 Sundry photos of the house - inside and out - at the end of the first year of ownership. Shows the new back door, amongst much else. 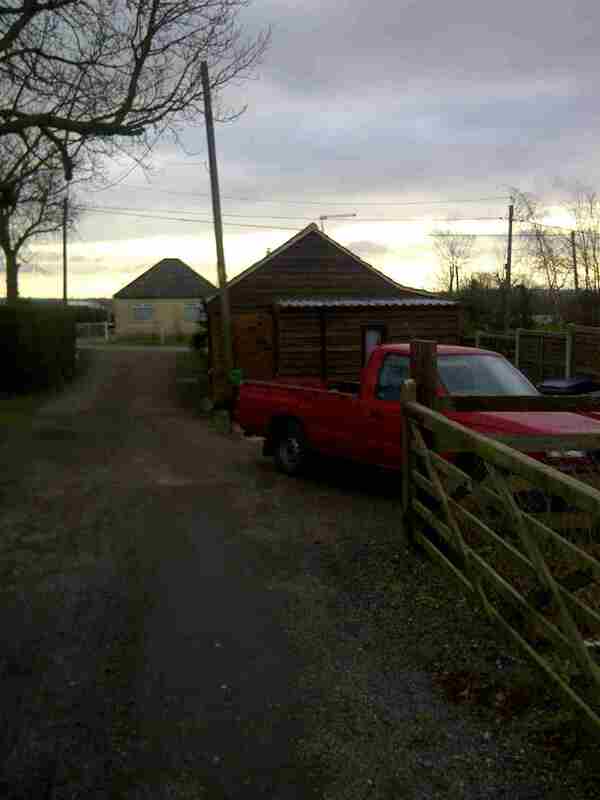 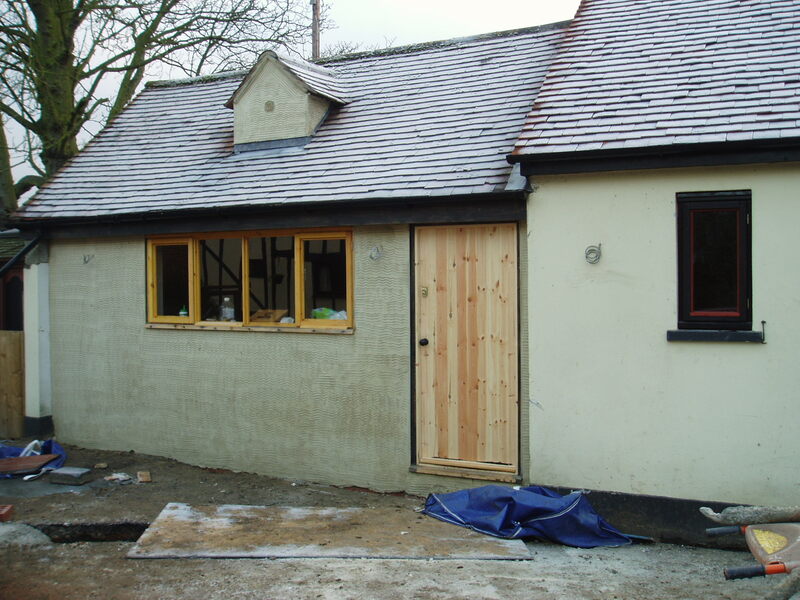 Shows the outbuildings nearing completion - externals only outstanding, I think. 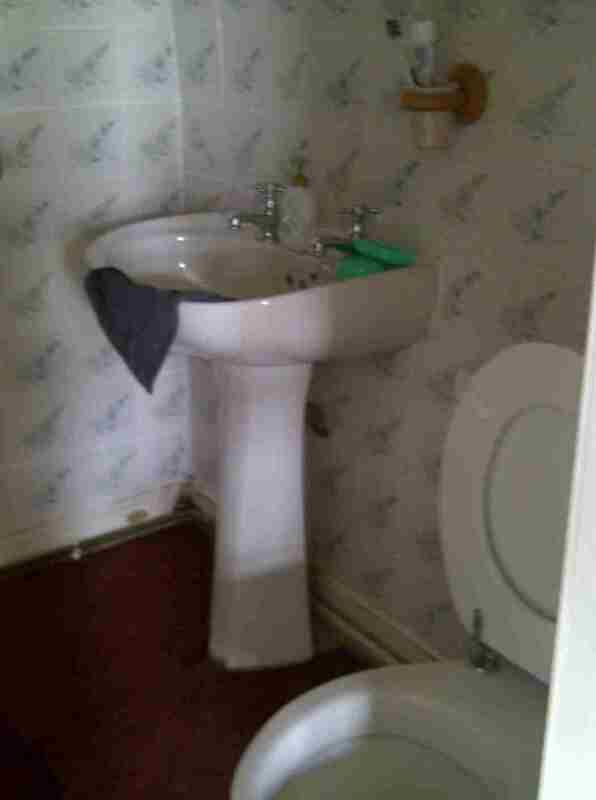 Note the drains! We had a lot of discussion as to whether the slope was sufficient to allow gravity drainage without a macerator. Our builder insisted it was fine to use gravity, and it seems (as of February 2019) that he was right! 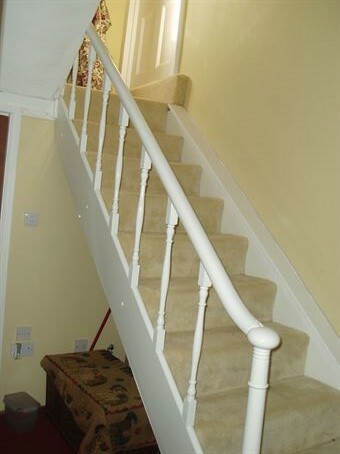 Not quite sure when this photo was taken, but it's included here to show the finished job! 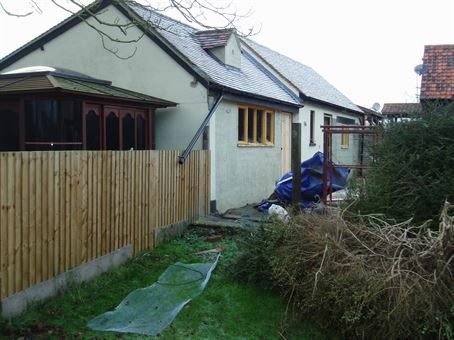 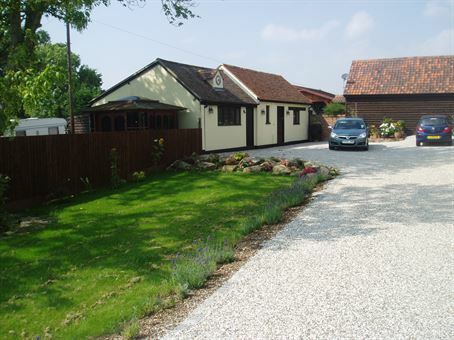 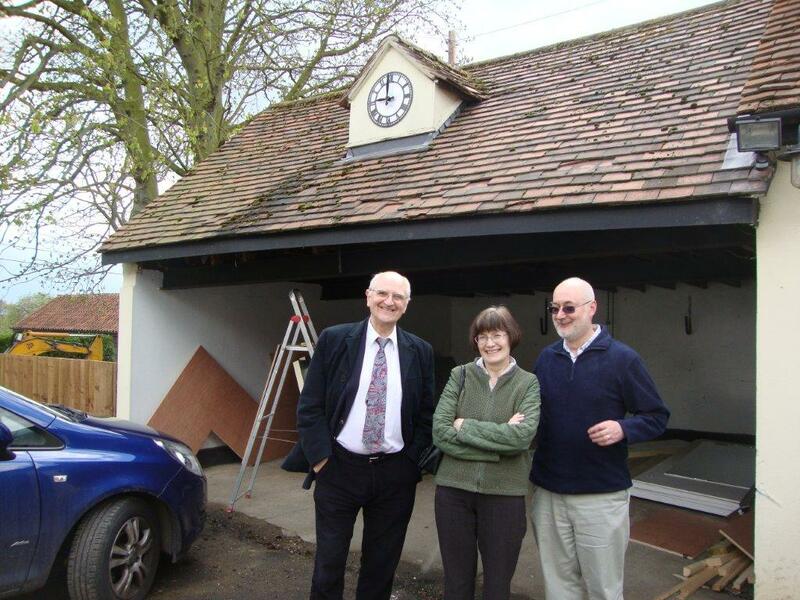 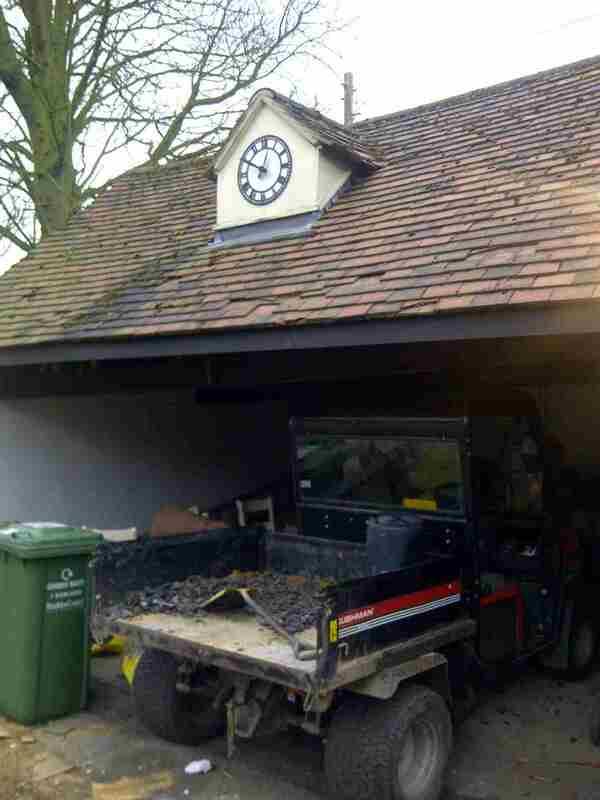 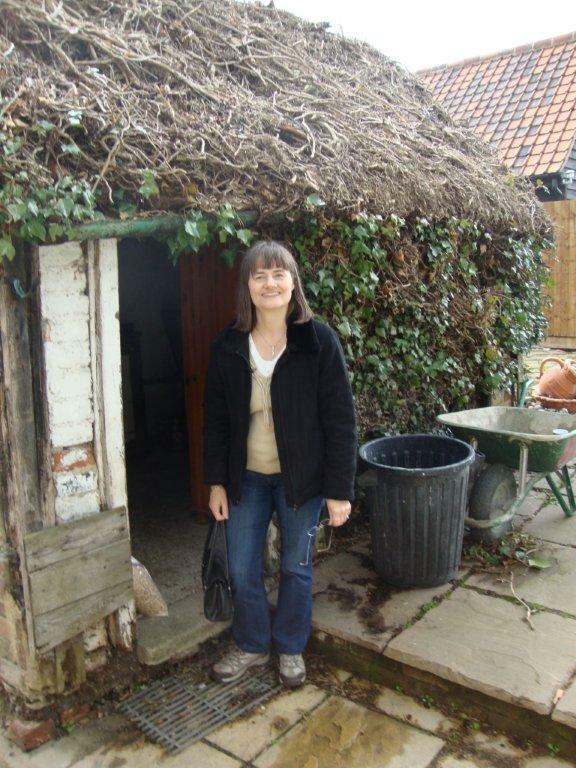 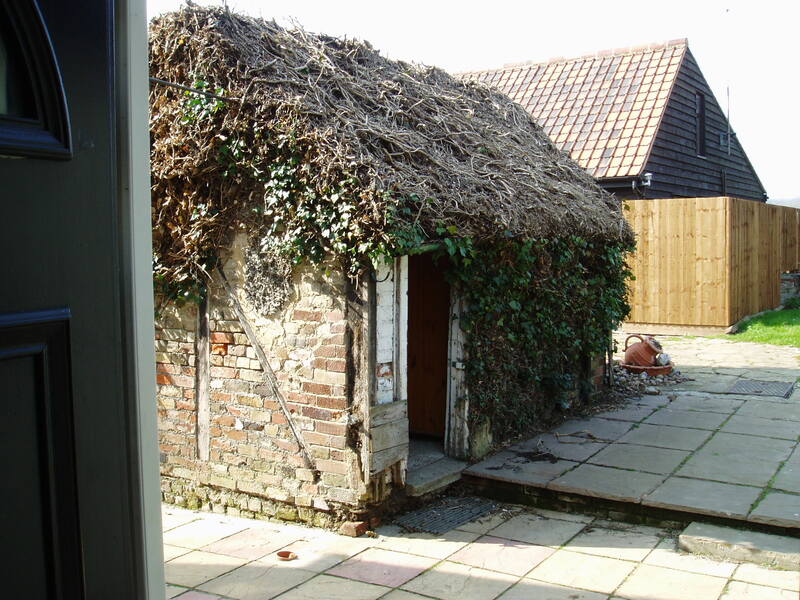 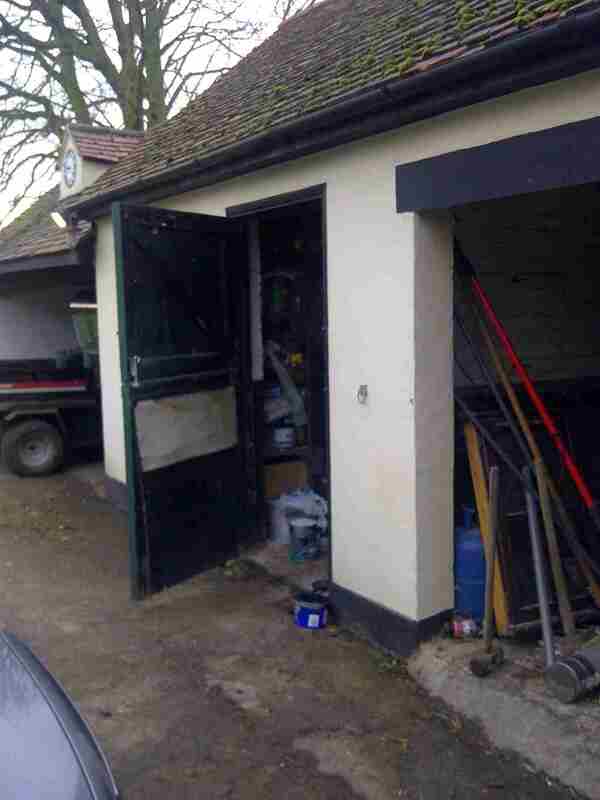 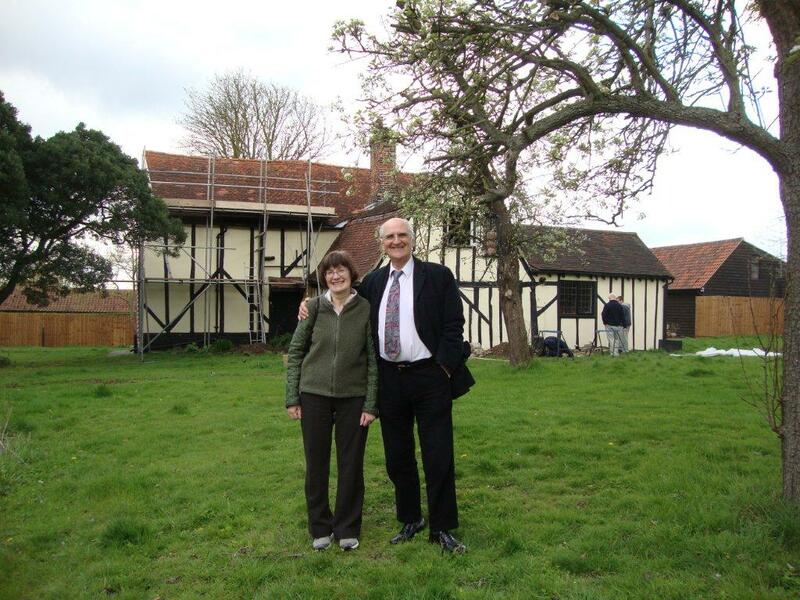 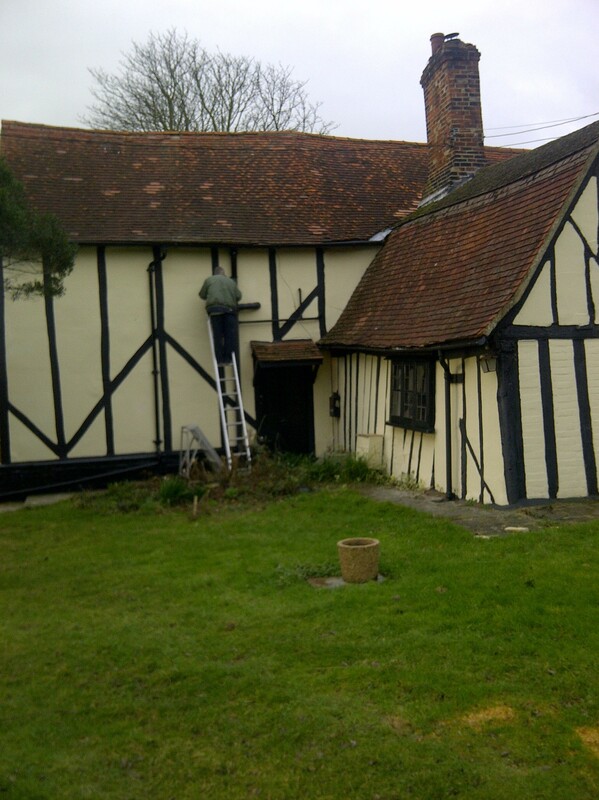 This month saw the focus on the outbuildings conversion. 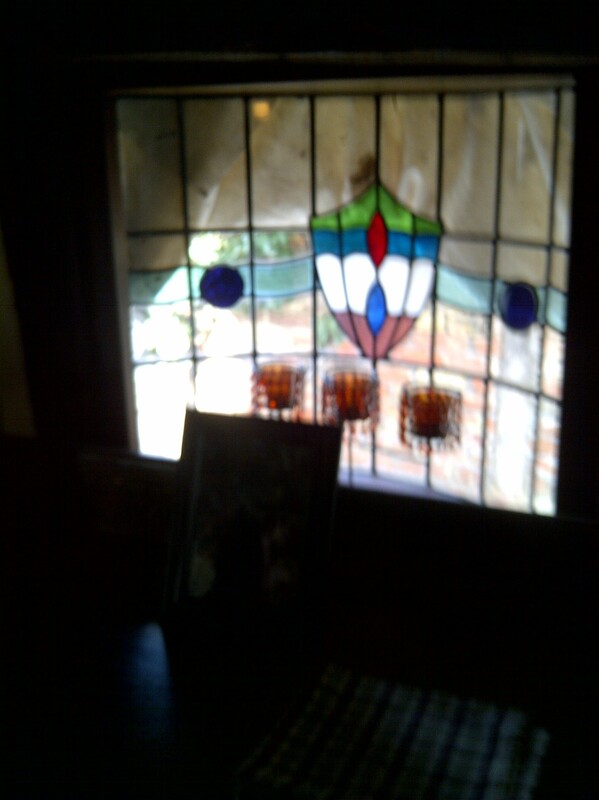 But we start with a couple of random photos. 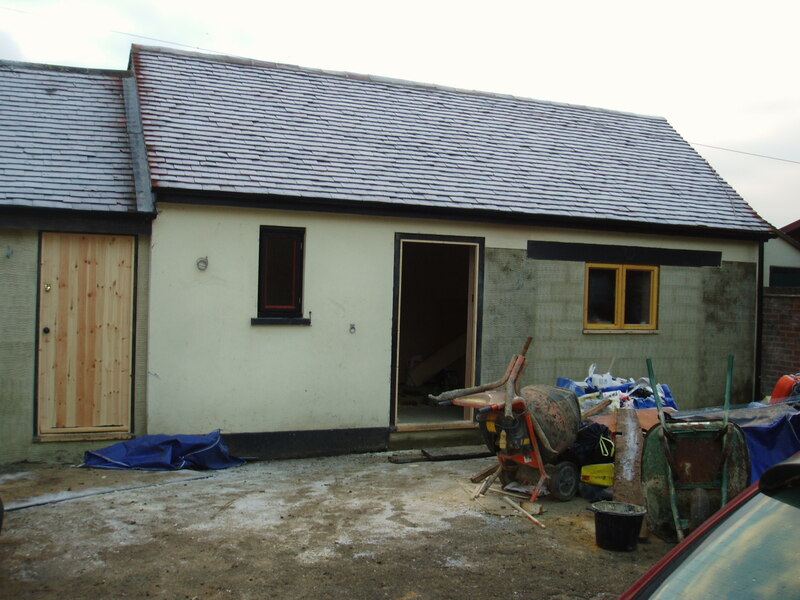 The outbuildings conversion. 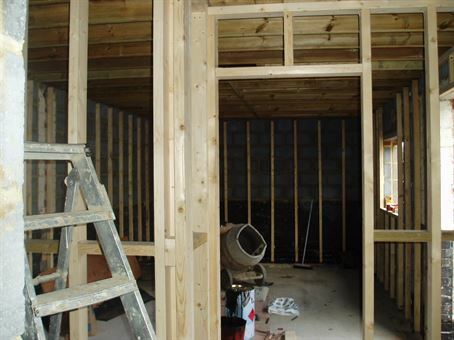 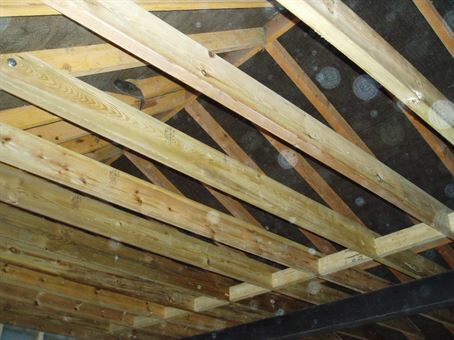 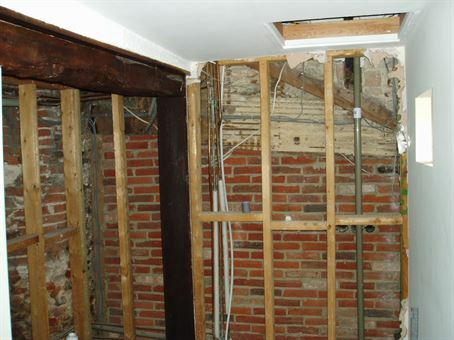 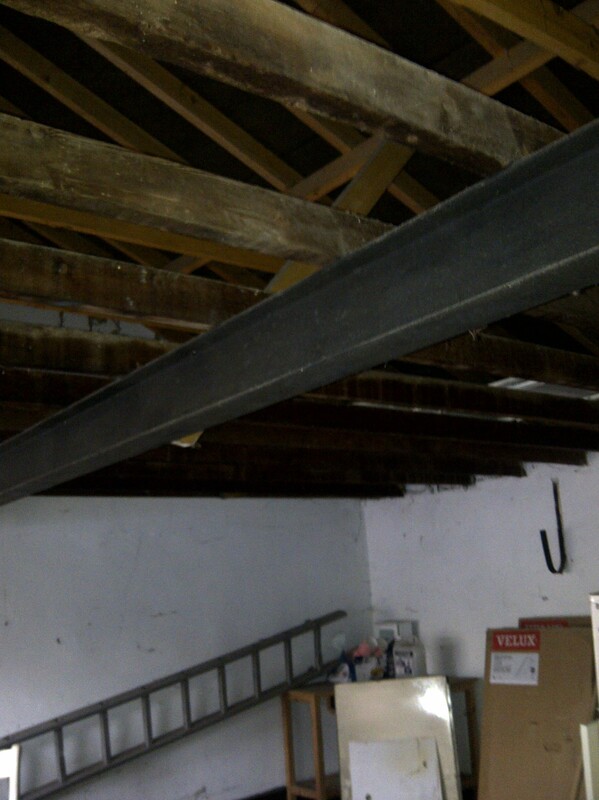 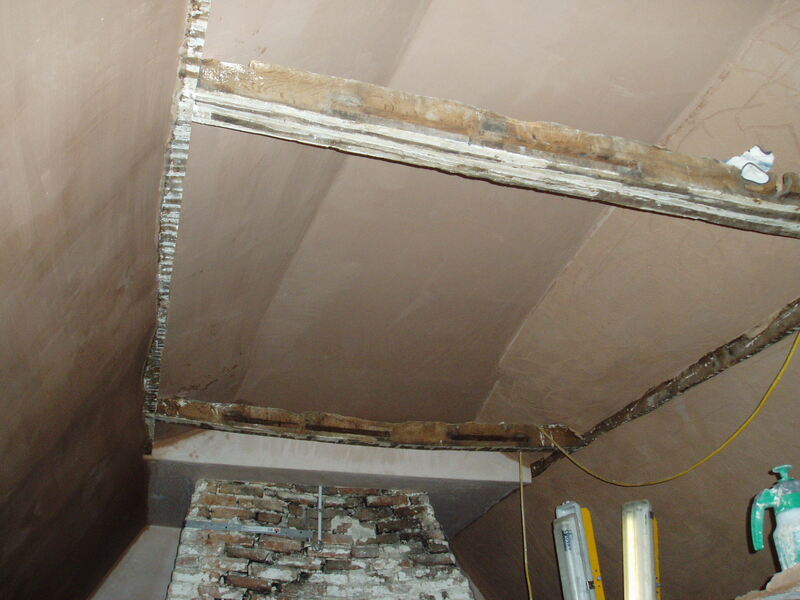 Errecting the interior partitions, stud-work and the library ceiling joists. 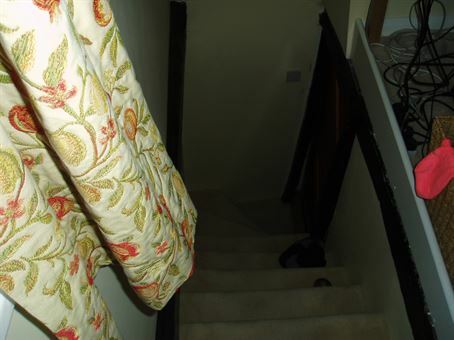 Looks like the last two photos were taken in October or before ... to be investigated. Two 'lit' fires. 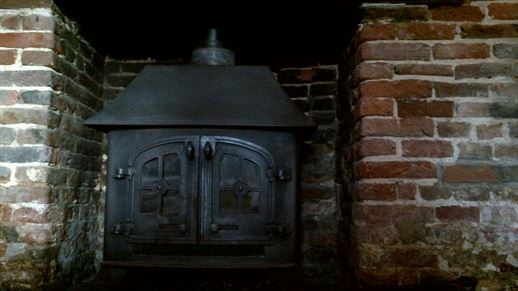 The lounge fire-lighting was pretty much a one-off as the chimney is unlined, so fumes leak into the bedrooms. Includes a photo of me, for some reason. 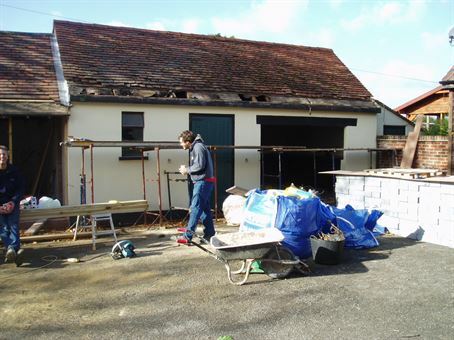 The joists in the side of the stables roof facing the house were in poor condition, so we decided to renew this side of the roof. 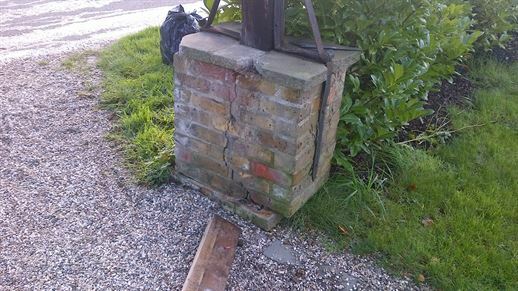 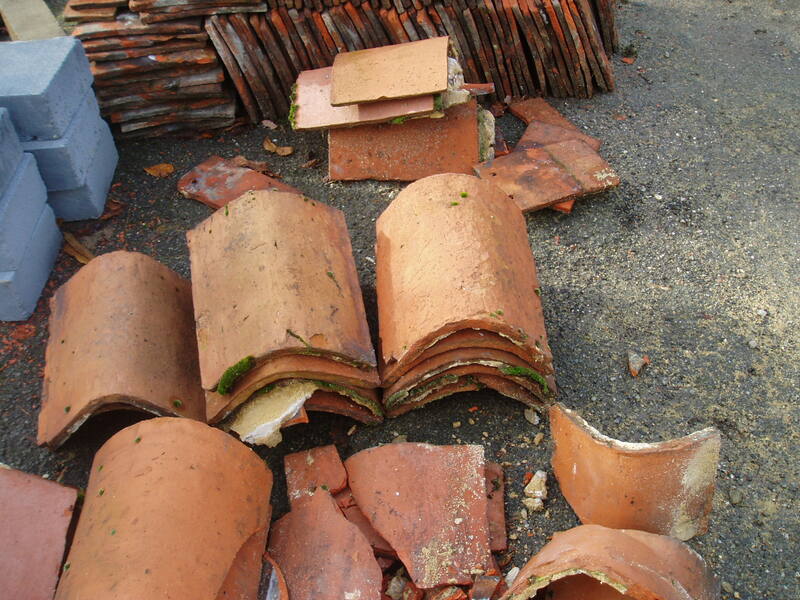 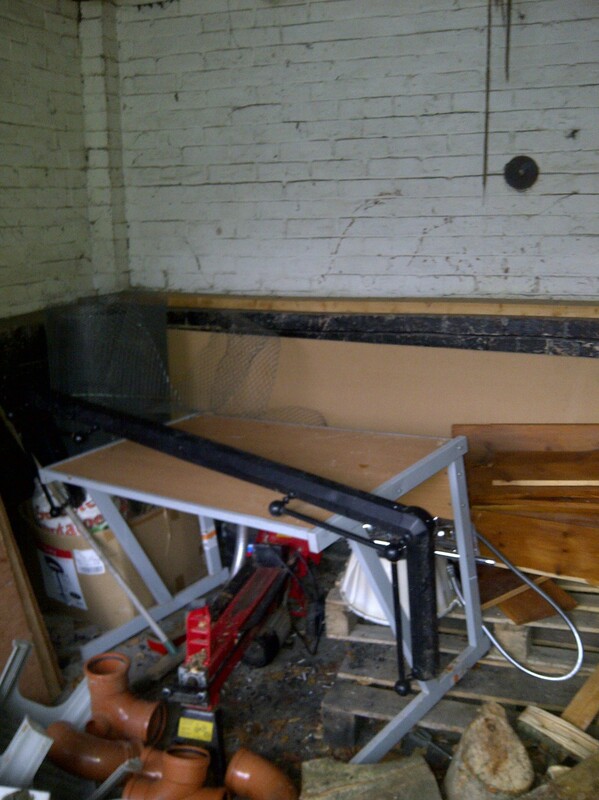 Another item not picked up by the surveyor! 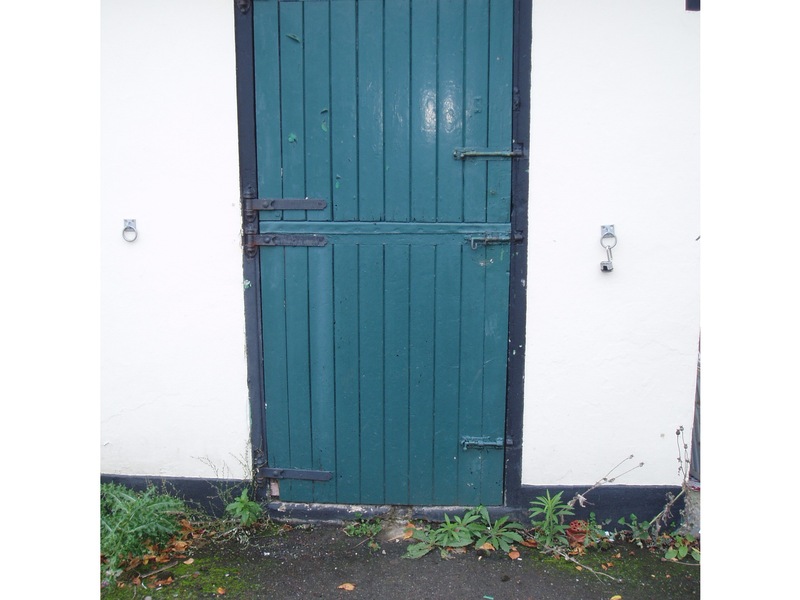 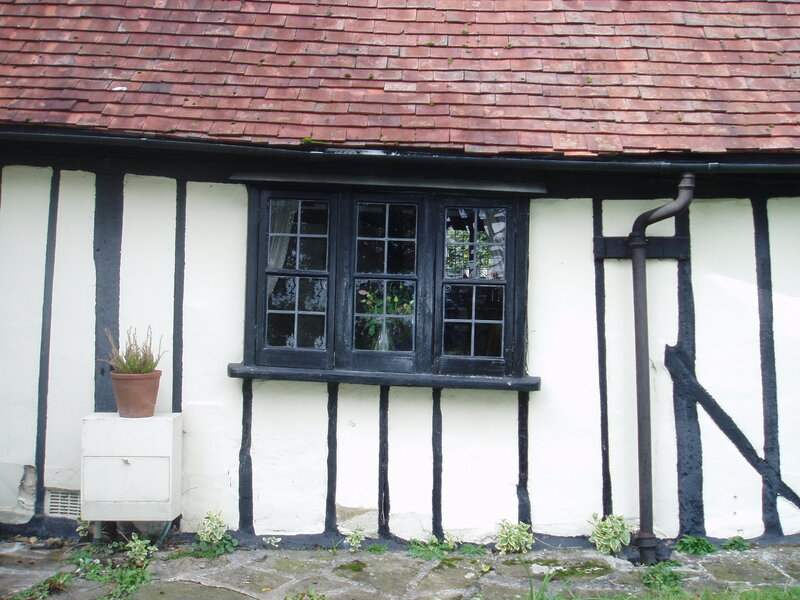 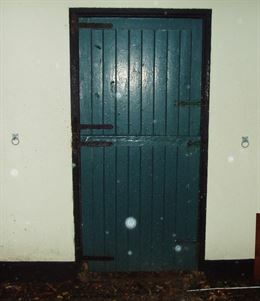 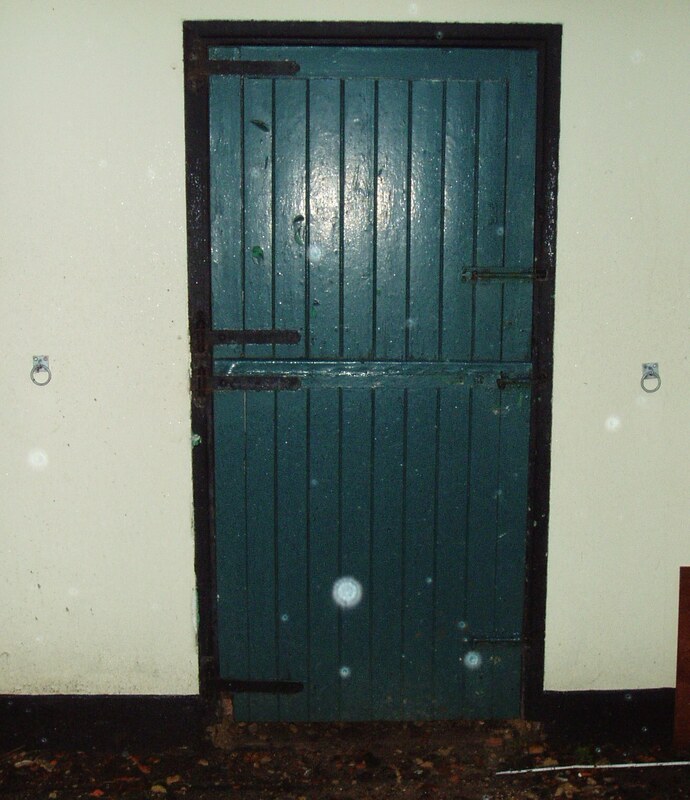 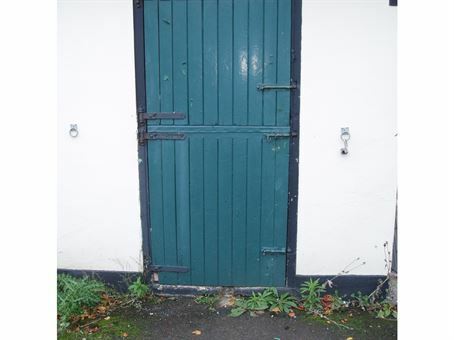 The old stable doors were also in poor condition and unsuitable for use as library or guest-room doors, so they went in the skip, being replaced by hand-made doors in a fairly similar style. 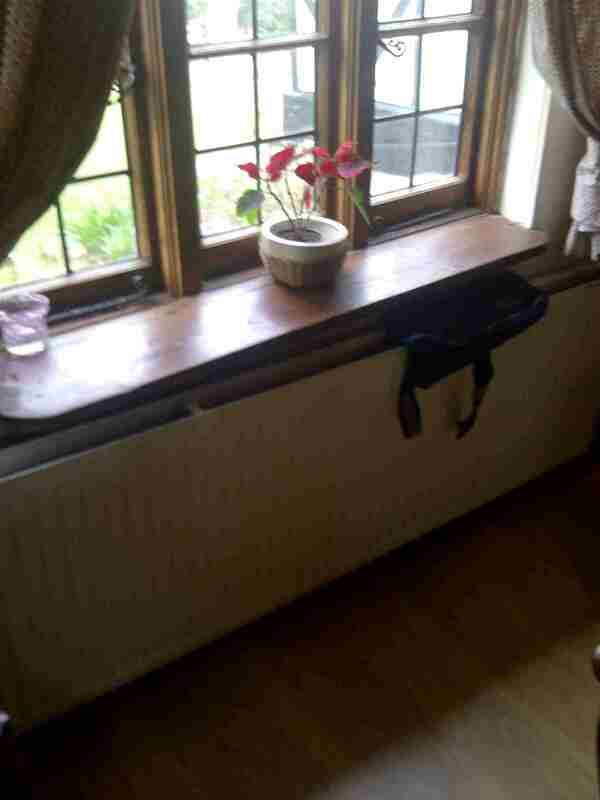 The conservation officer seemed happy enough. Random Photos yet to be fully categorised. 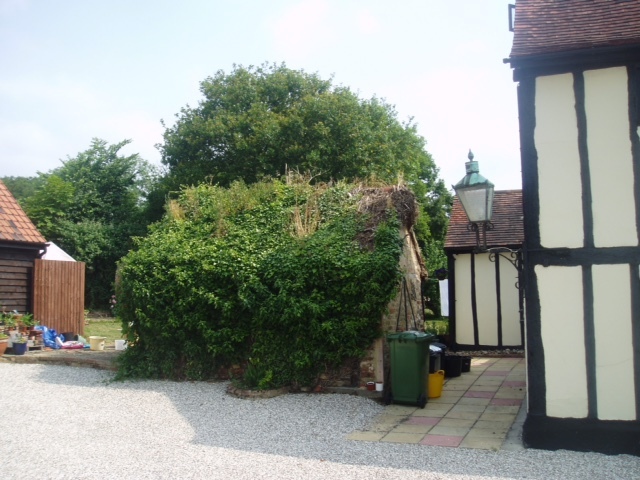 Shows the old front door and the ivy room after a short back and sides. 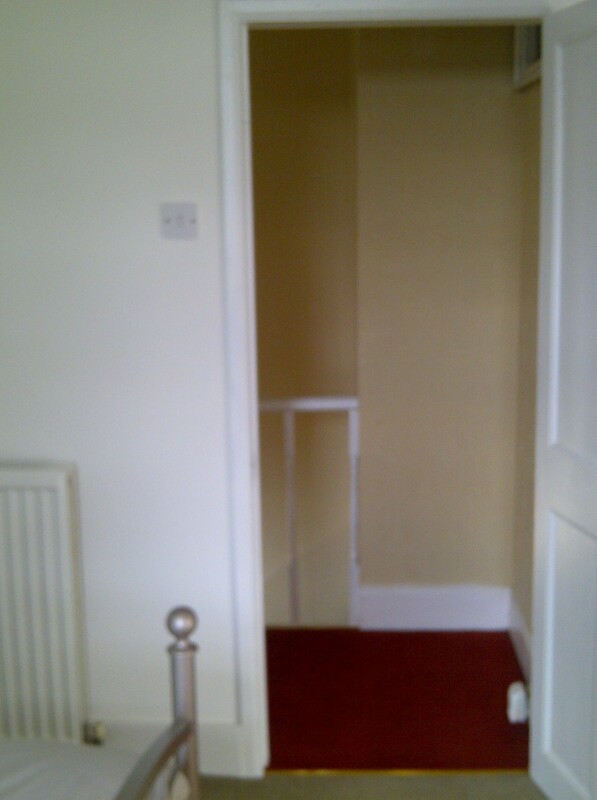 Otherwise, various rooms are being tidied before we'd actually moved in. The focus at the time was on the wonky room and the shower room (which feature below) and the attic (which features above, though I don't seem to have any photos of it actually being repaired, presumably because it was inaccessible until the floor was strengthened). 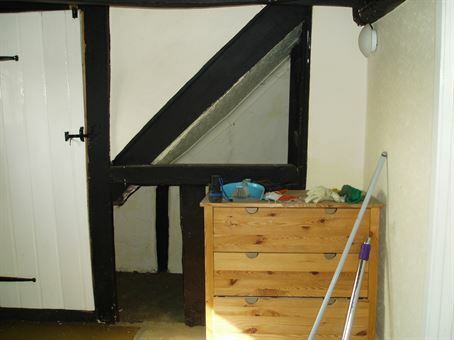 The outbuildings are unconverted, and the lounge end-wall and the wall supporting the 'staircase to nowhere' are still unplastered. 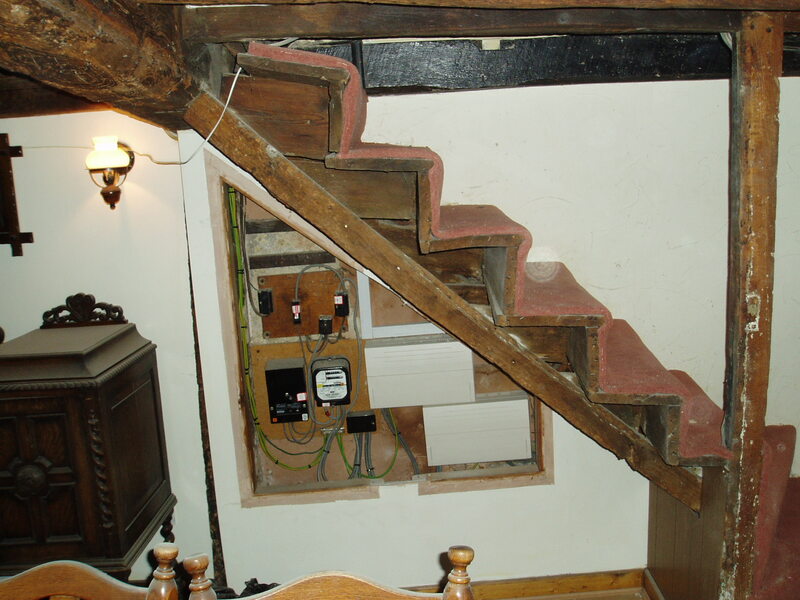 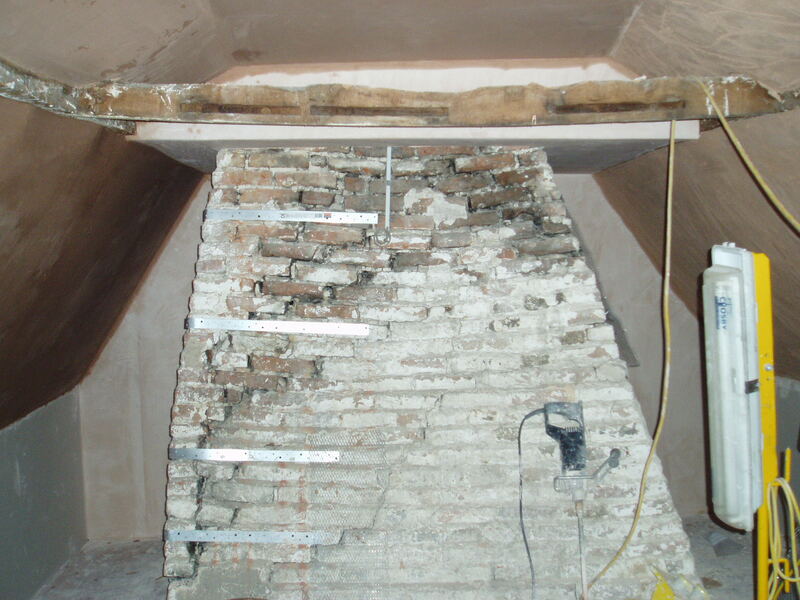 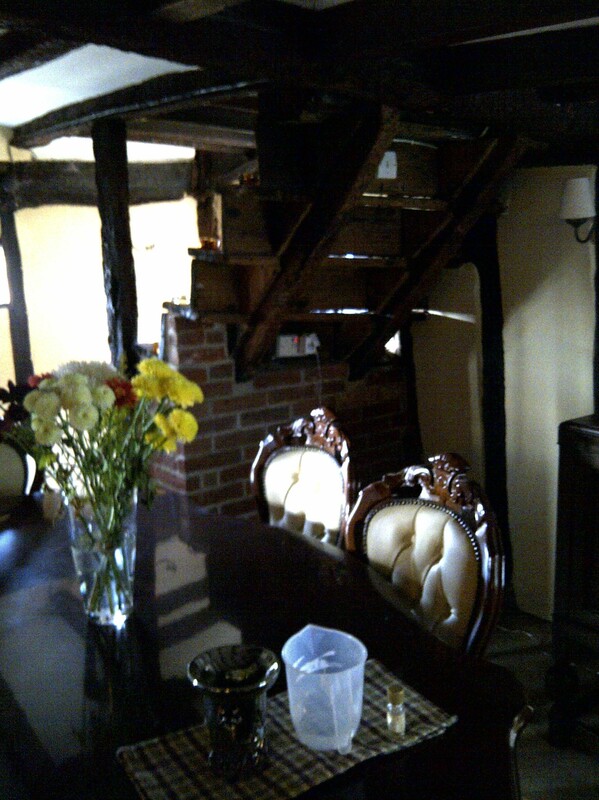 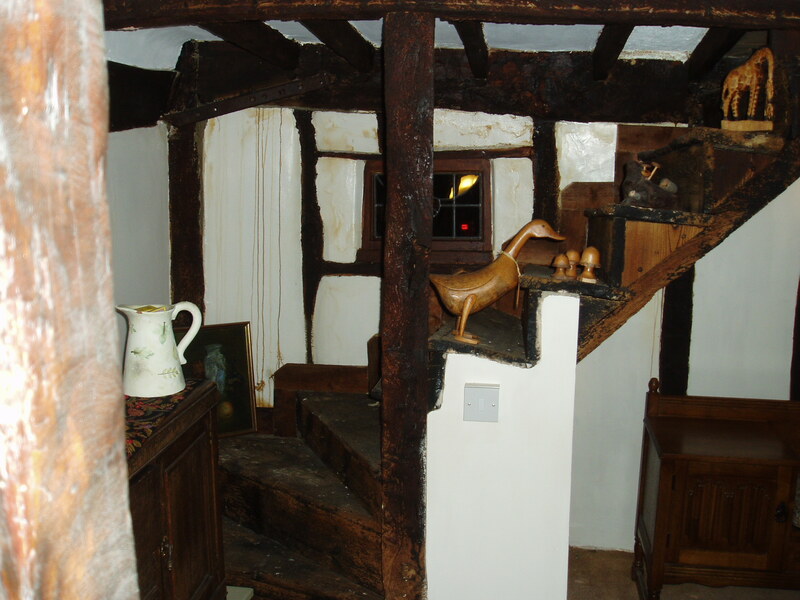 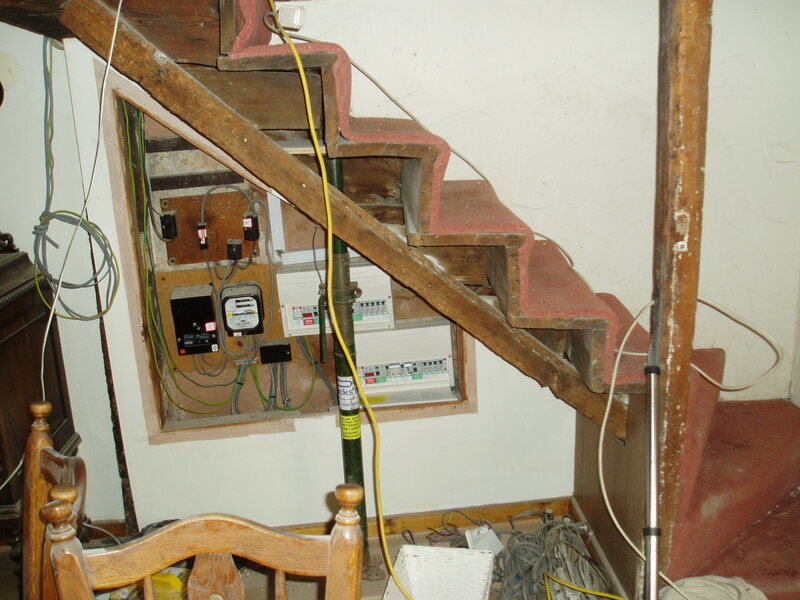 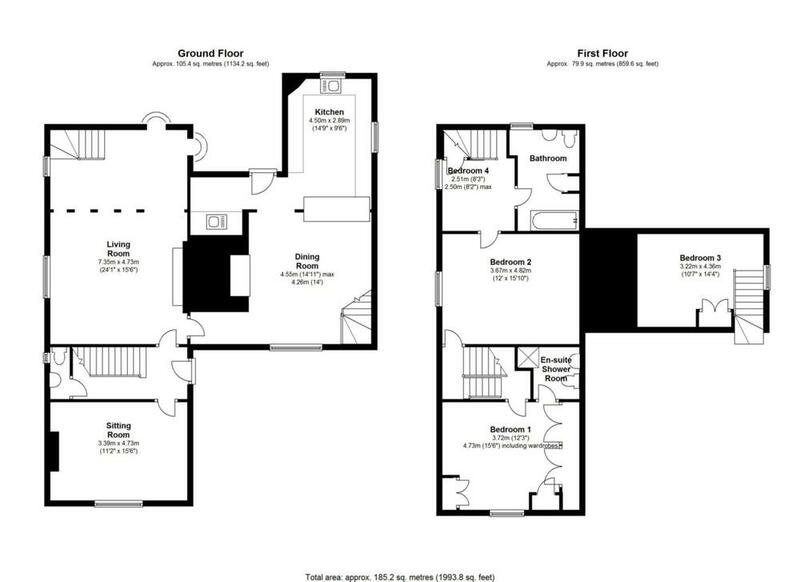 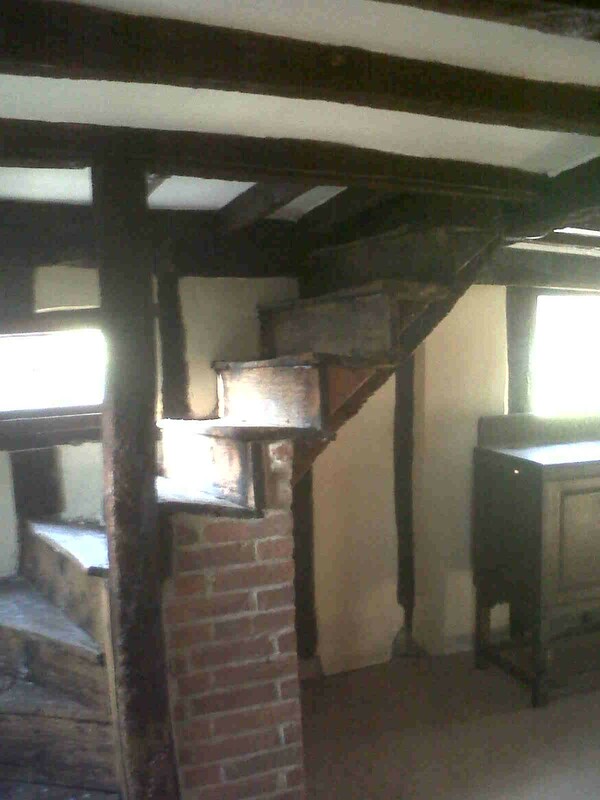 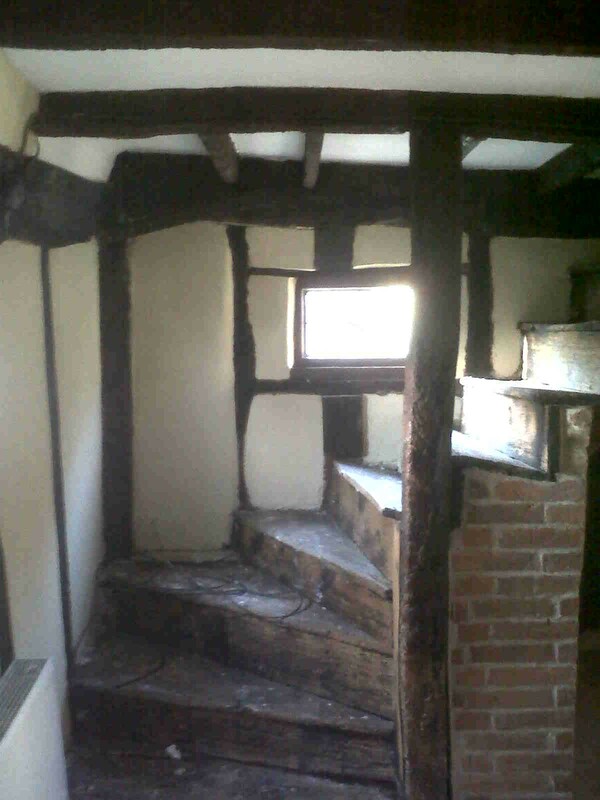 Conversion of the 'wonky room', including the staircase from the dining room thereto. 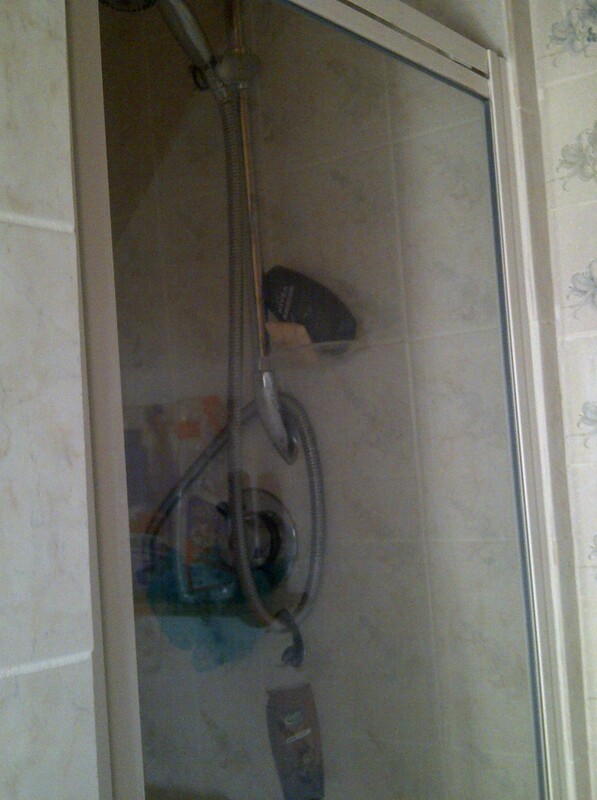 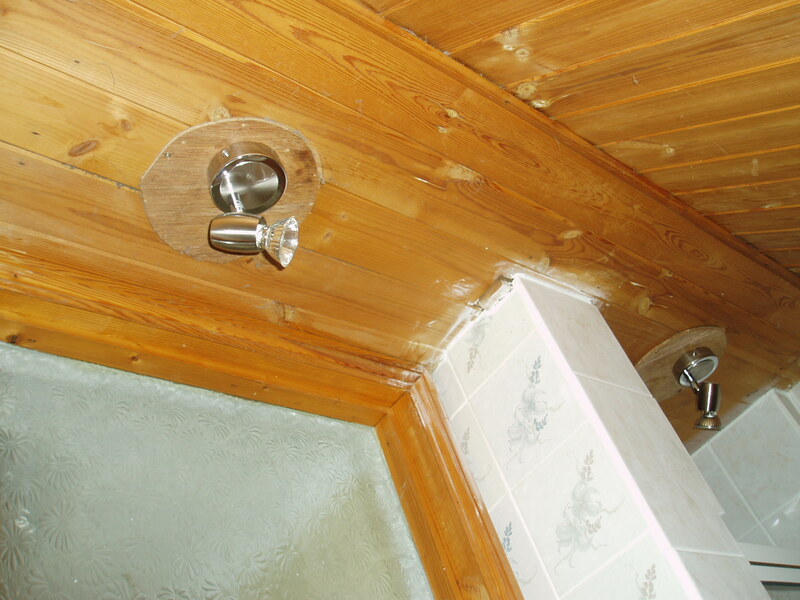 Conversion of the shower room. 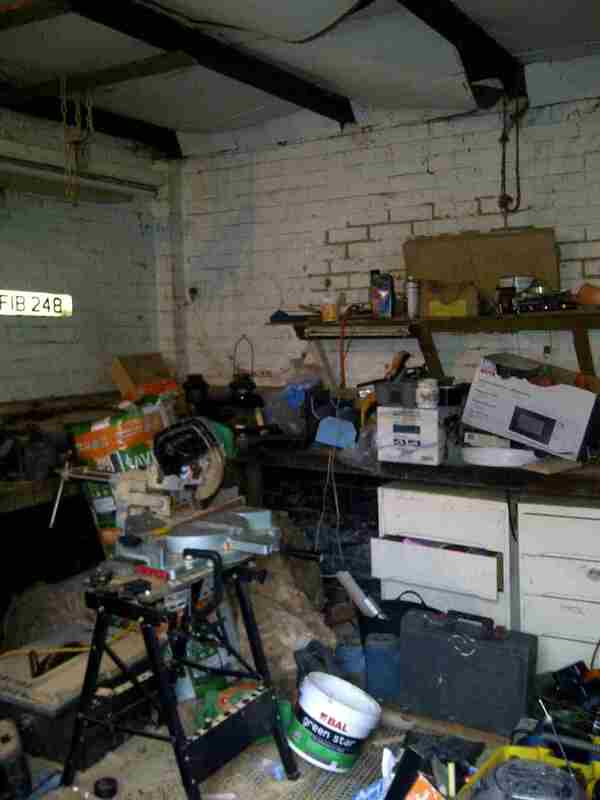 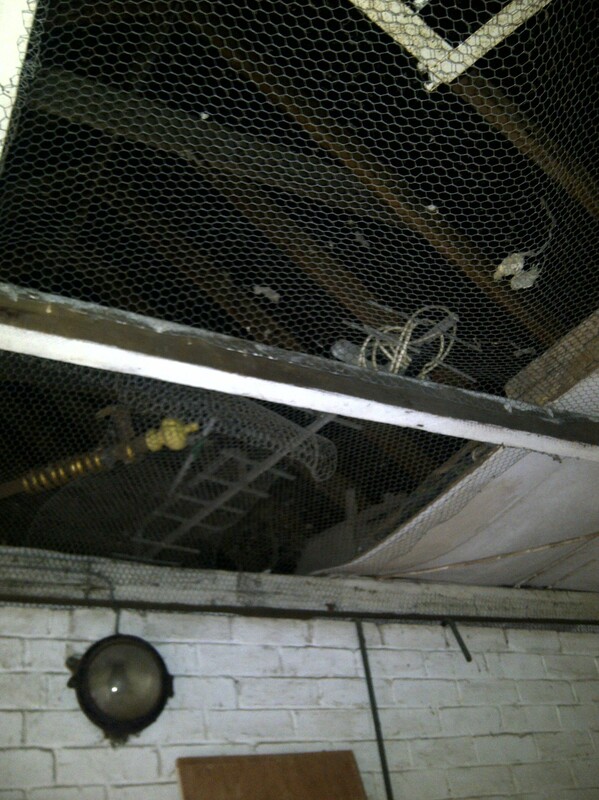 This had been a utilities room, presumably created in the 1980s during the kitchen extension. 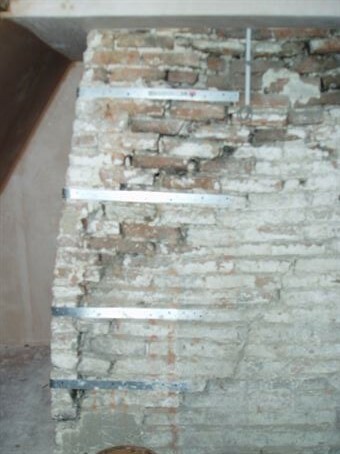 The 'staircase to nowhere', prior to plastering its wall. 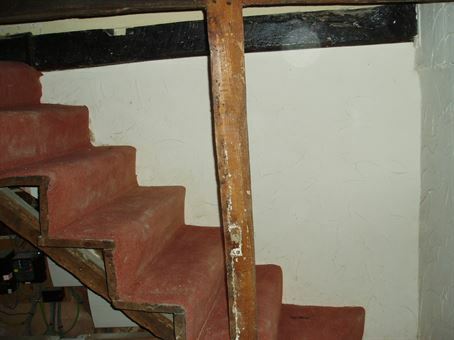 The staircase was removed in November 2018 as part of the repairs to the back wall. 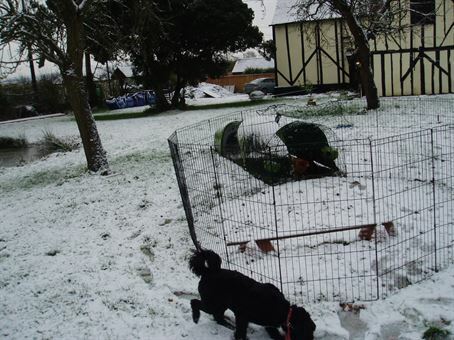 A couple of photos taken in the snow round about the time we exchanged contracts. I raised the question of why the snow had melted at the front, but not at the back. 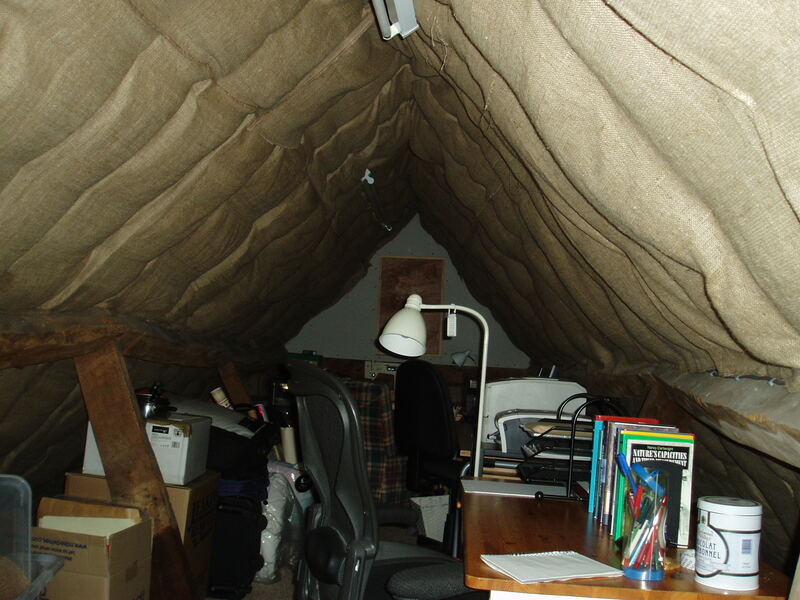 The explanation was that the insulation is on the ceiling at the rear, but on the floor at the front, so warmer air got through to the front loft. 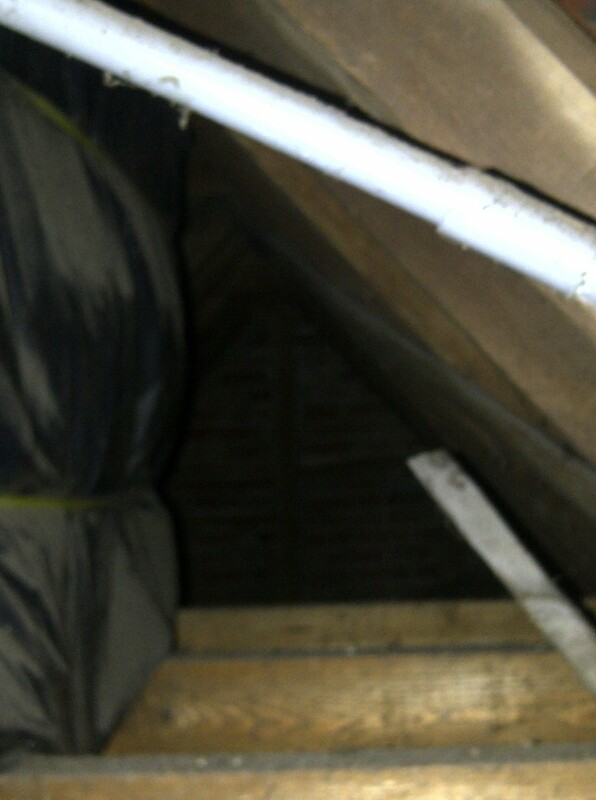 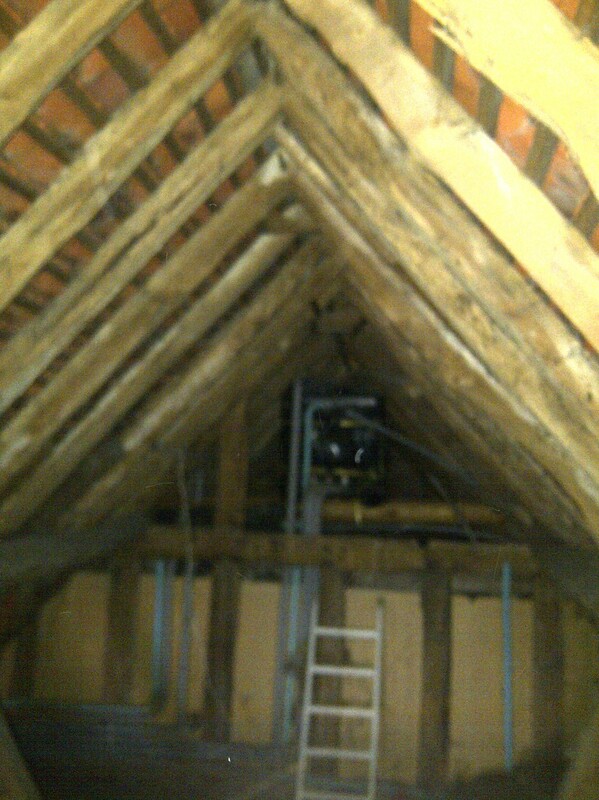 We now have a partition between the attic at the back and the loft at the front, so this problem is now fixed. 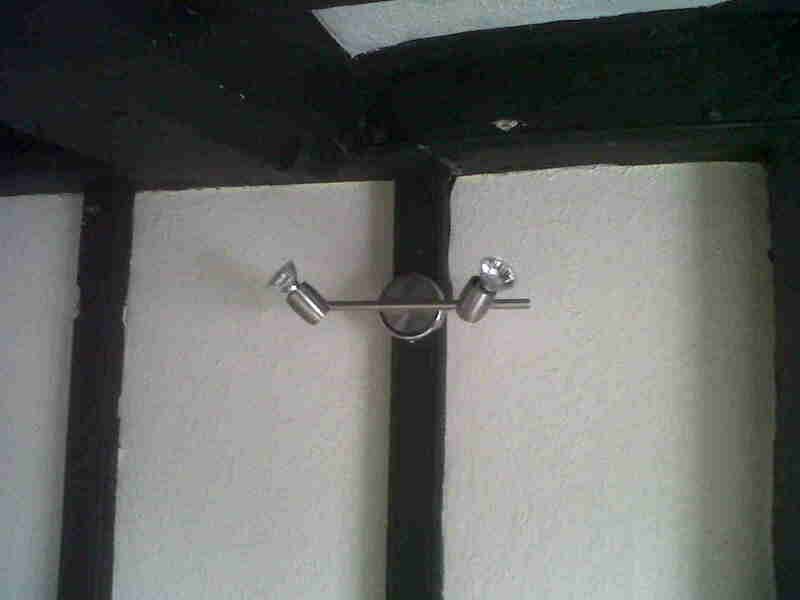 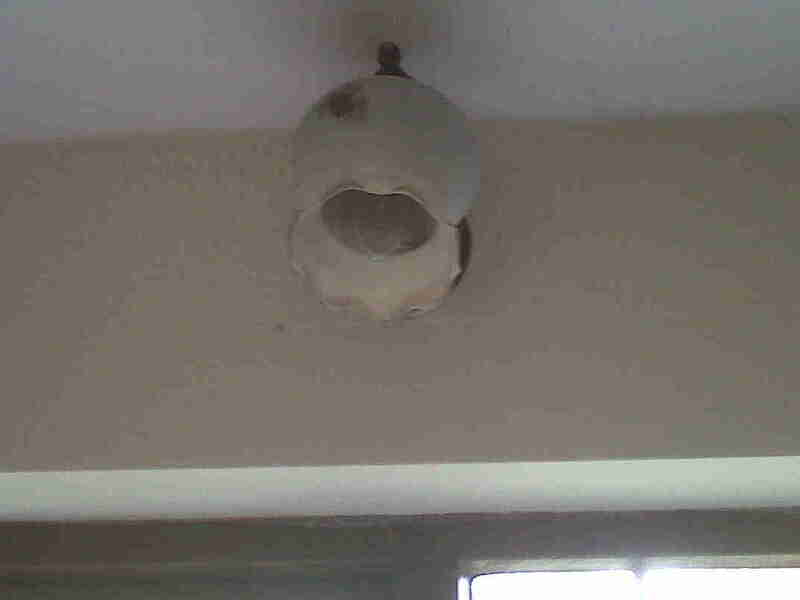 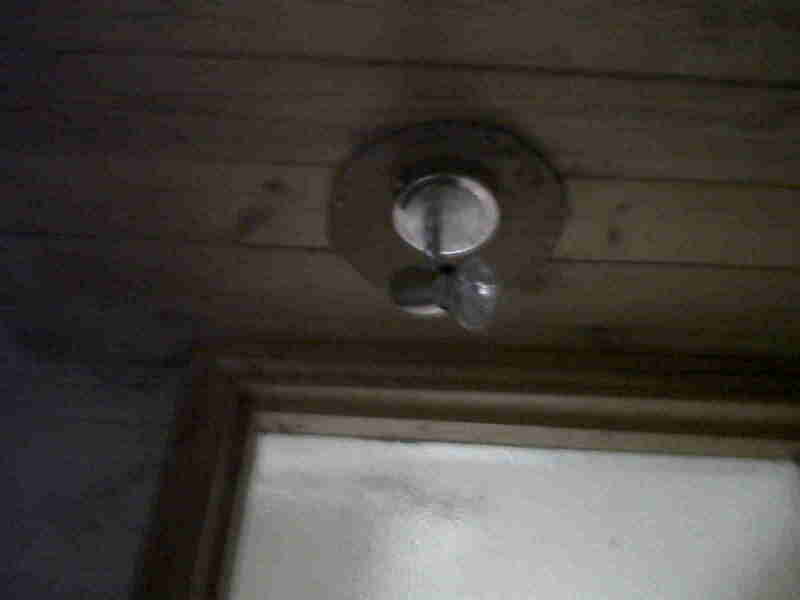 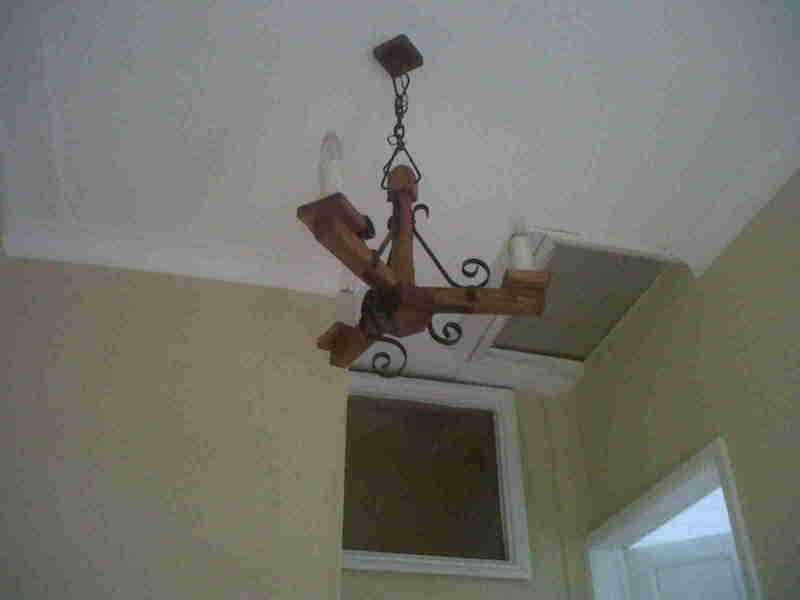 Various dreadful light-fittings that we replaced as soon as we'd purchased the property. 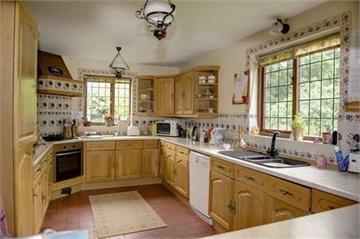 I think these must have come from an estate agent's website, as they match those from the glossy brochure. 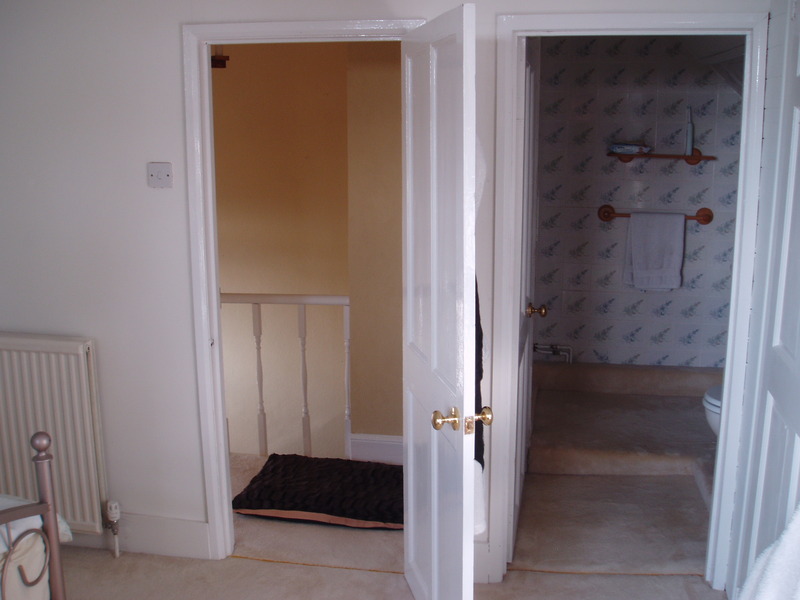 They are very professionally done, and certainly make the property look a lot more impressive than it then did. 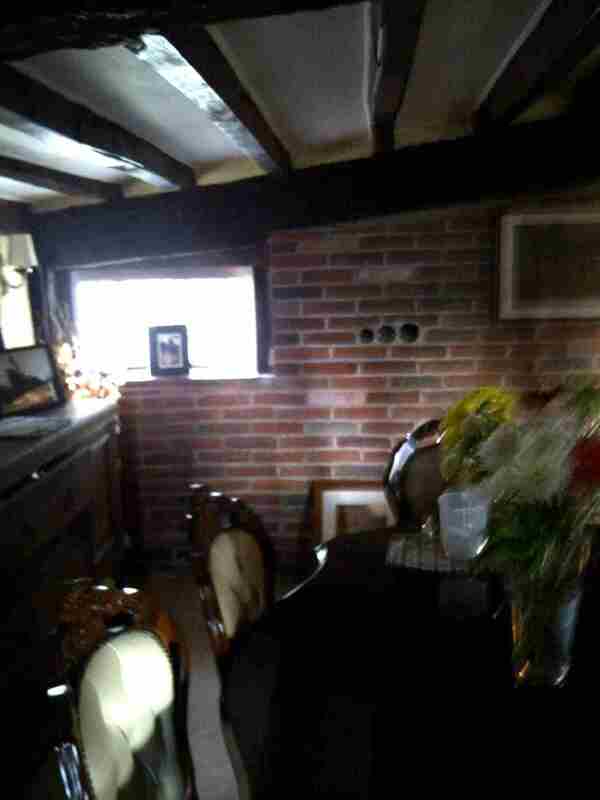 Some of the photos muust have been very tiny on-screen, and don't expand well in the grid below. 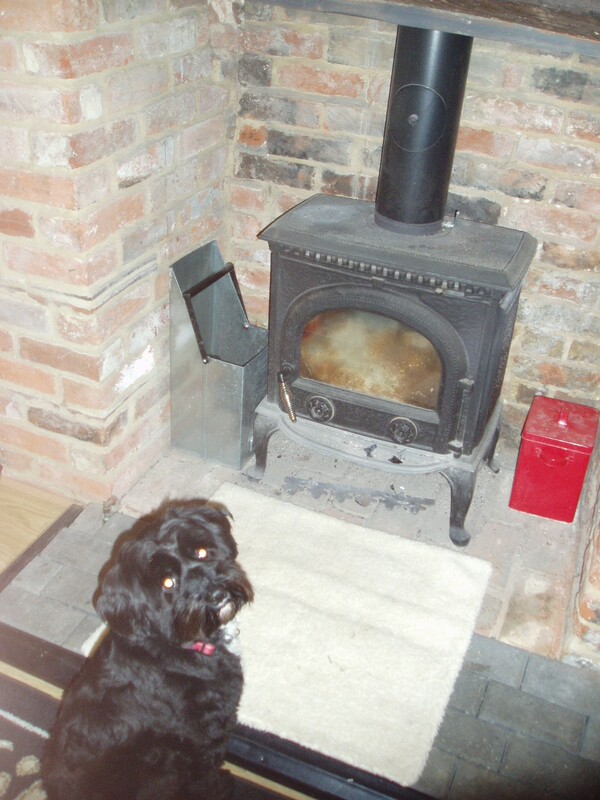 See Zoe Napier (which no longer contains the photos, I don't suppose!). 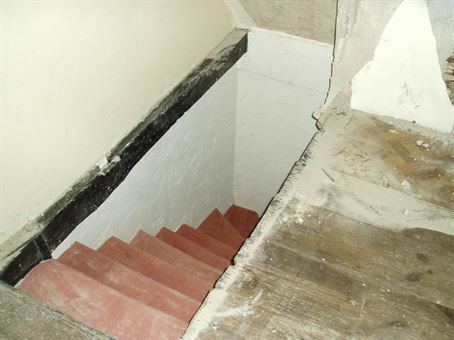 Terry Gregson's photos taken as part of the pre-purchase Survey. 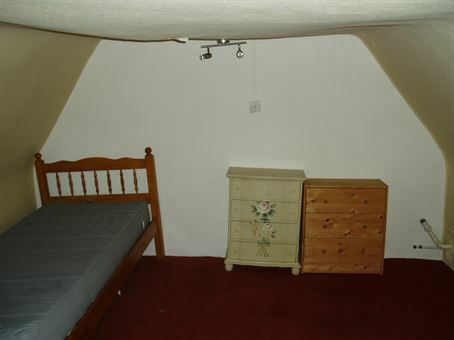 Presumably this selection shows what he thought was important. As such, some - eg. those of Terry Selway's retained property - are rather eccentric. There are a few gaps in the sequence of photo names - there are 51 photos while 57 might be expected - but I've not knowingly omitted any. 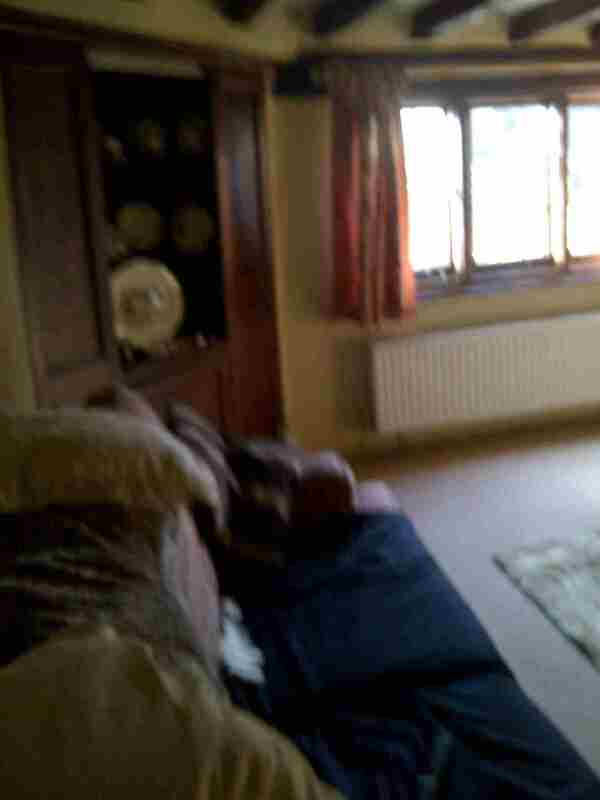 I've rotated the photos without cropping them, so you can view them without holding the screen sideways. Many of them are rather fuzzy, especially when clicked to view expanded, but this fuzziness isn't down to me. 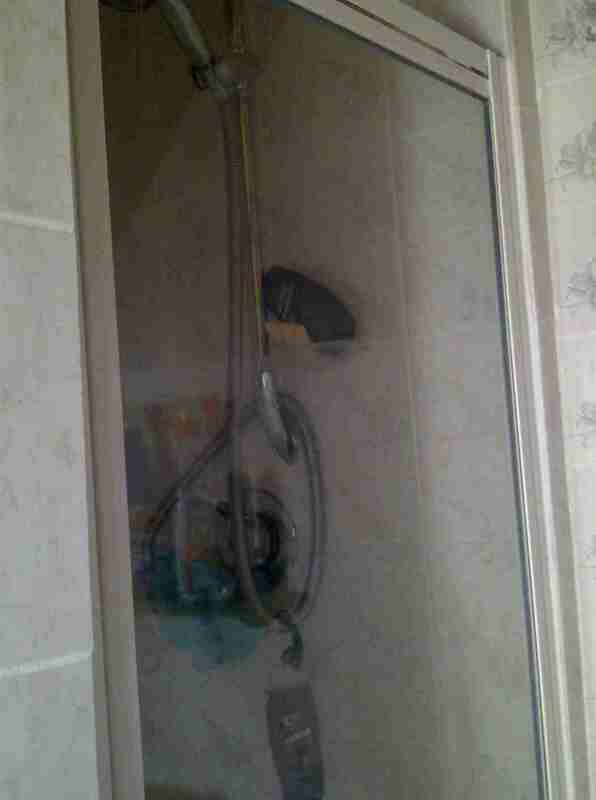 It's a shame as it makes some of the information rather vague. 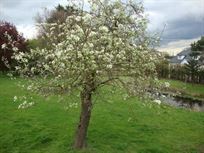 I will add comments against each photo in due course. 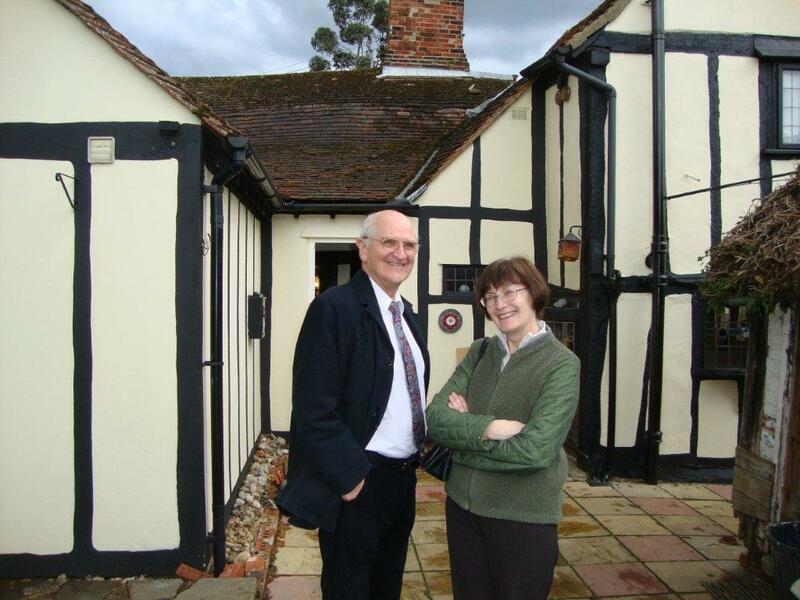 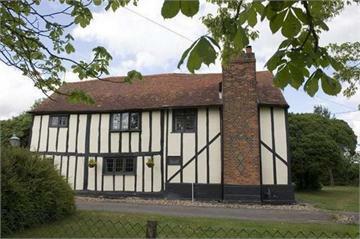 This photo shows the house in 1999, and is taken from the - soon to be retired, it seems - Images of England website. 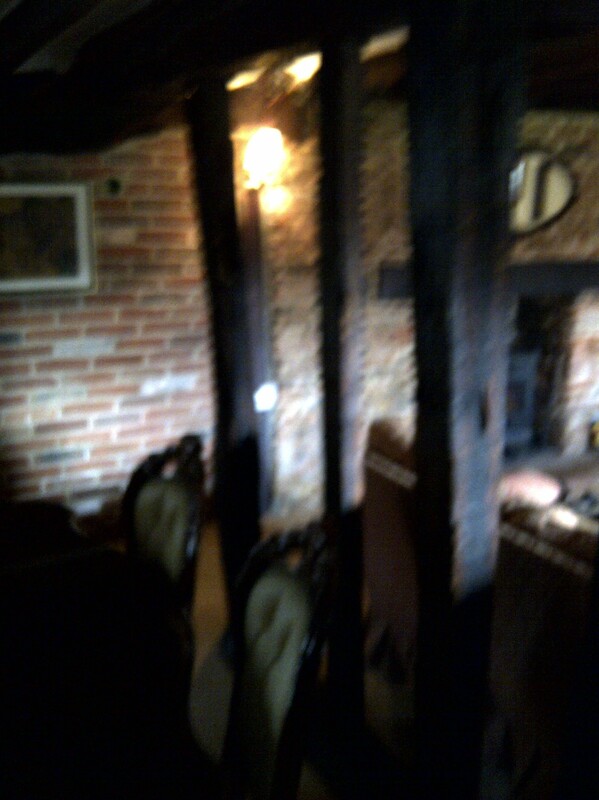 The Ivy Room to the left is as wild as ever. 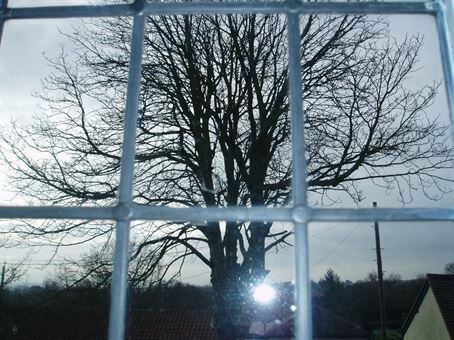 You'd take it to be a tree if you didn't know otherwise. 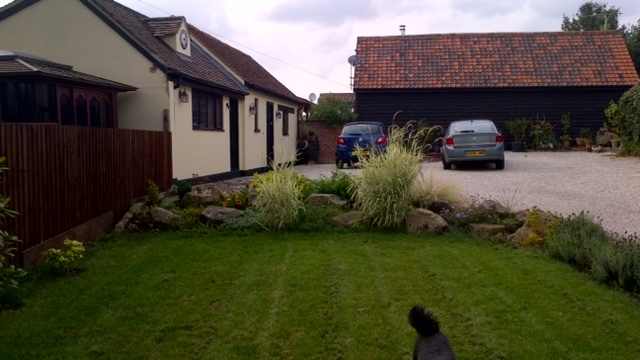 The privet hedge to the right has now been grubbed up and replaced with a rockery. 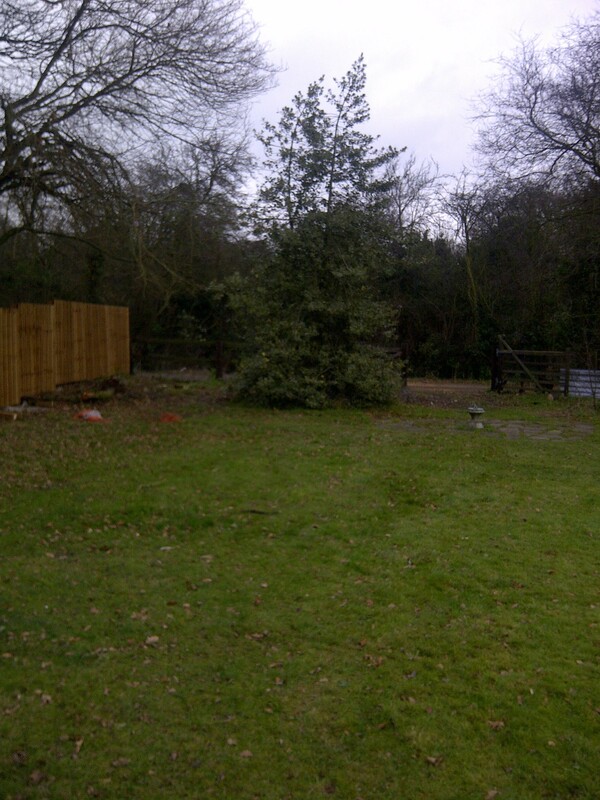 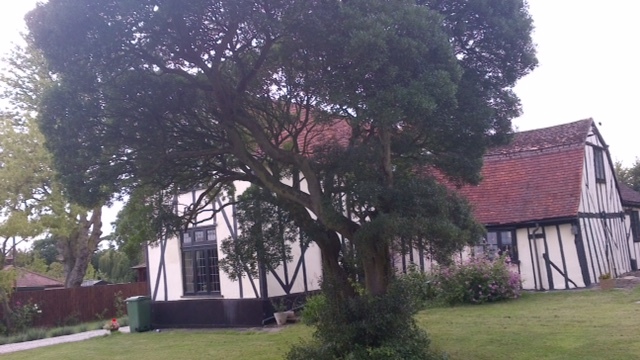 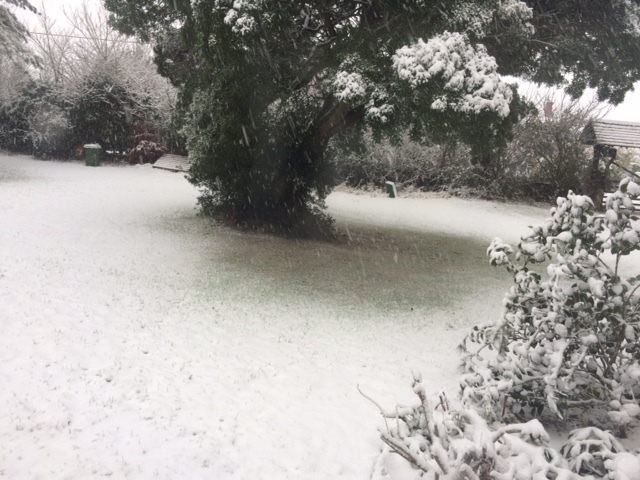 The now erased eucalyptus tree and the holm oak next the drive are visible peeping over the hedge. 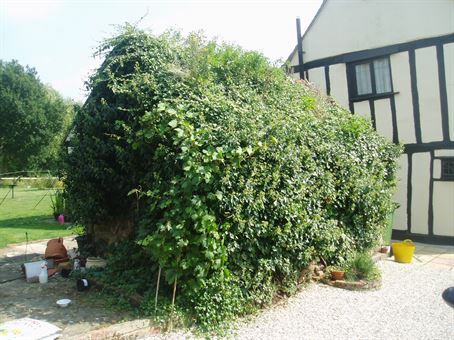 The house itself is unchanged, though the ivy creeping up the side was removed before the house was put on the market in 2011 (or maybe earlier). Random Photos yet to be categorised. 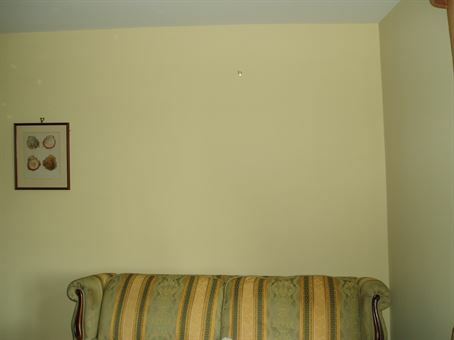 If you're using a mouse, you can hover over the image to see the date / time the photo was taken, the photo filename and the source of the photo. 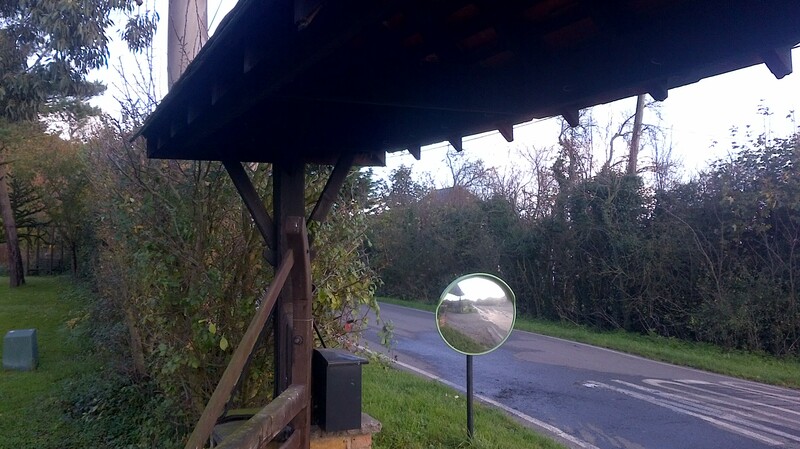 More useful narrative commentary is added where I've got round to entering it, but now appears additionally - and more usefully - below the photos. 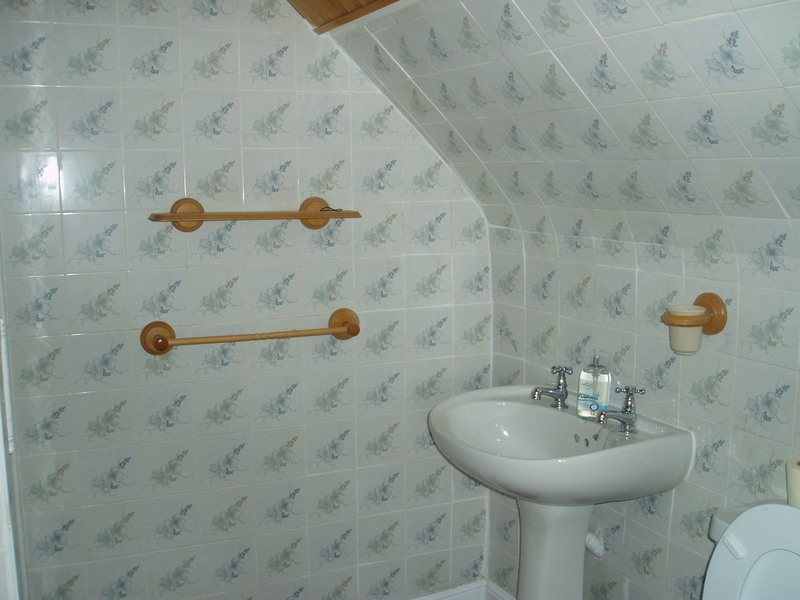 The JPEGs immediately displayed on this page are 'medium size'. 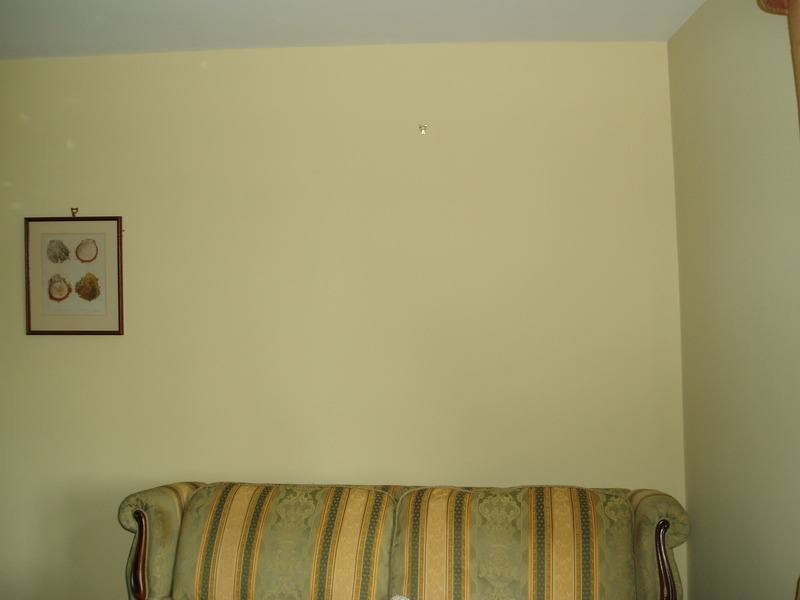 Click on the image to display a full-sized full-page photo (or sometimes just the same medium-sized one displayed full-page).